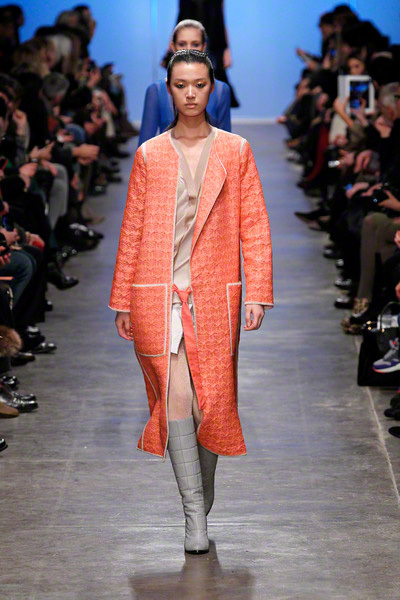 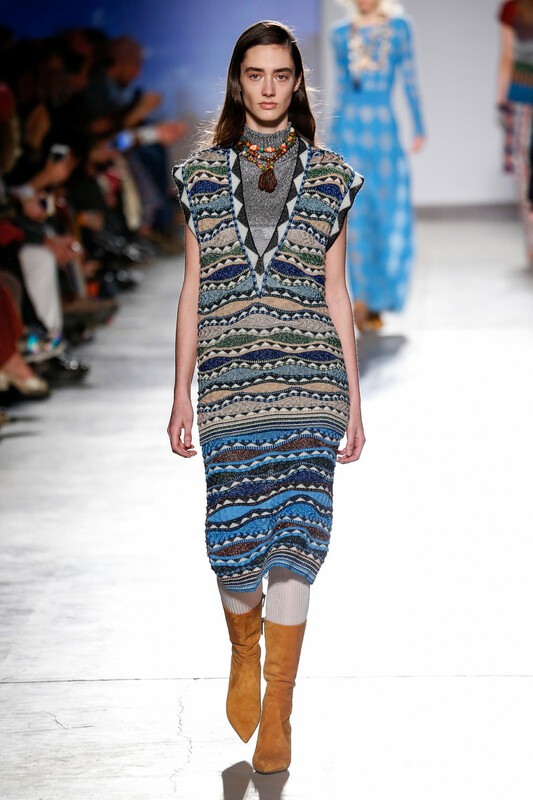 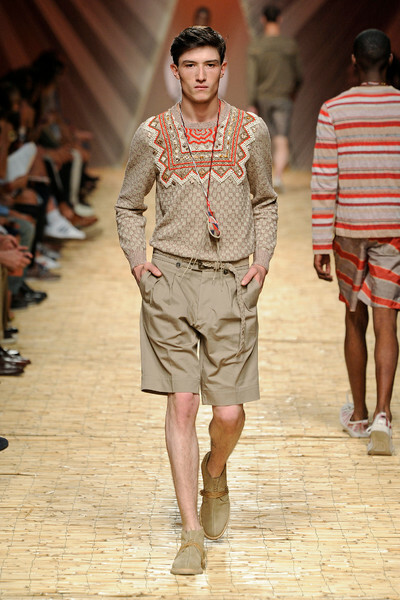 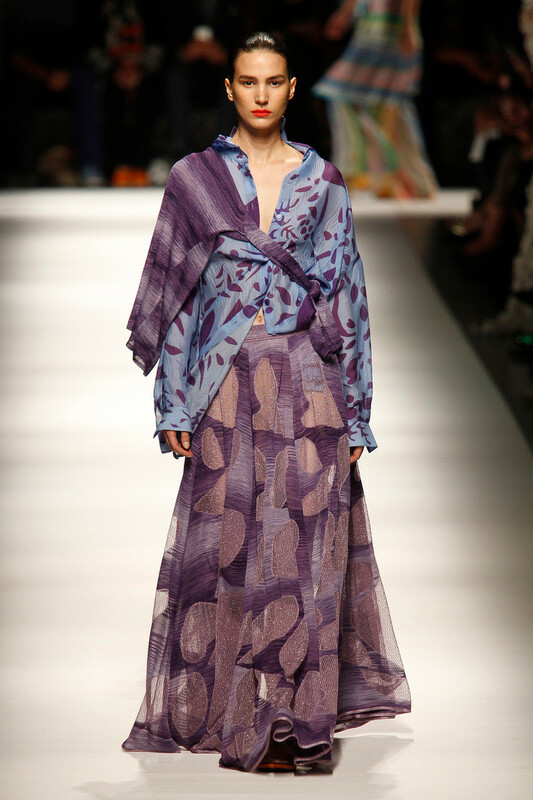 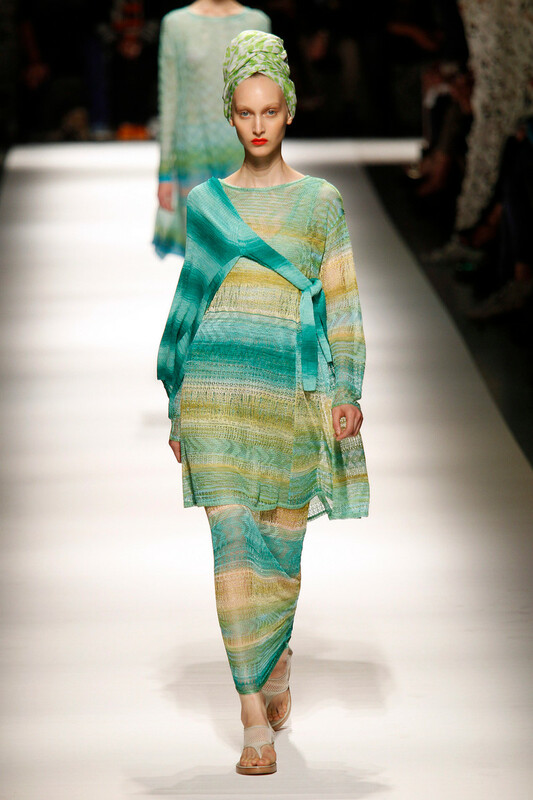 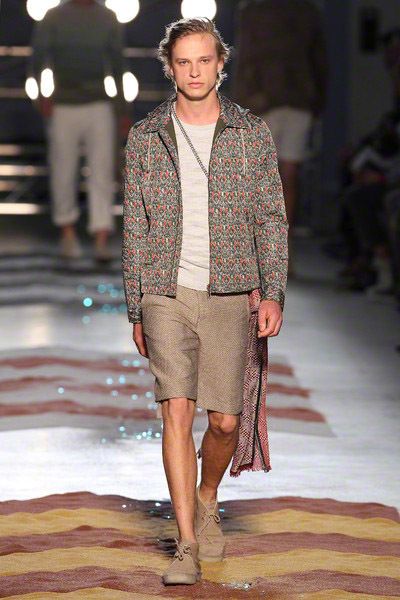 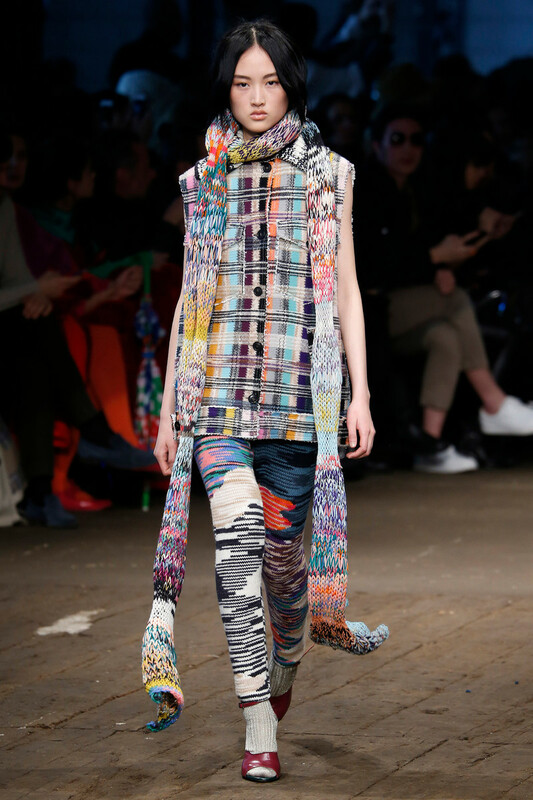 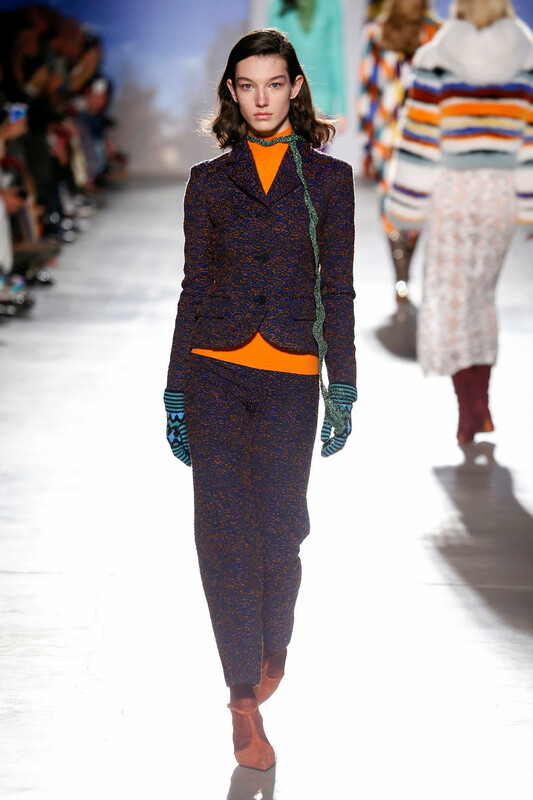 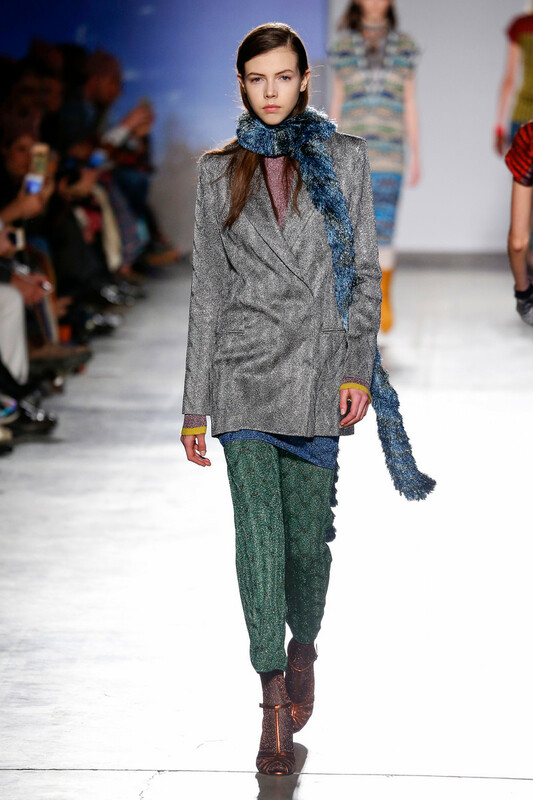 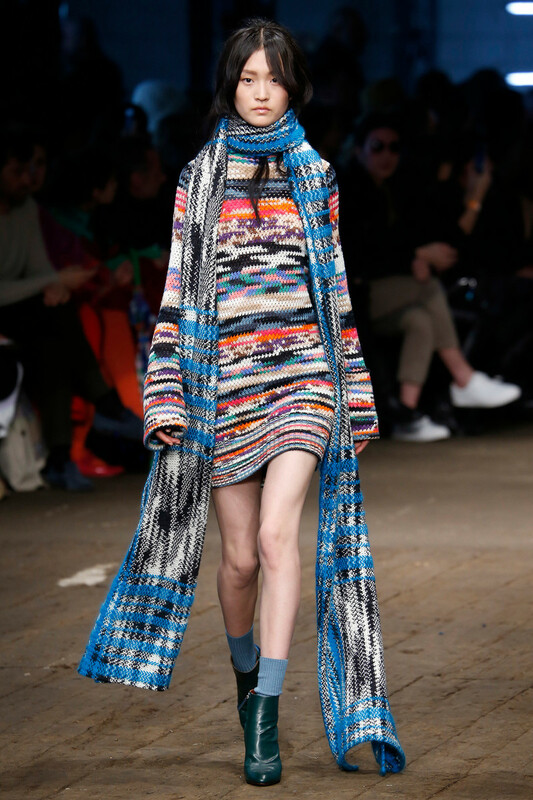 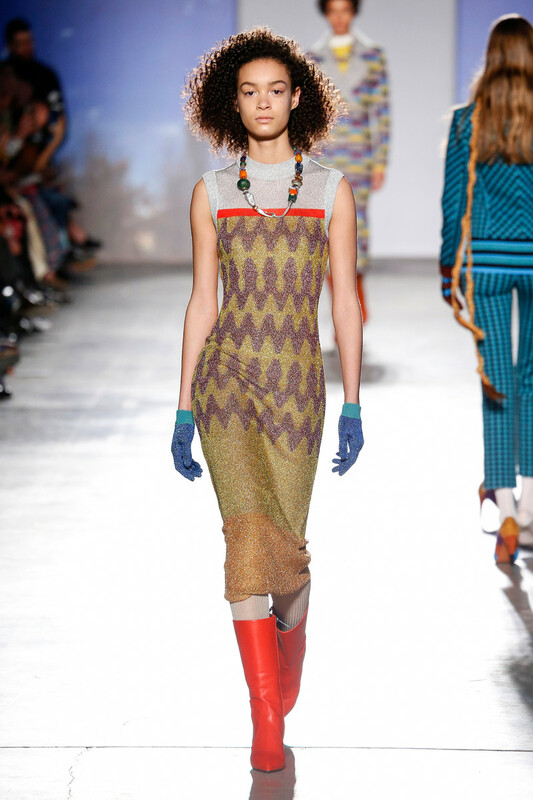 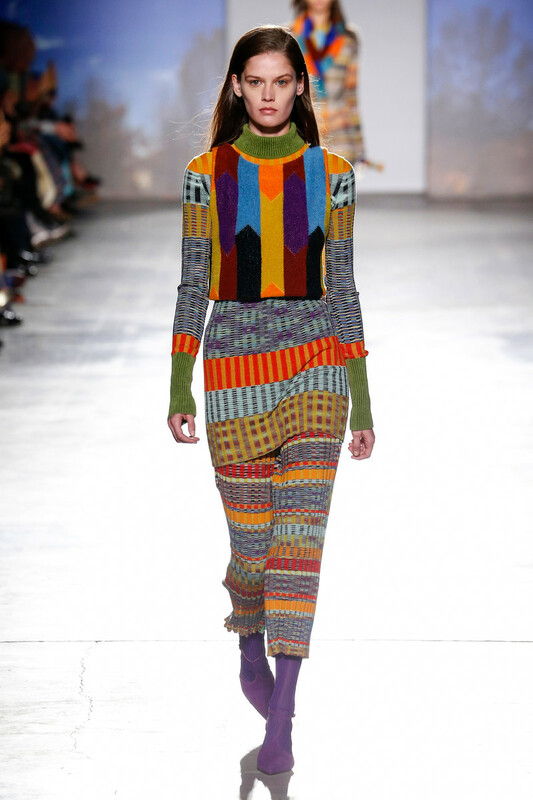 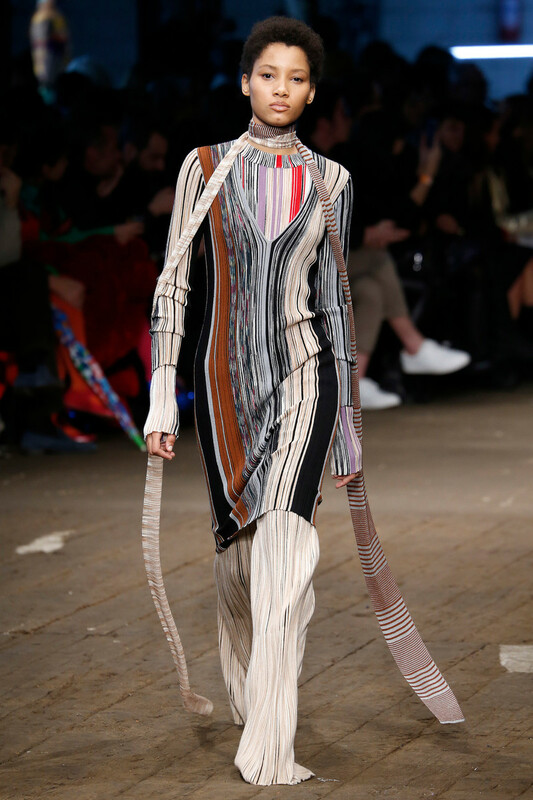 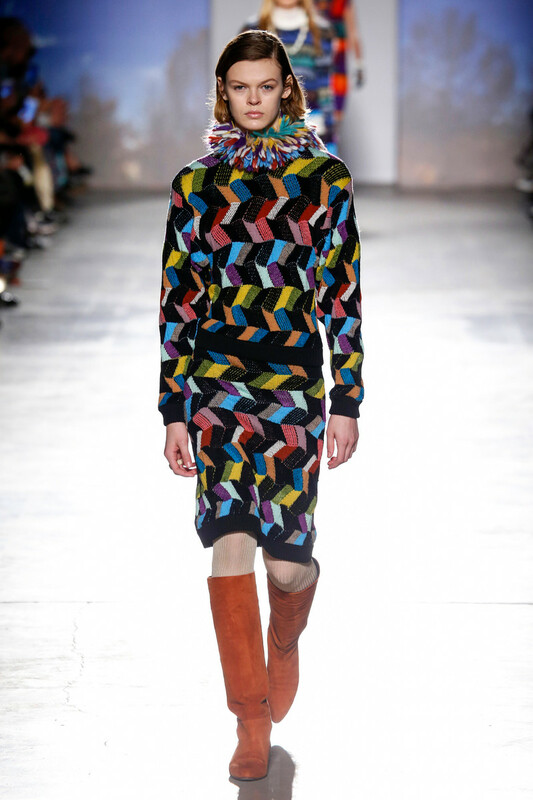 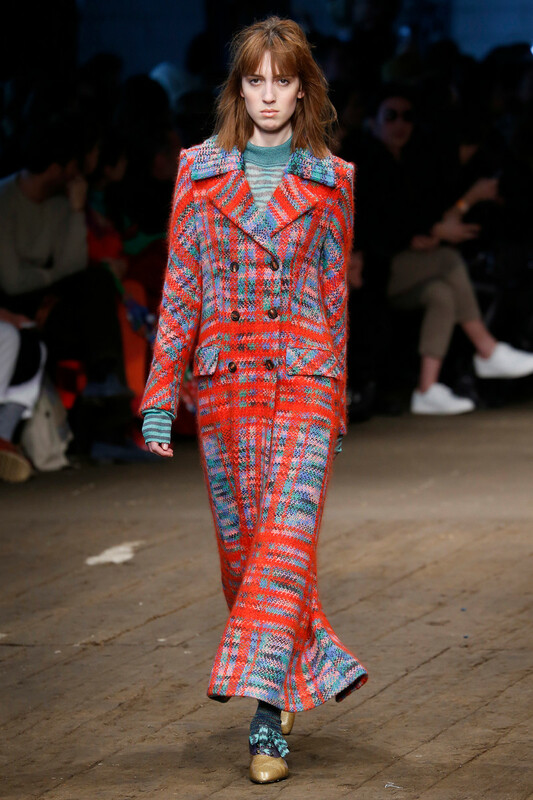 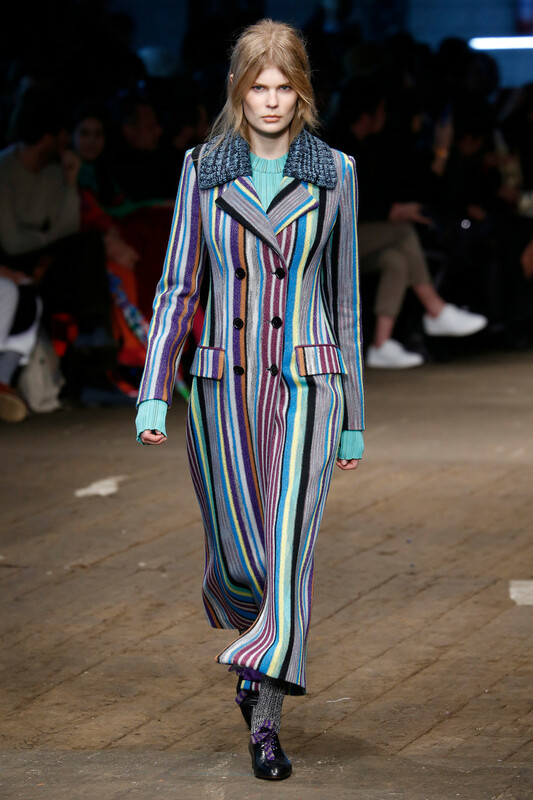 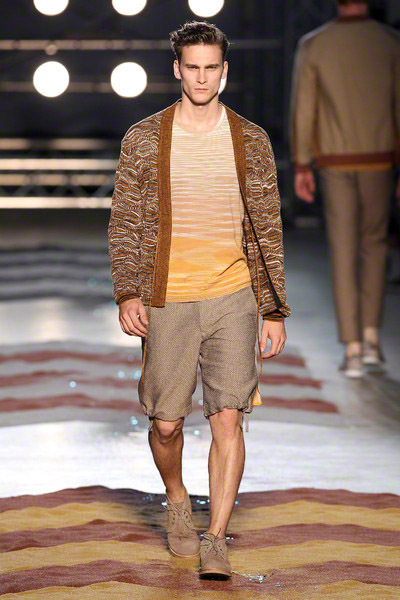 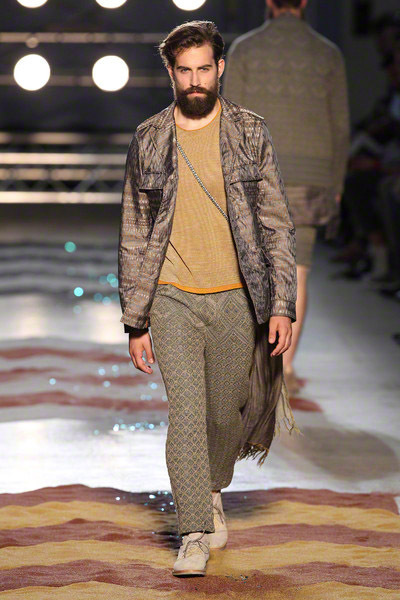 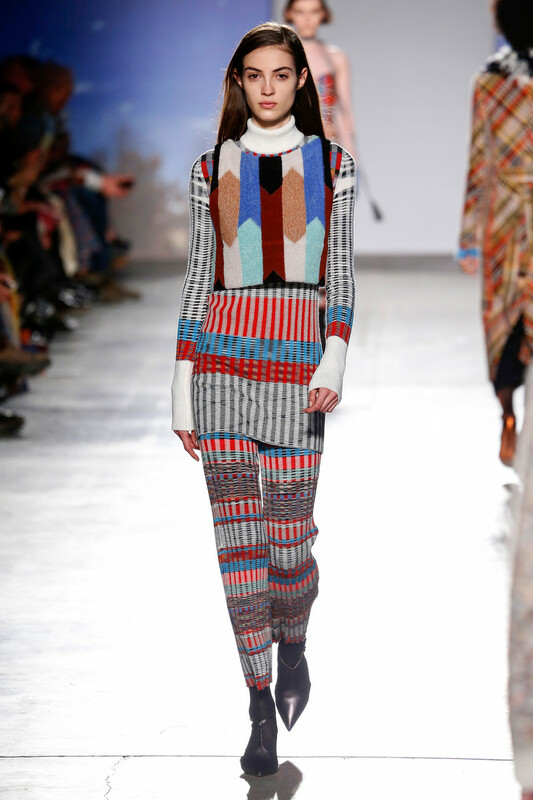 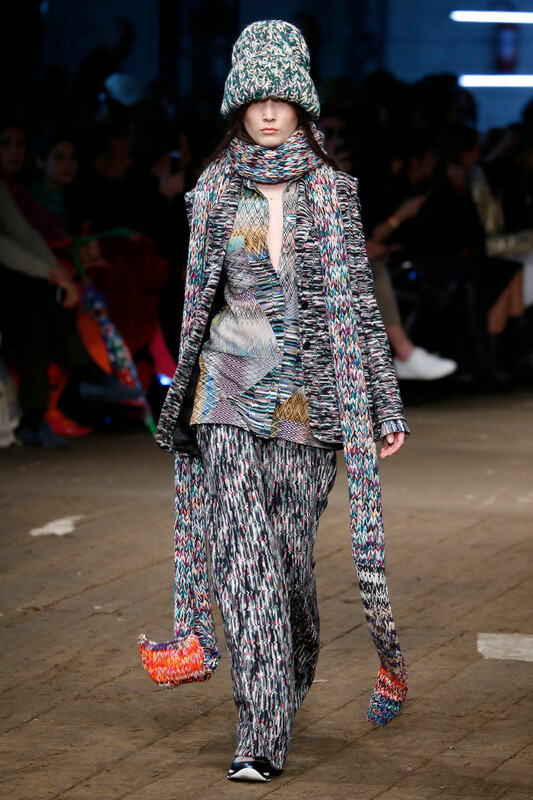 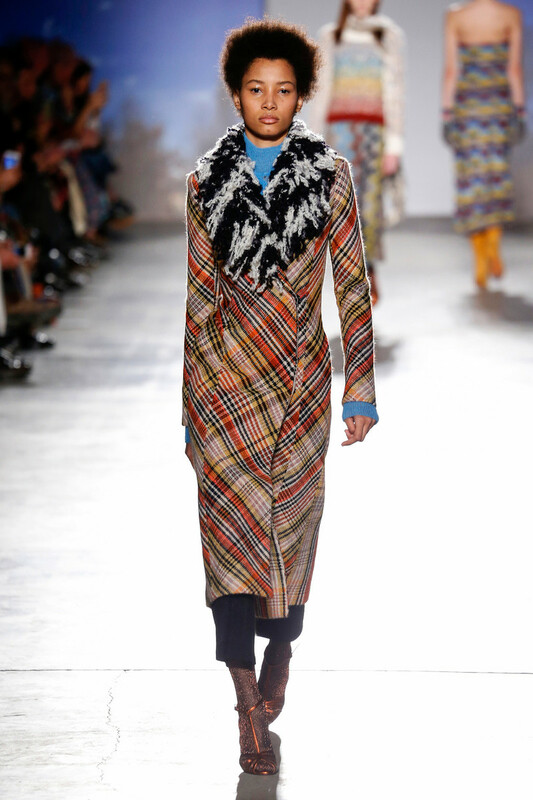 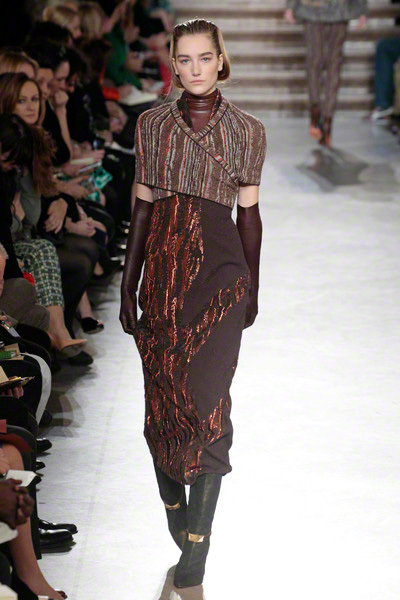 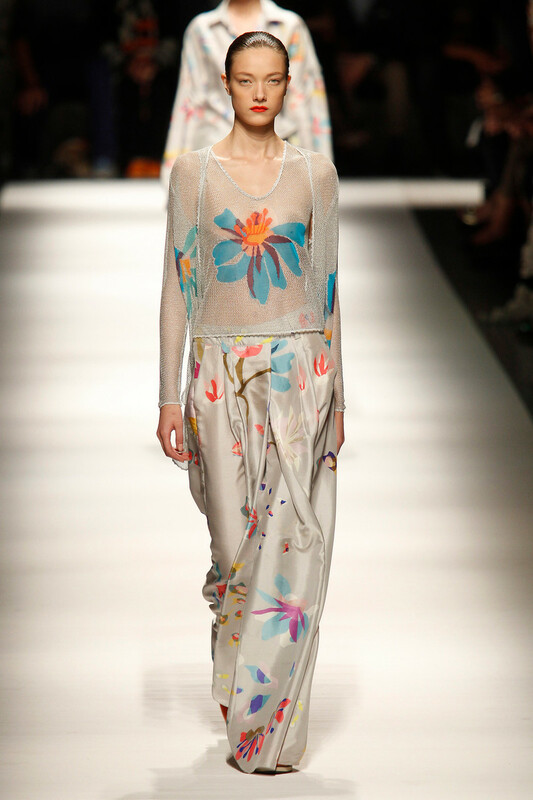 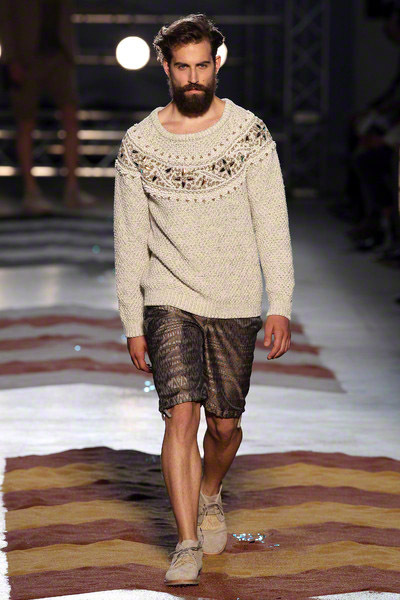 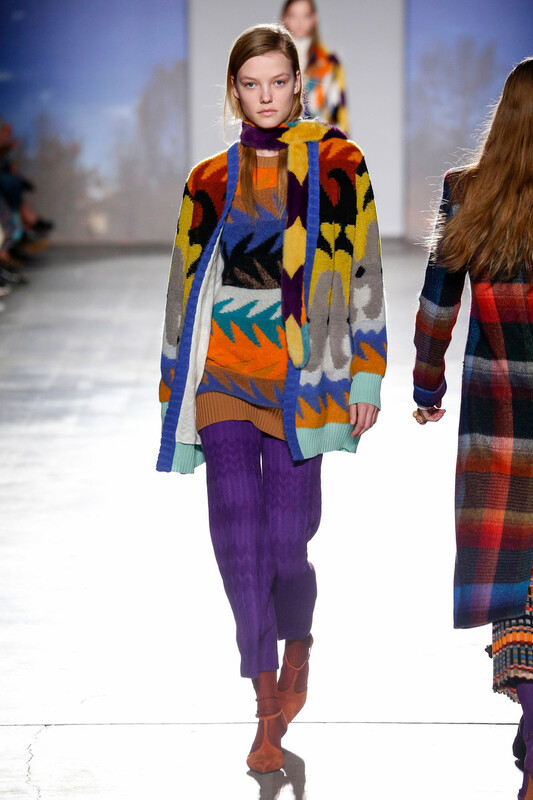 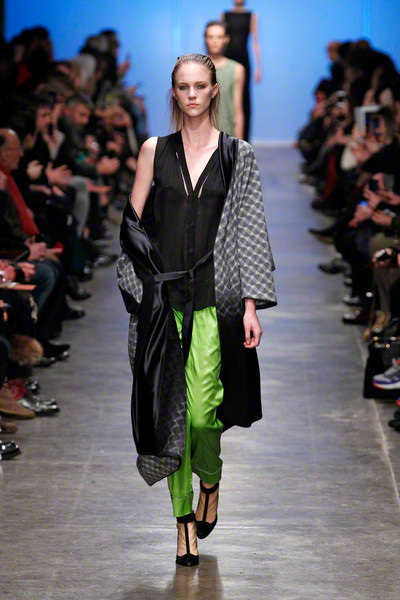 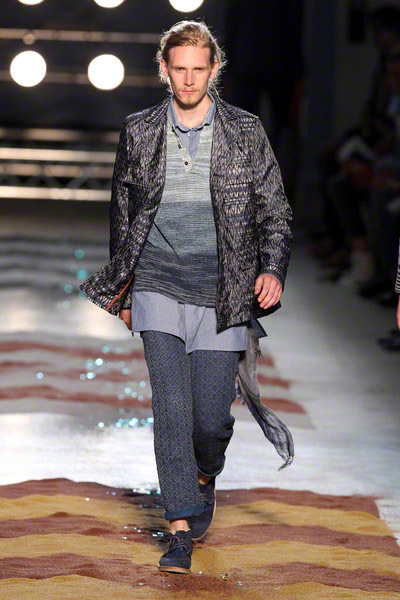 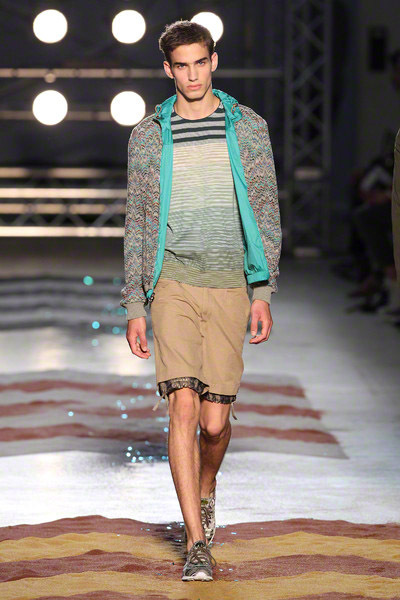 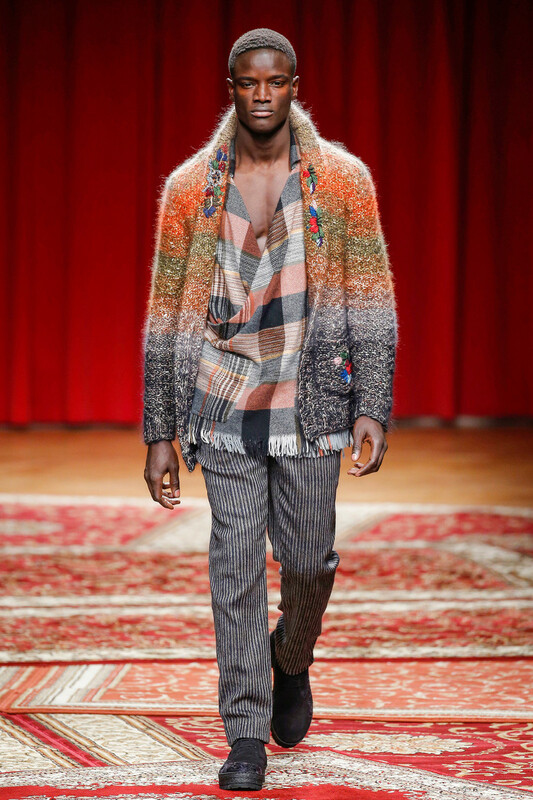 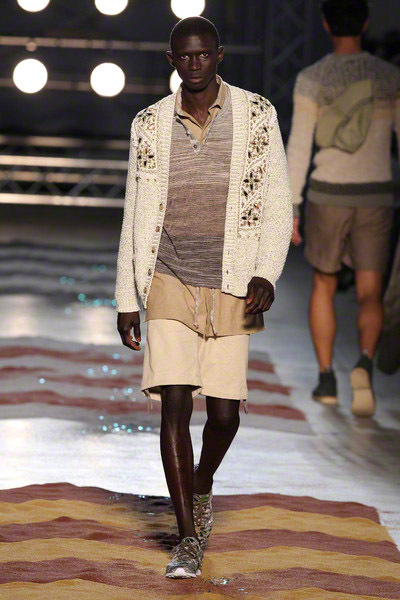 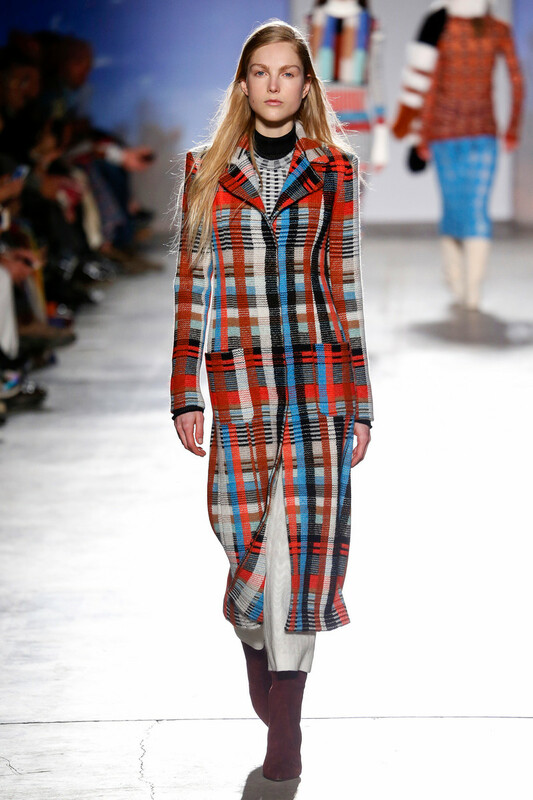 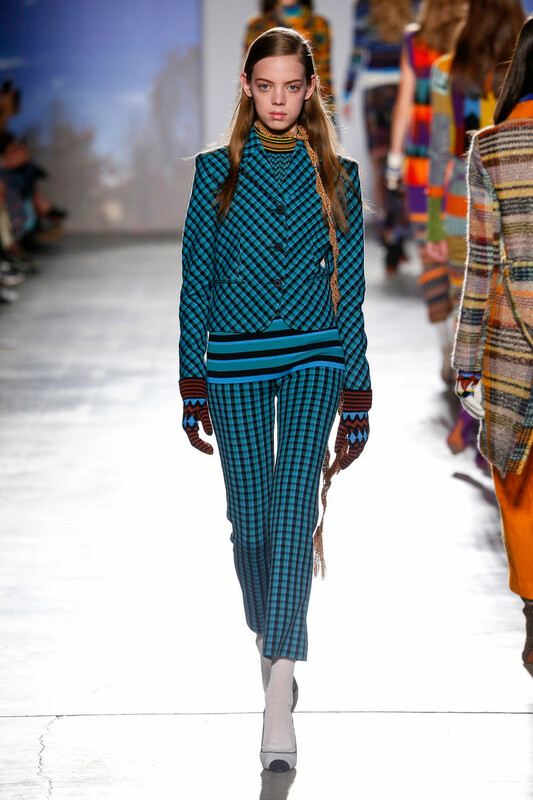 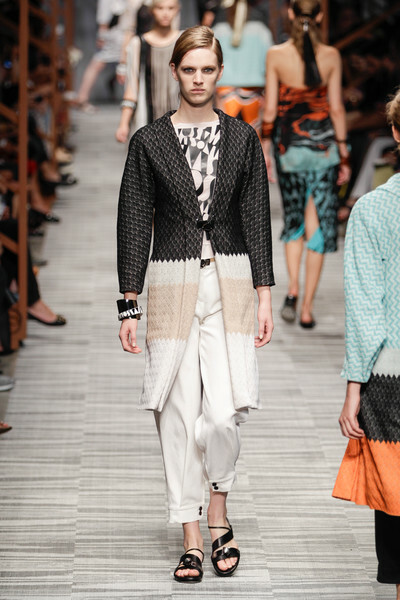 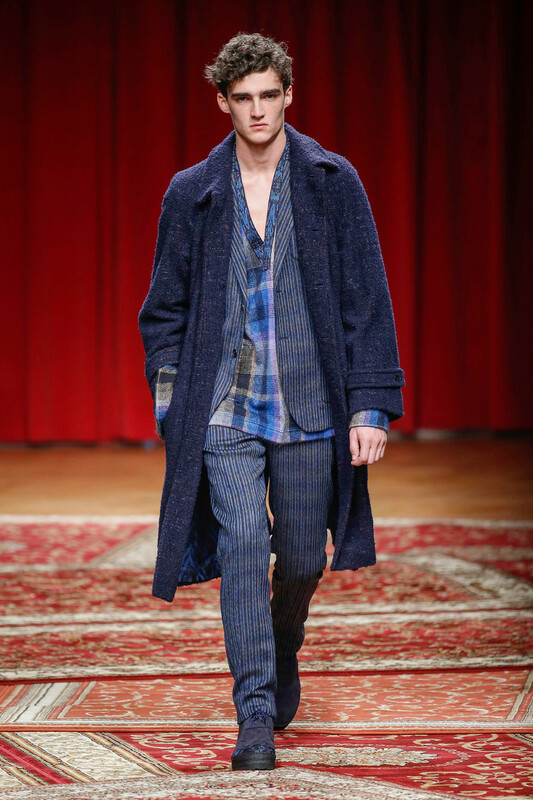 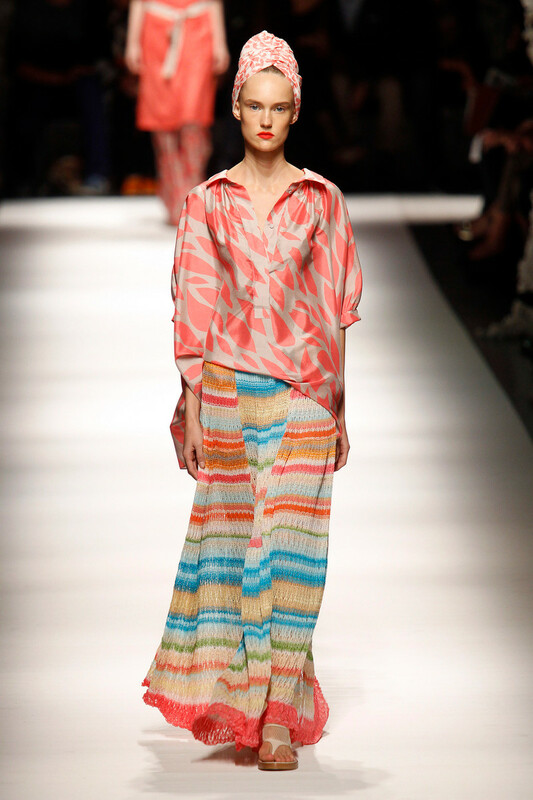 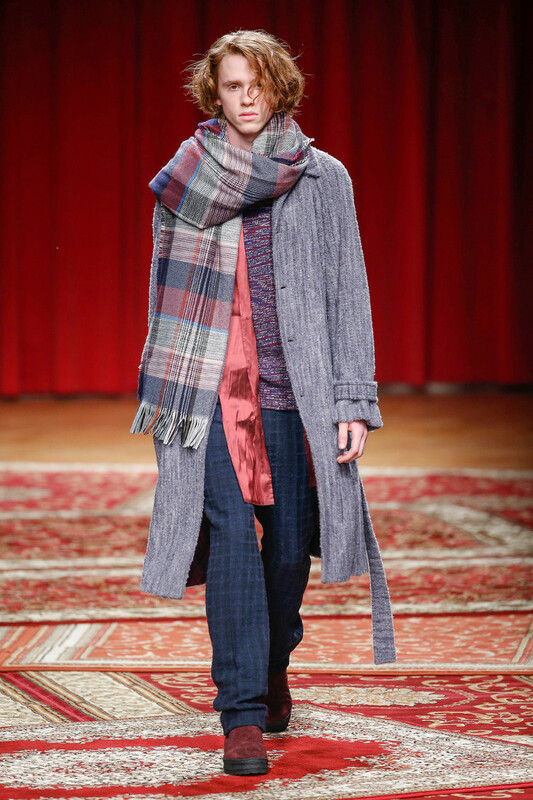 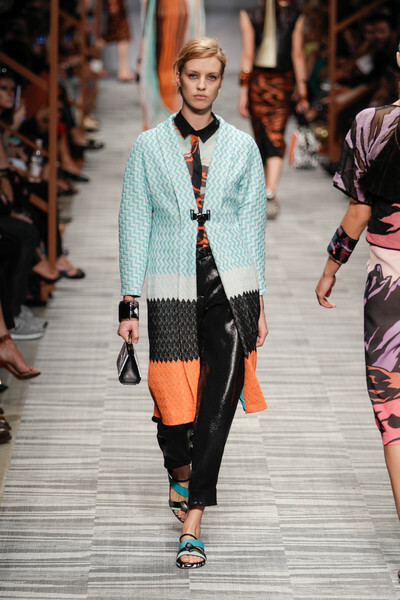 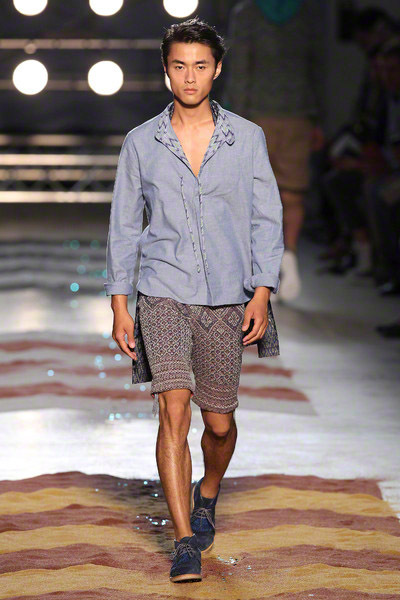 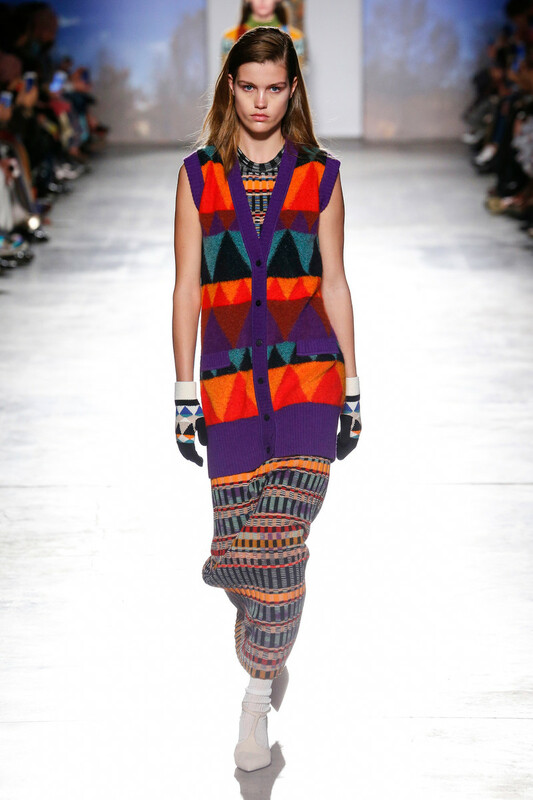 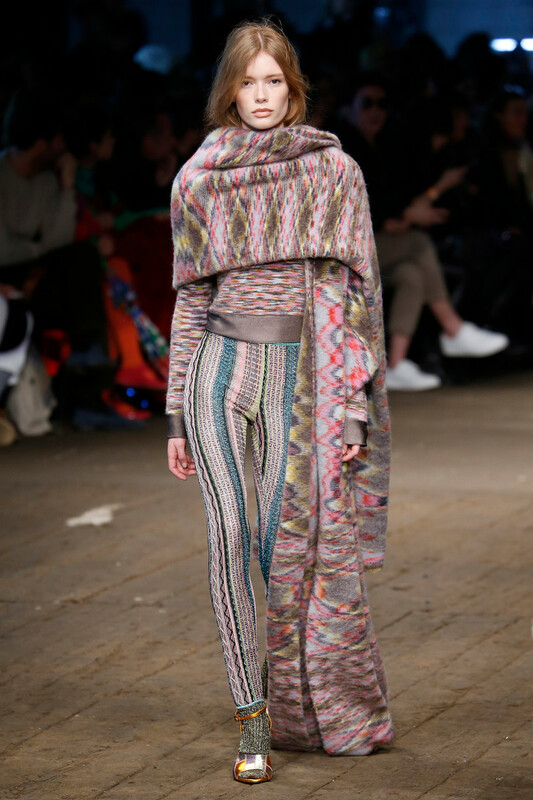 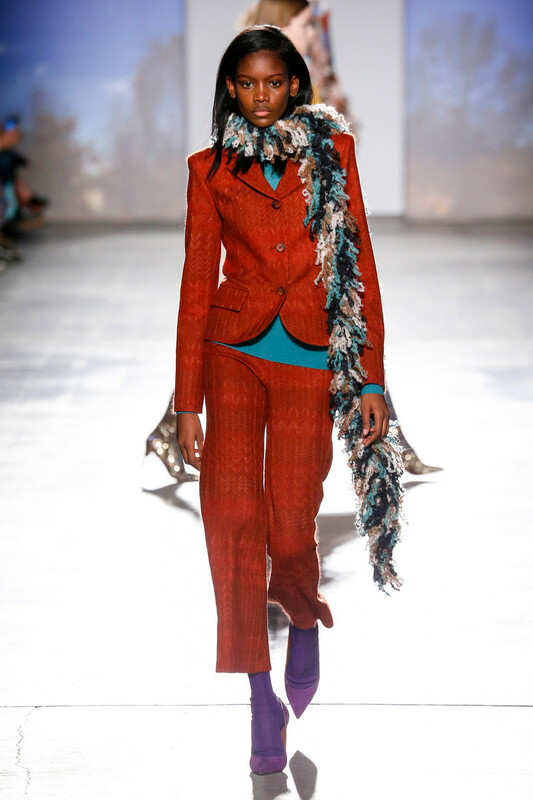 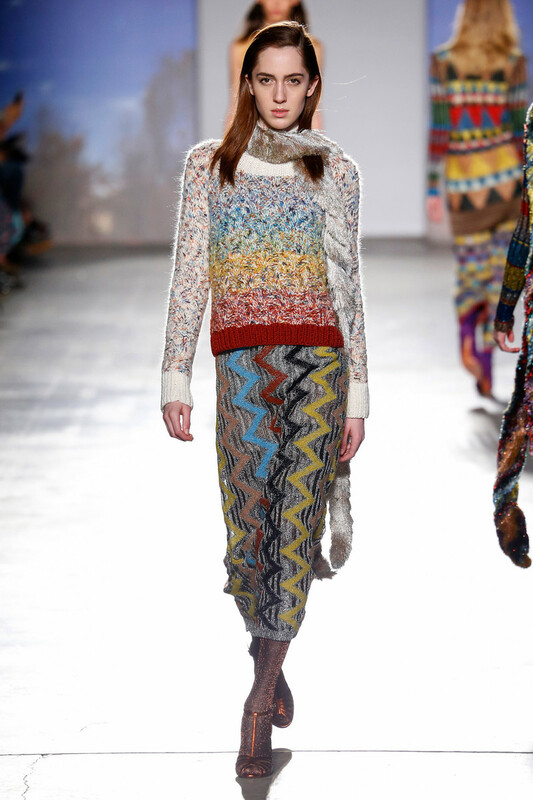 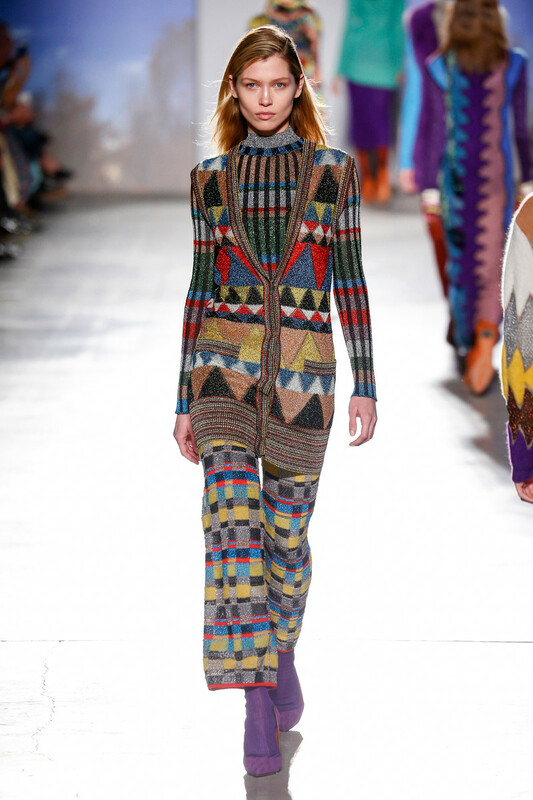 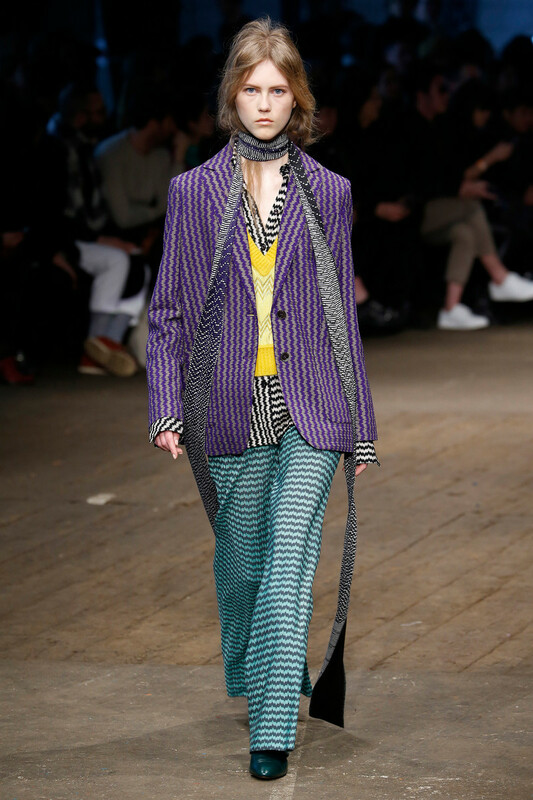 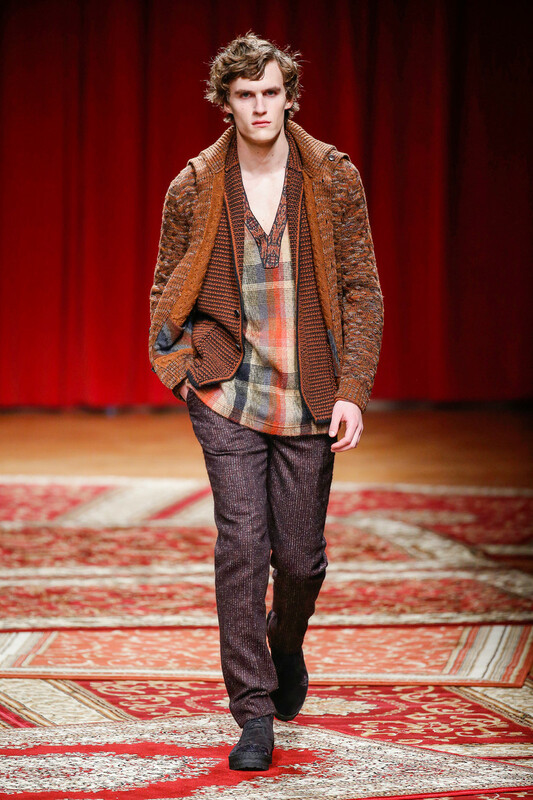 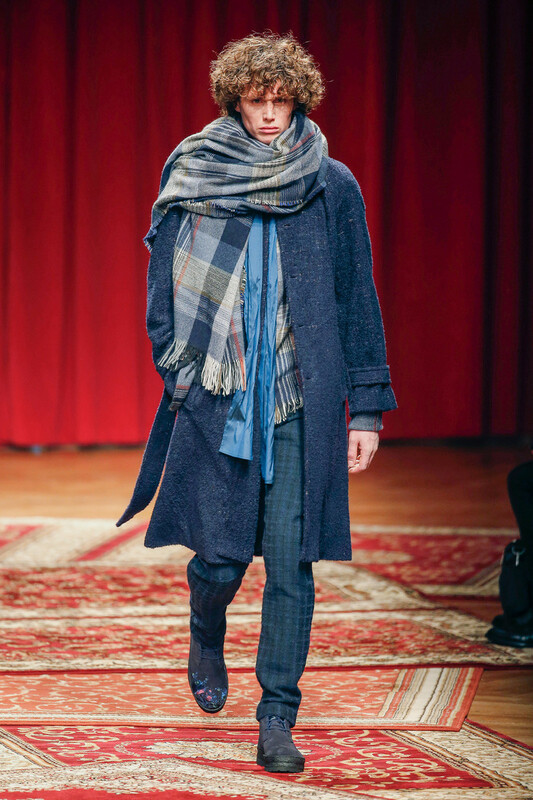 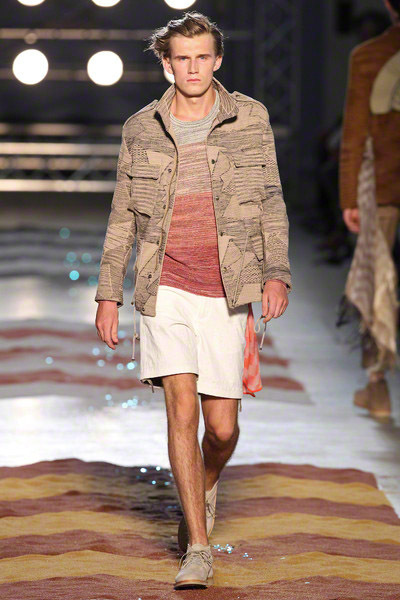 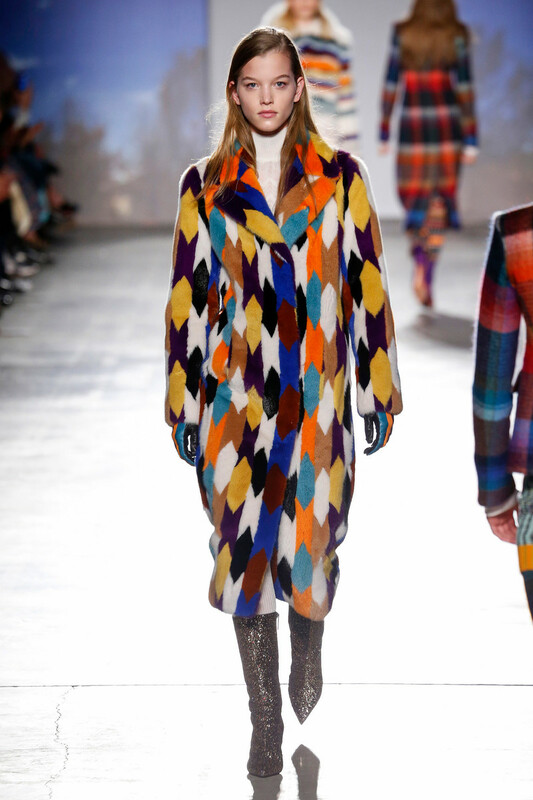 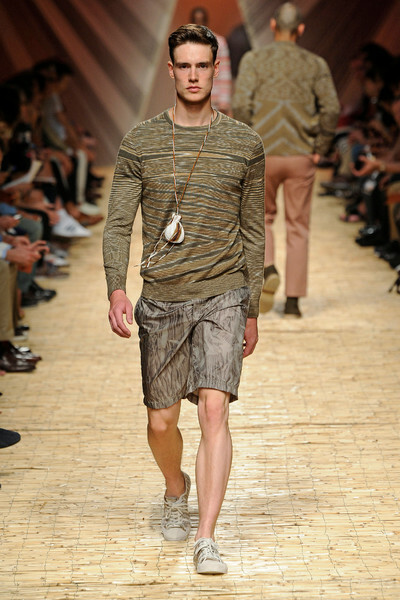 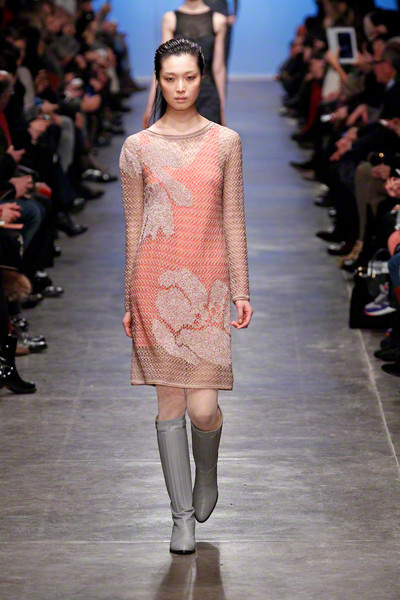 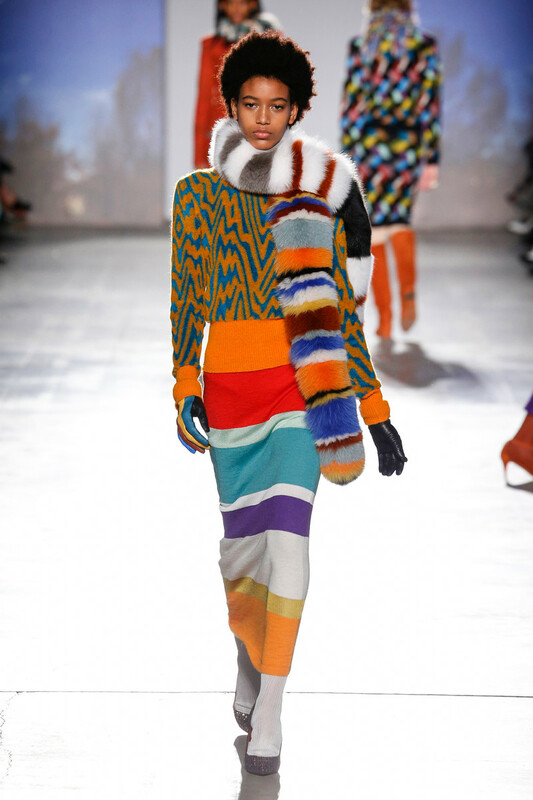 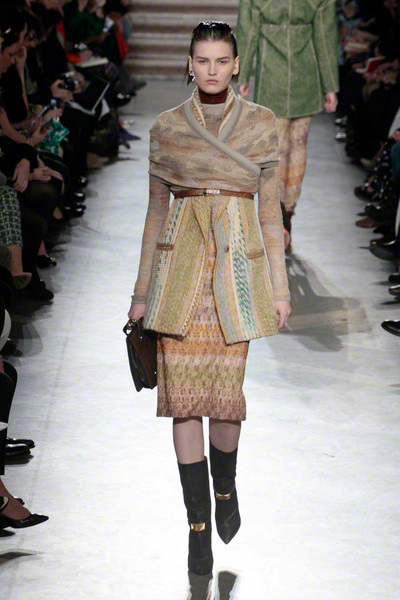 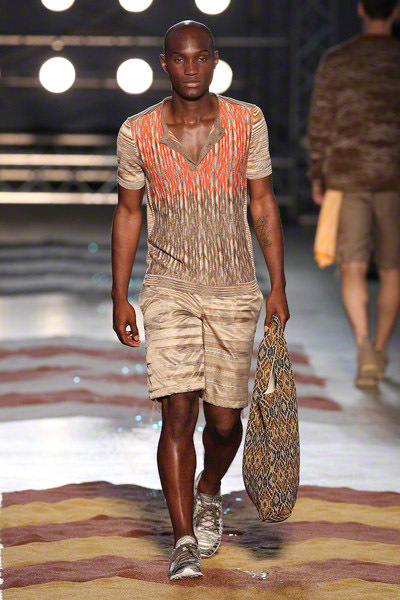 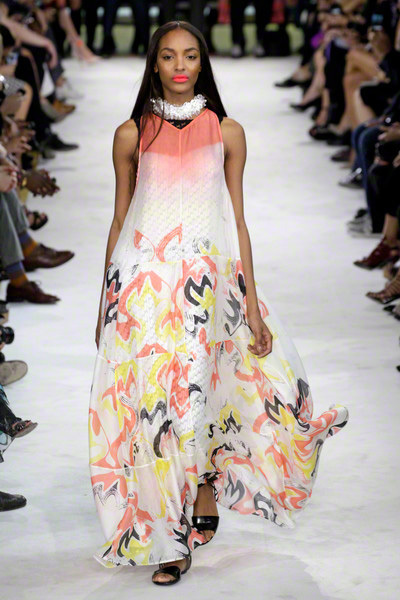 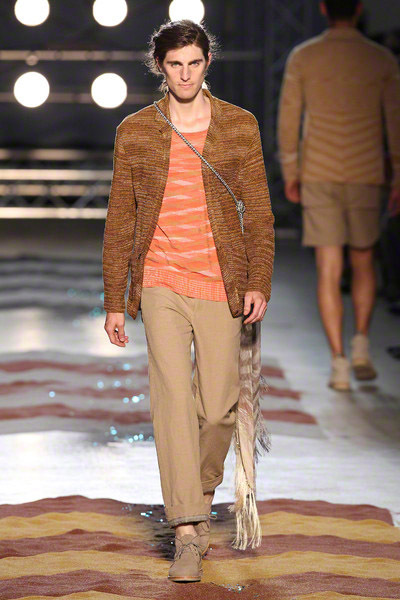 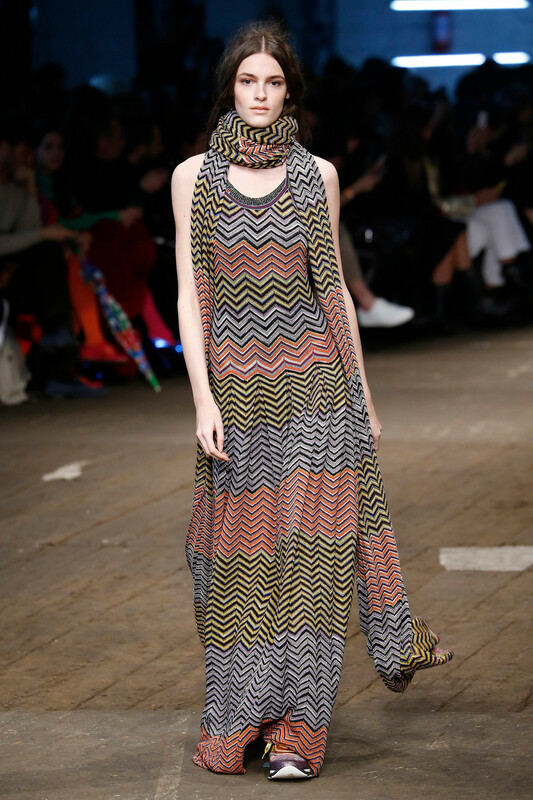 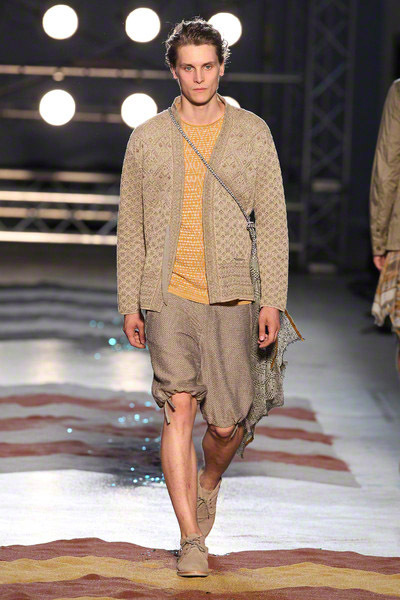 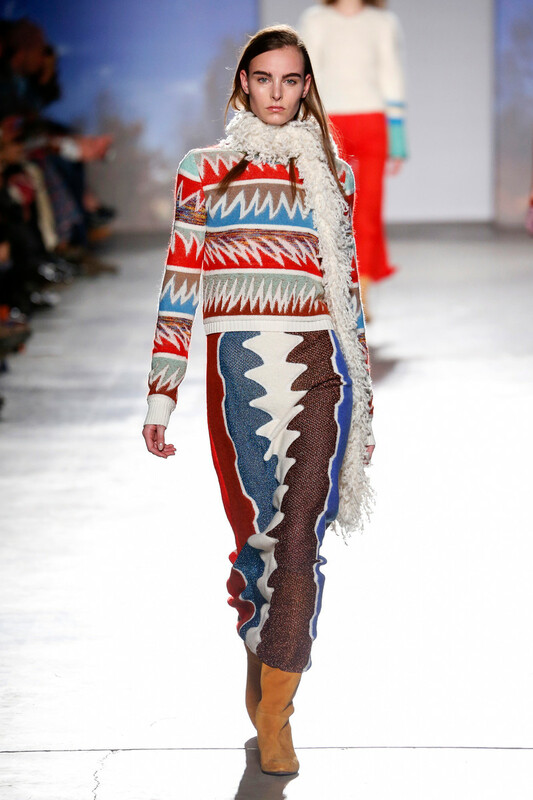 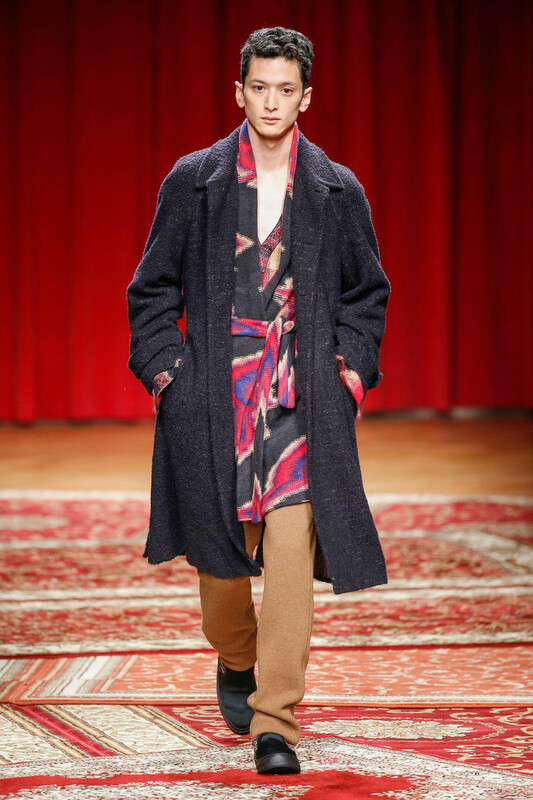 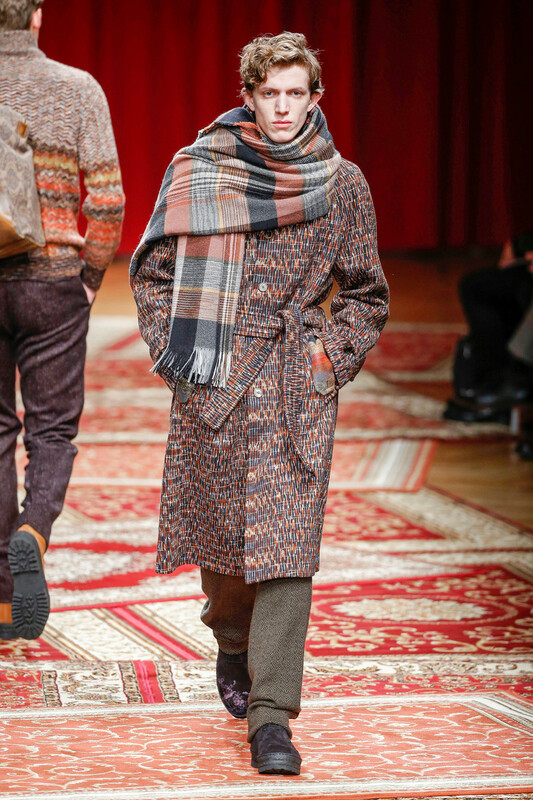 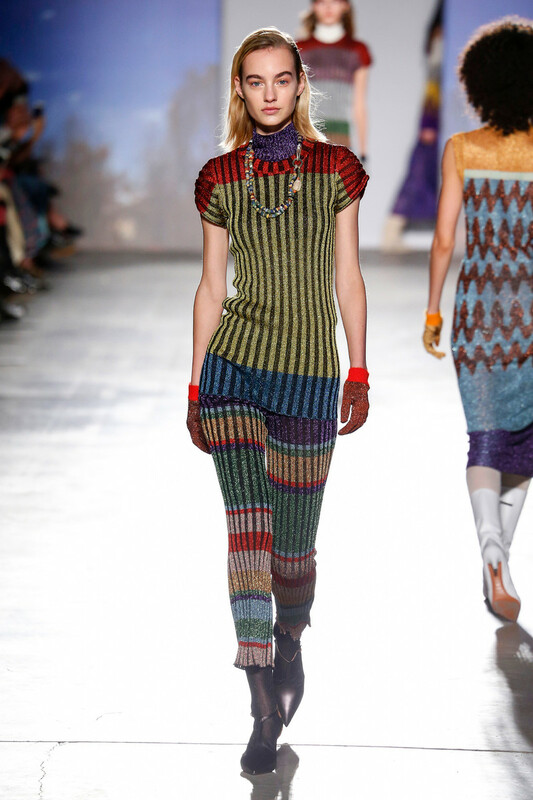 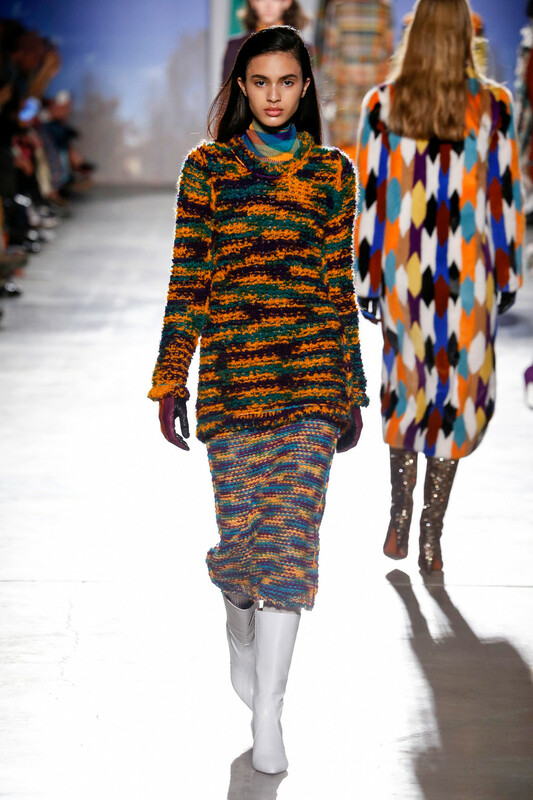 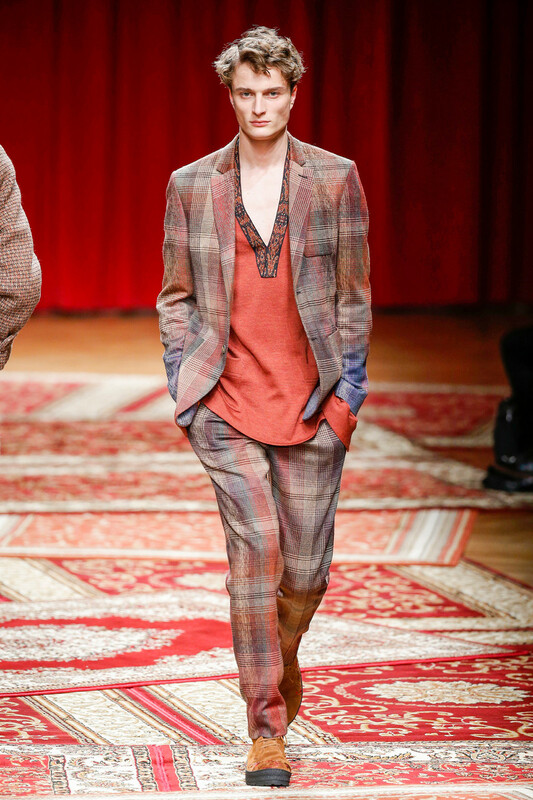 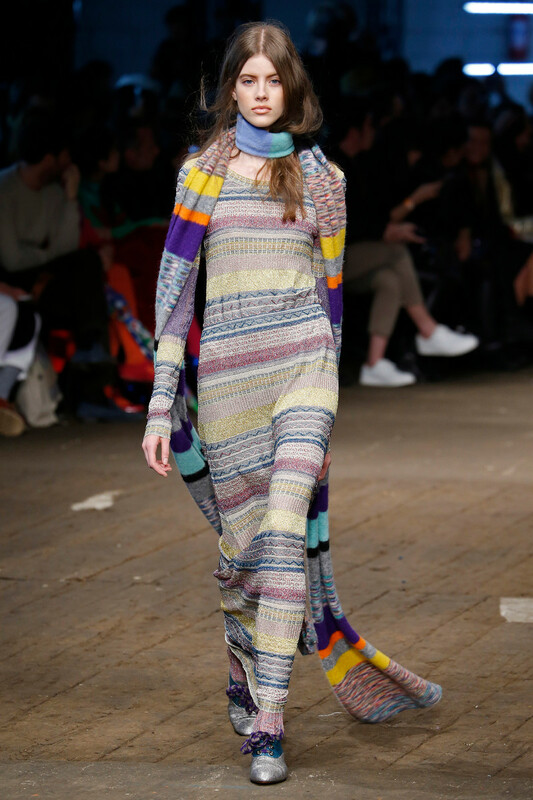 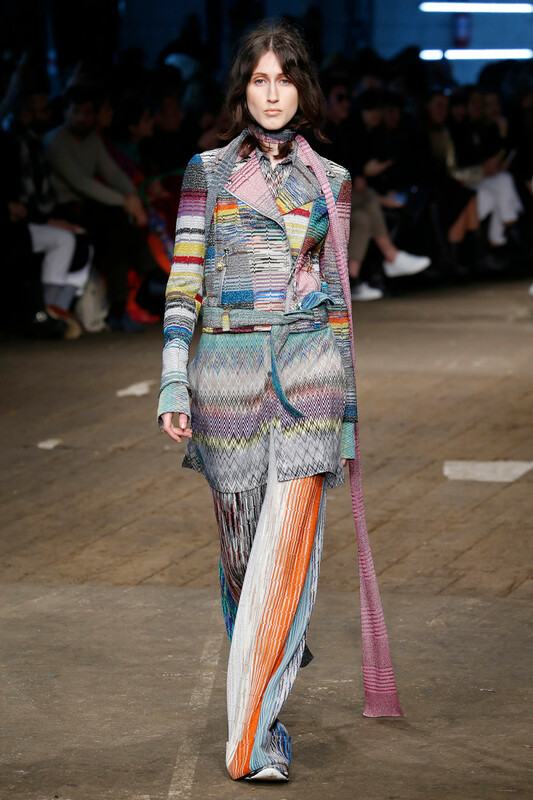 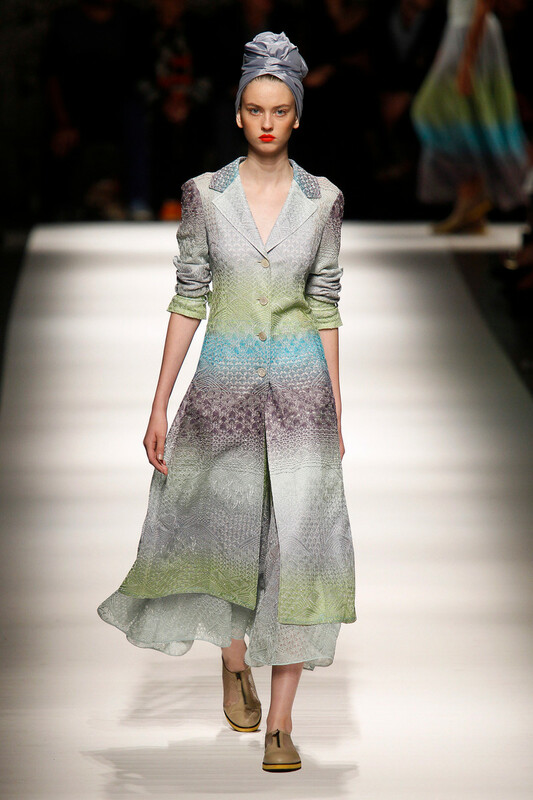 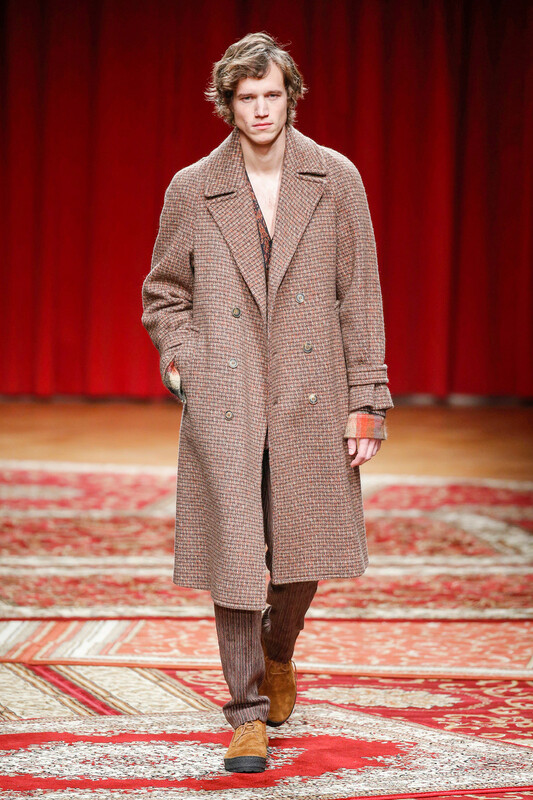 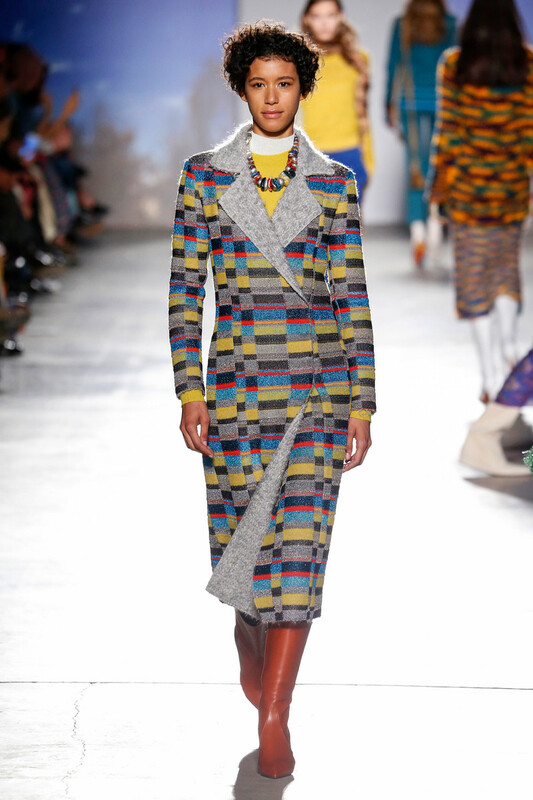 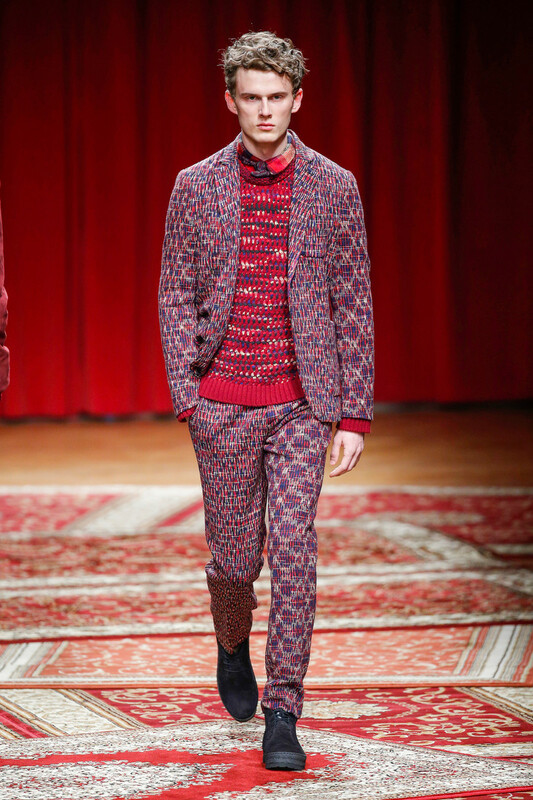 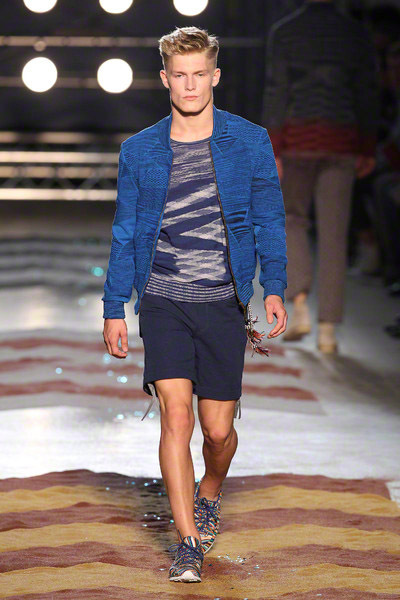 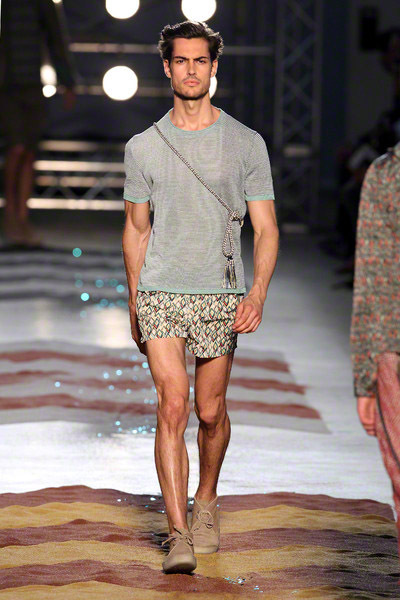 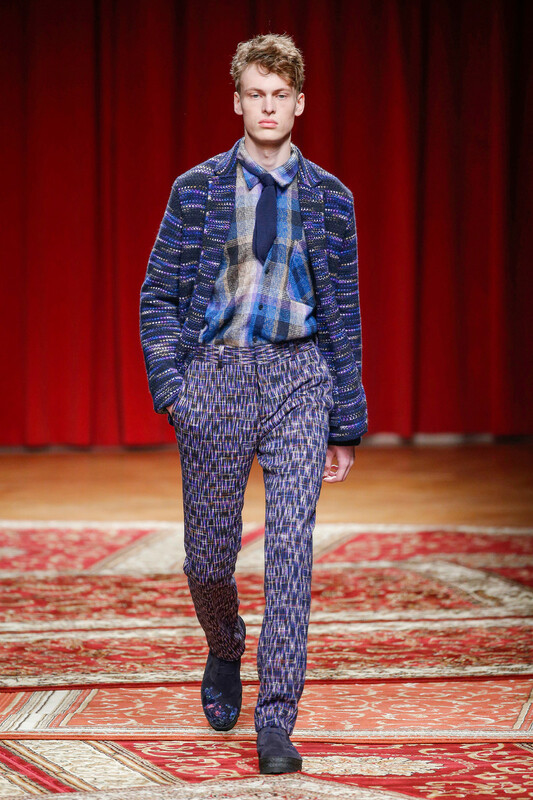 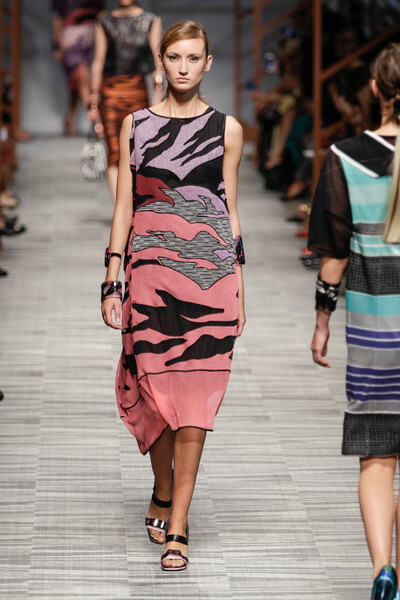 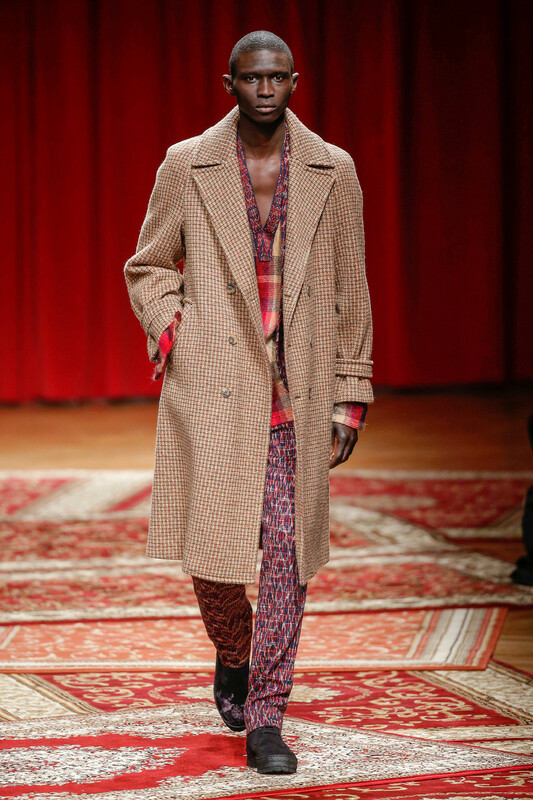 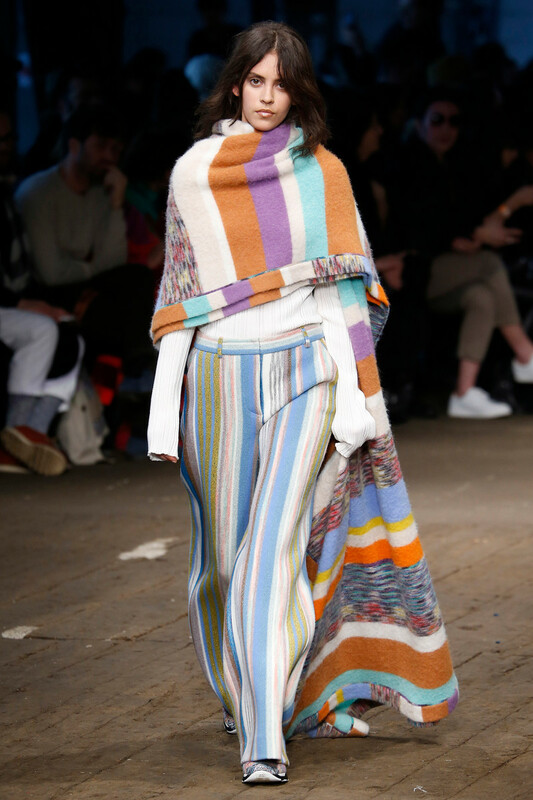 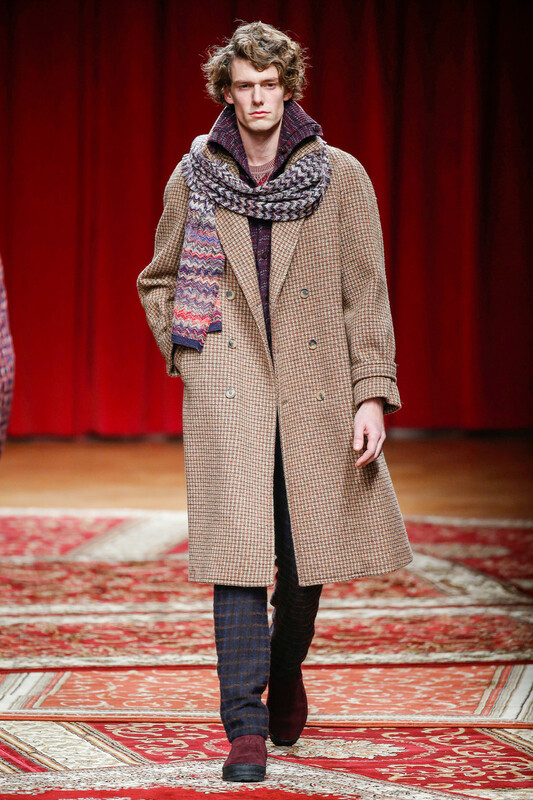 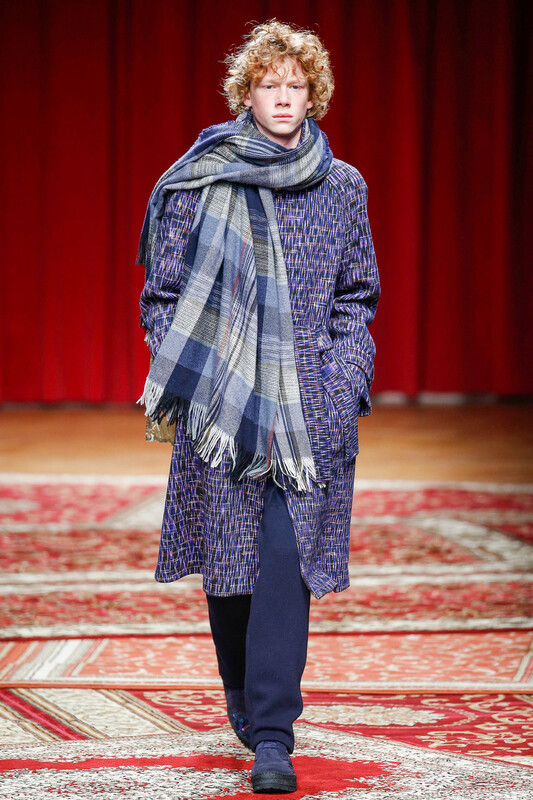 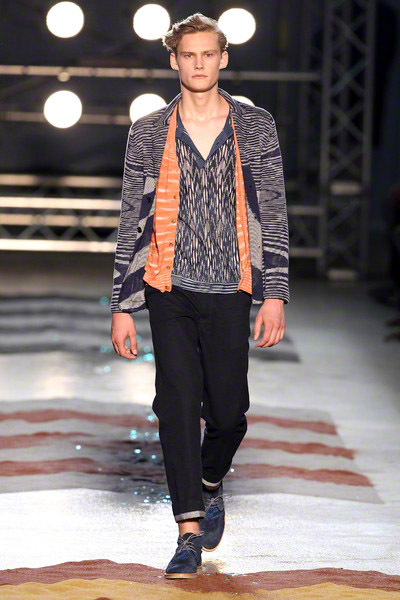 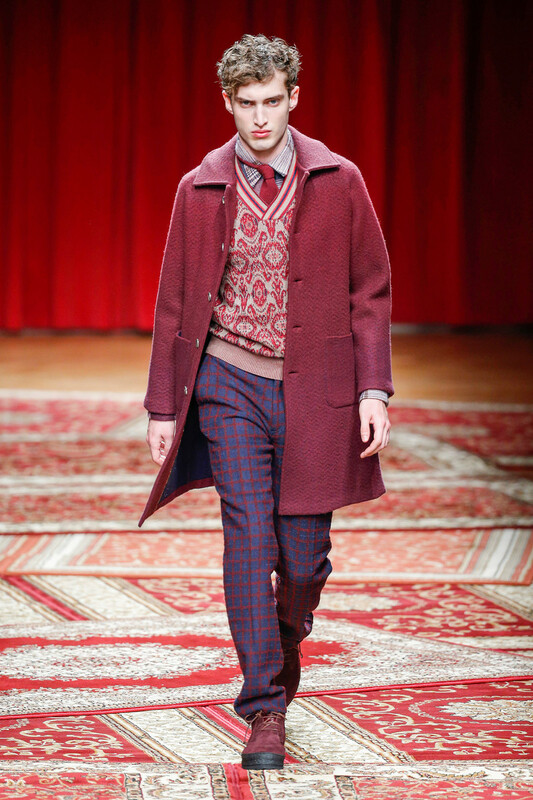 On a catwalk ‘built’ out of a mix of printed rugs, Angela Missoni presented her F/W looks, also all about a mix of prints. 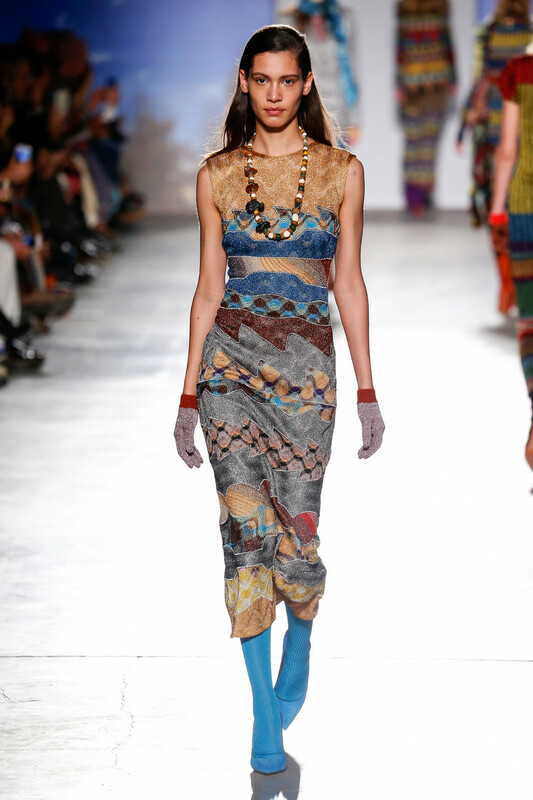 Inspired by Trans Siberian travelers she used prints and colors you’d come across on this exotic journey. 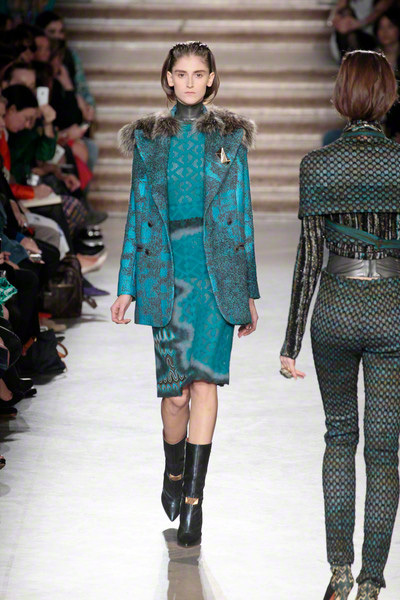 Prints ranged from holographic to geometric (some almost matched the tapestry) in predominant shades of blue, red and beige. 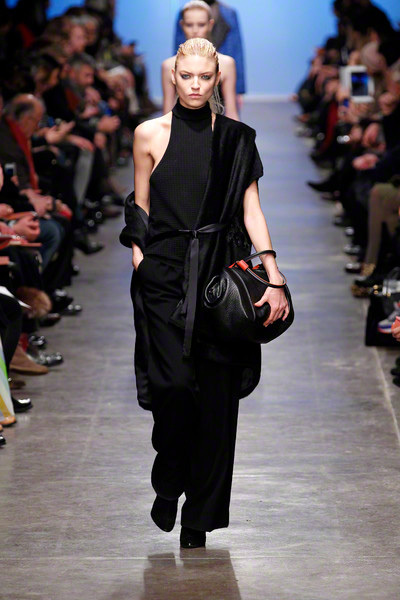 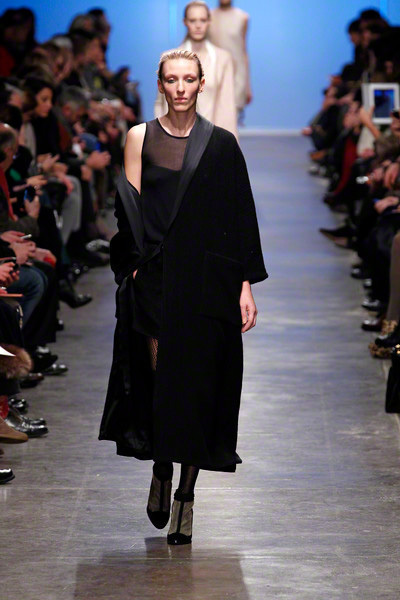 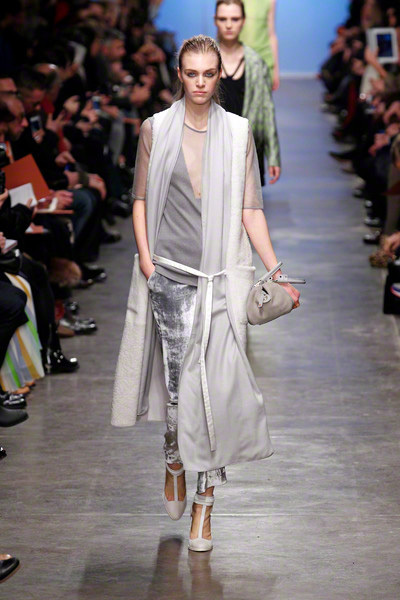 Pieces varied from pleated pants, shirt and tie to more free spirited wrap tops and open coats. 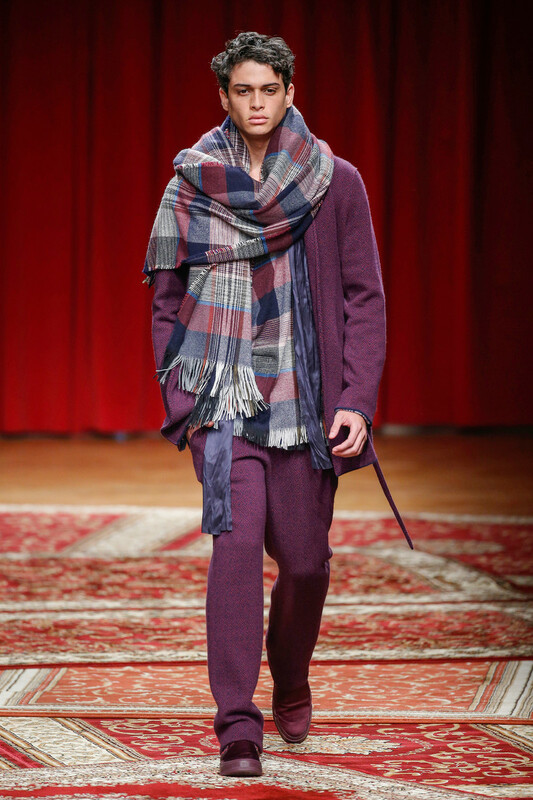 Large scarfs tossed around. 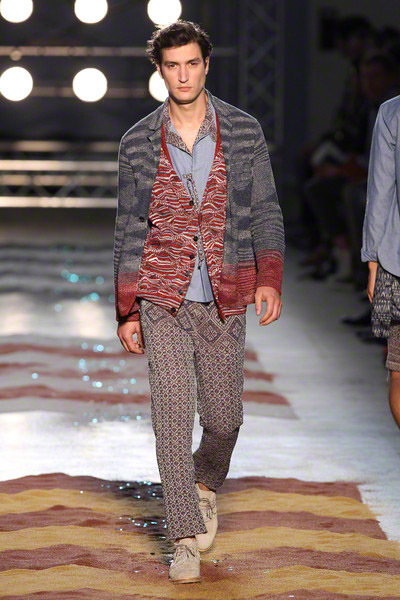 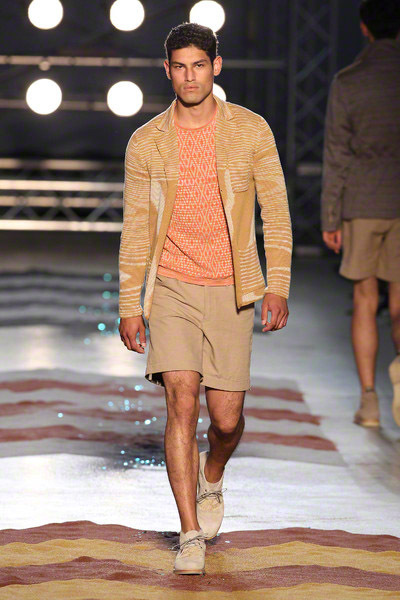 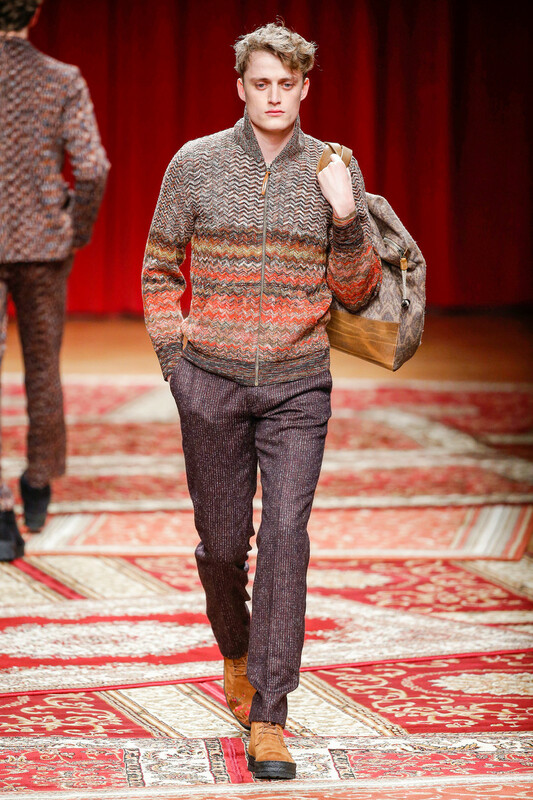 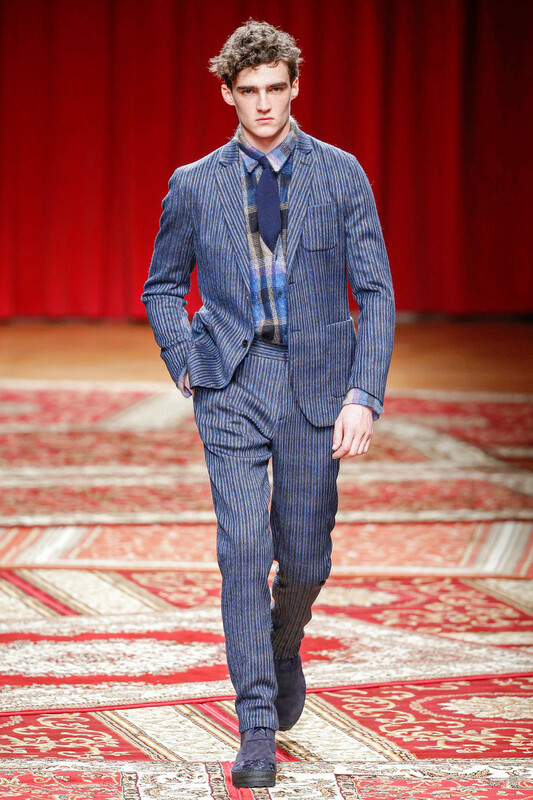 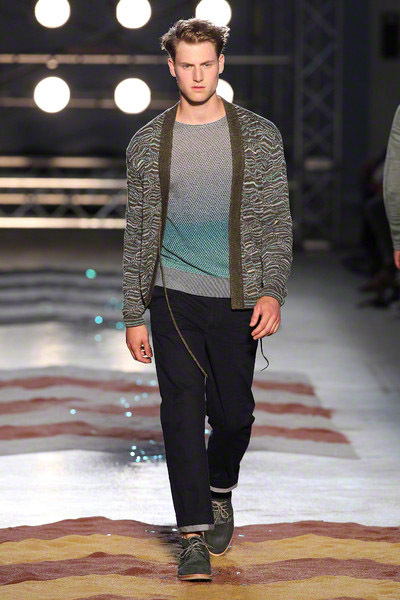 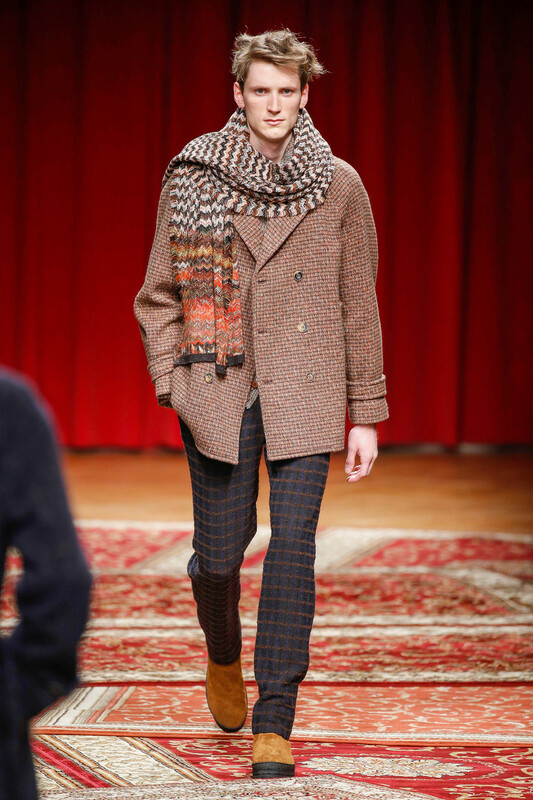 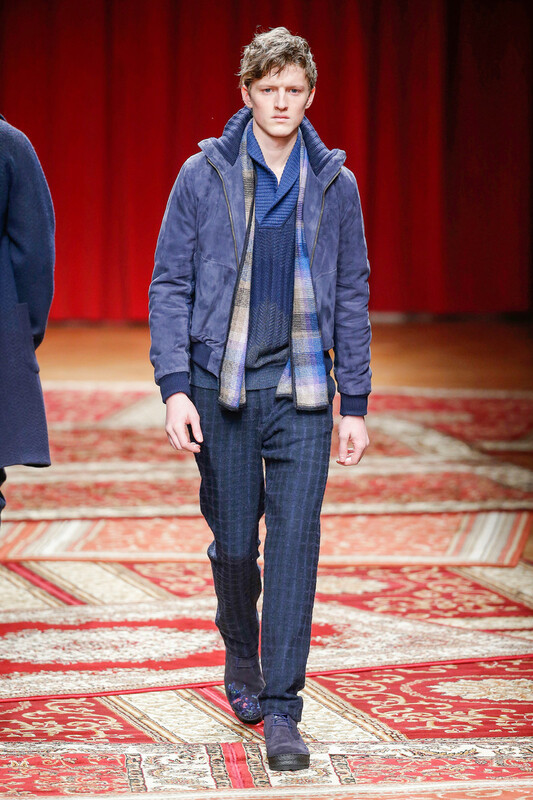 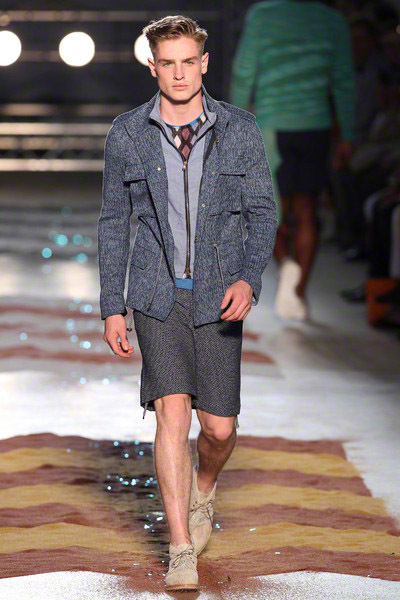 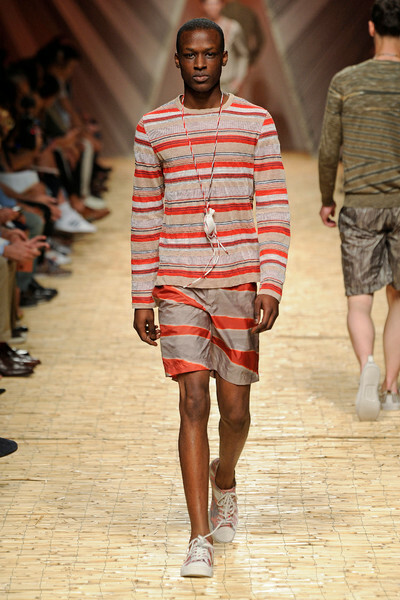 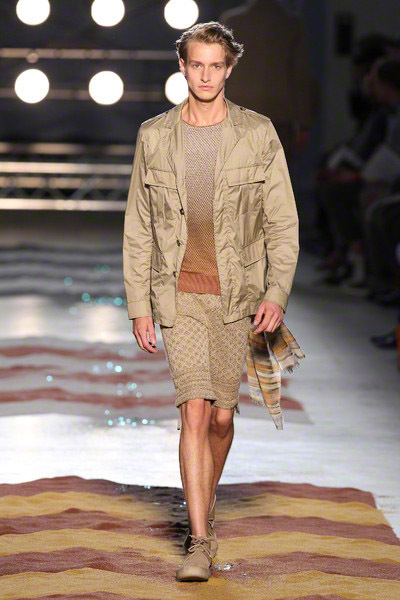 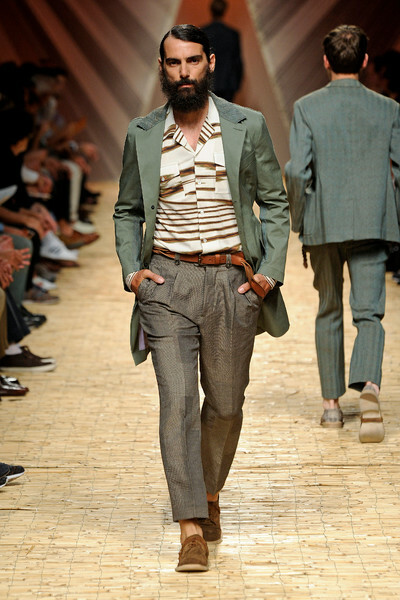 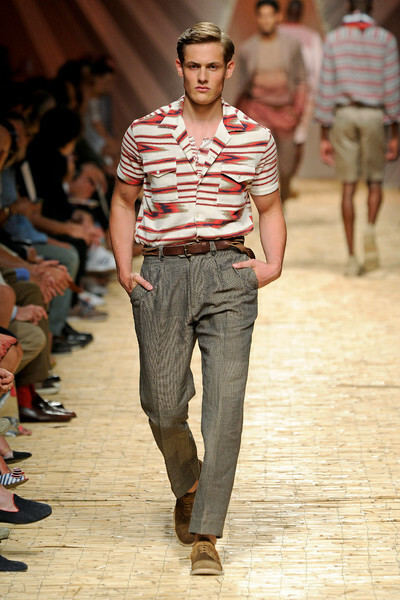 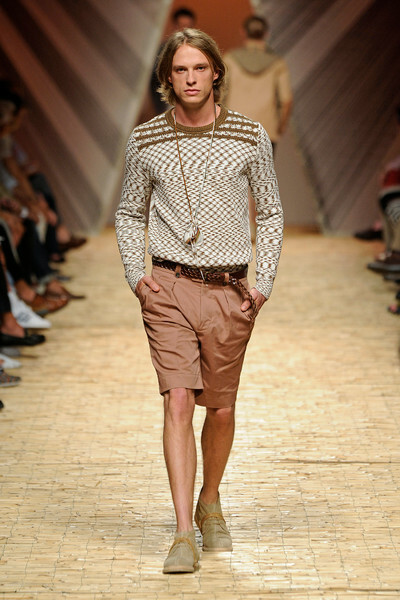 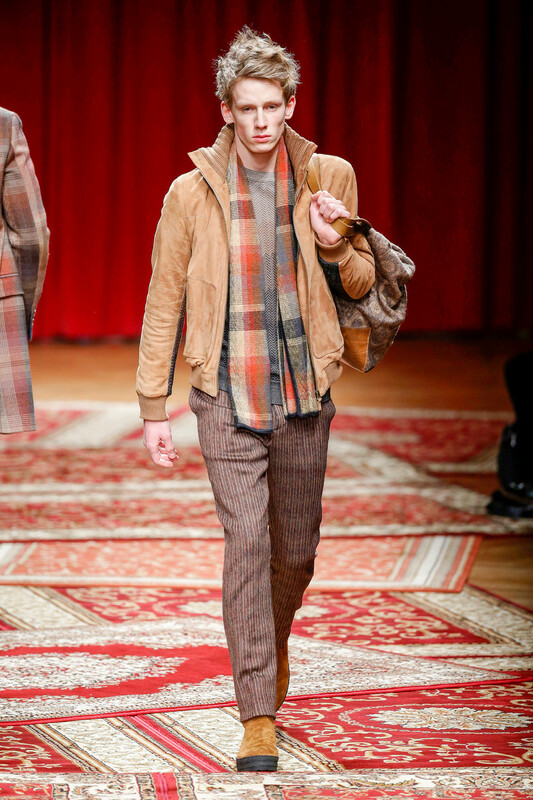 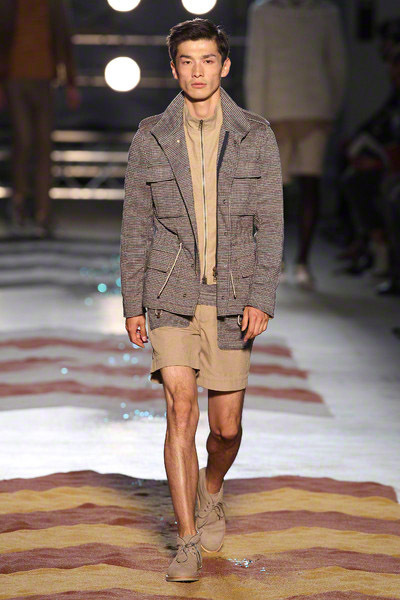 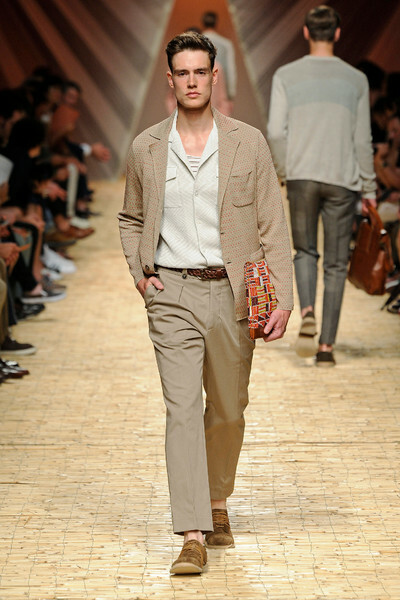 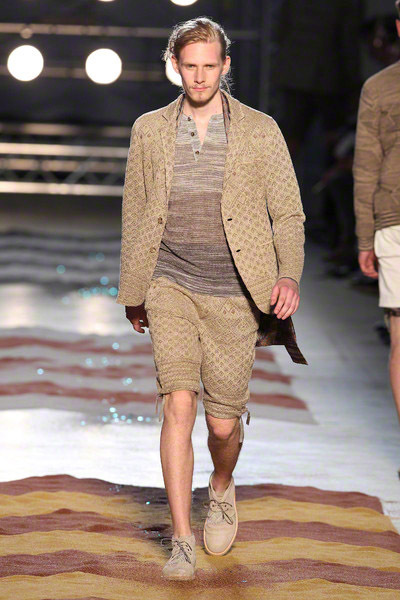 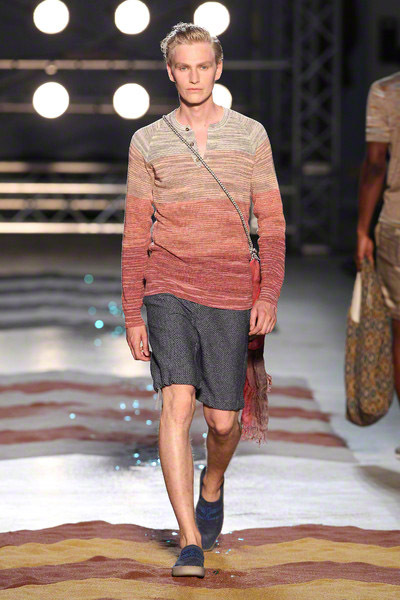 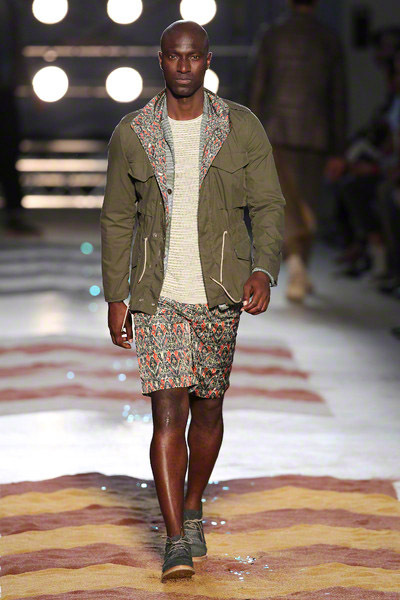 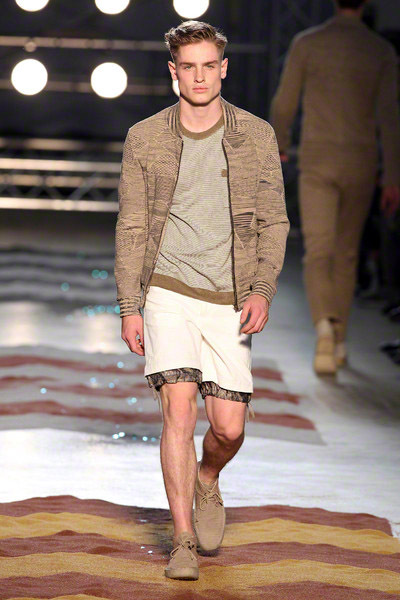 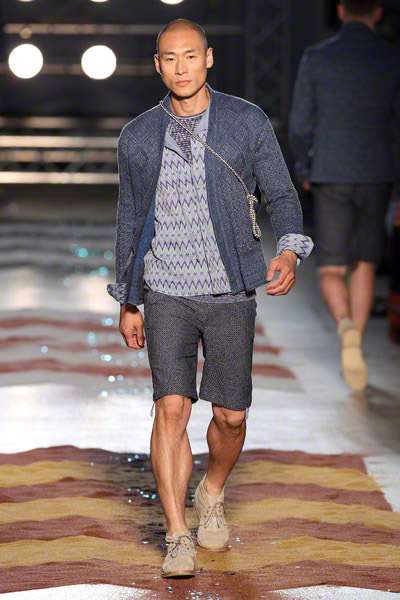 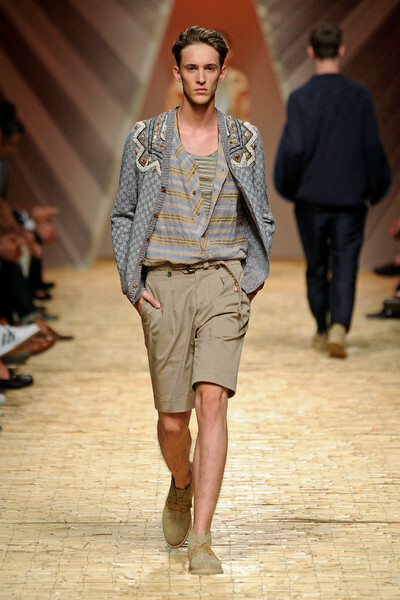 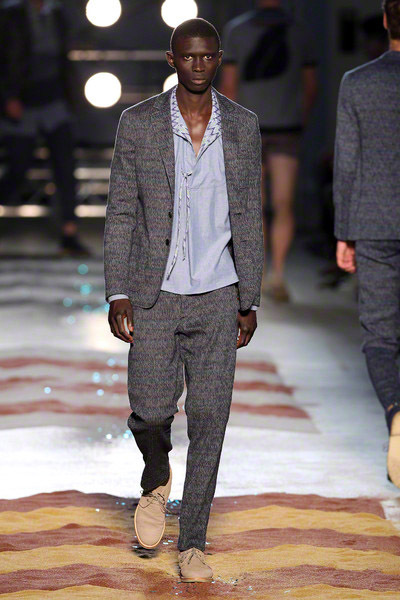 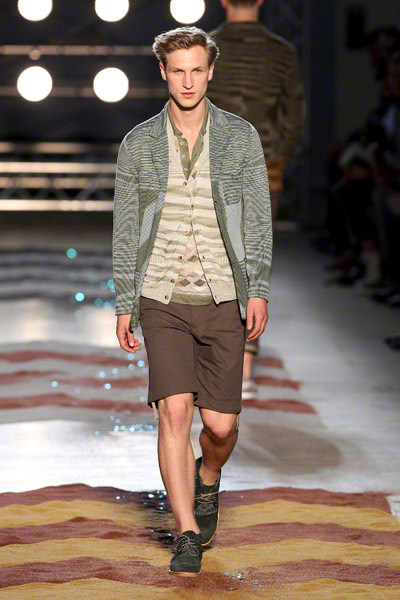 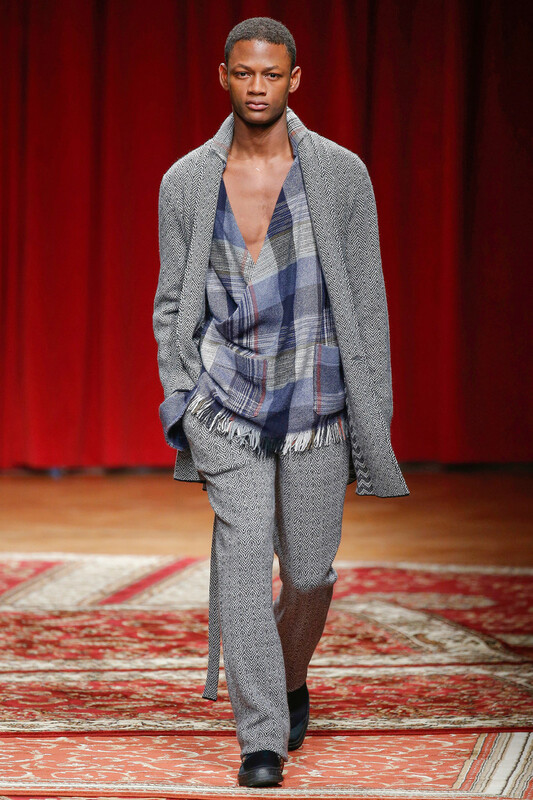 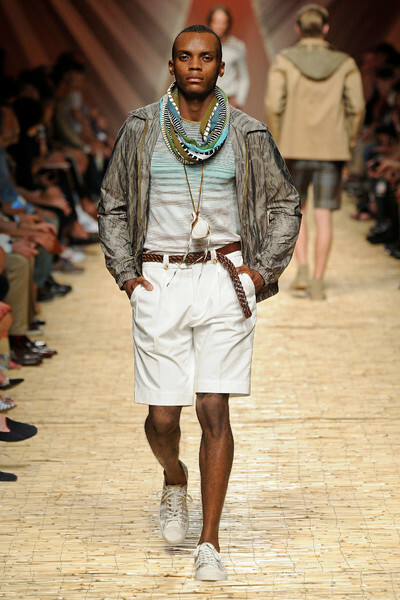 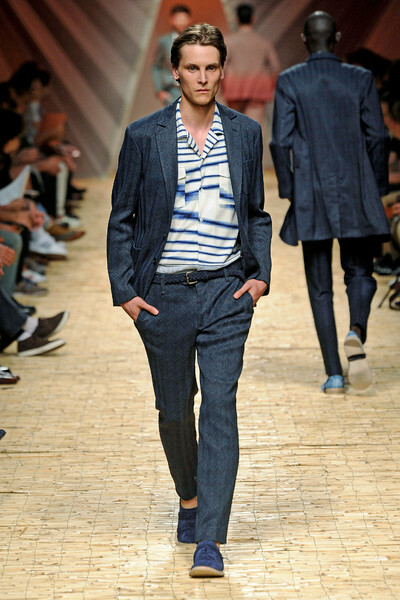 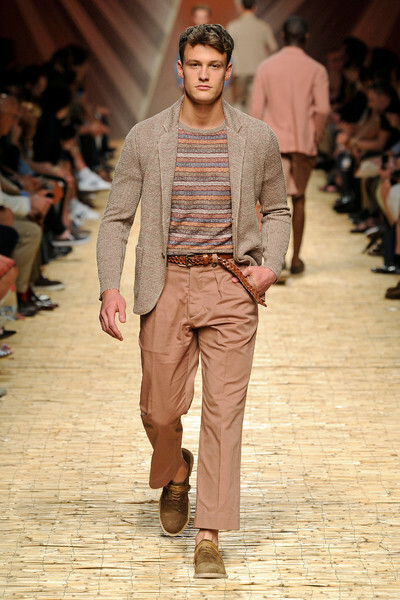 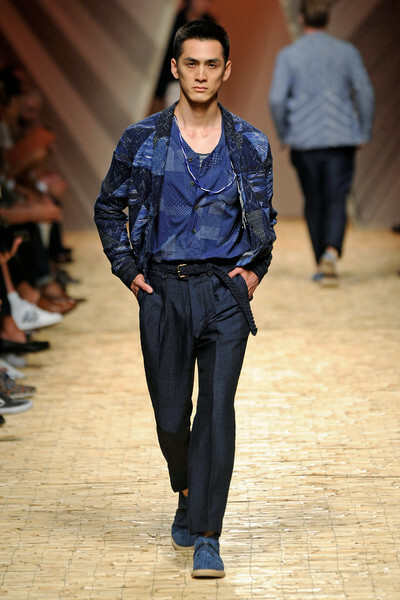 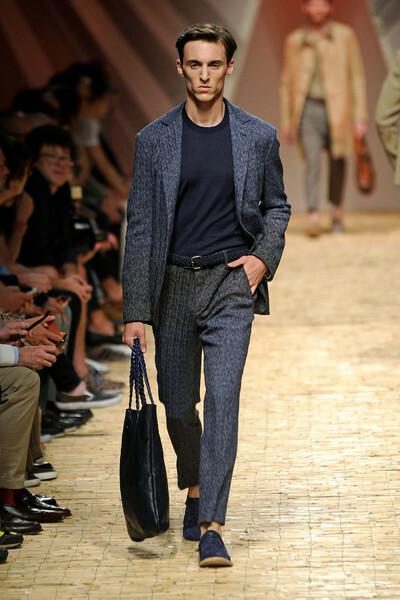 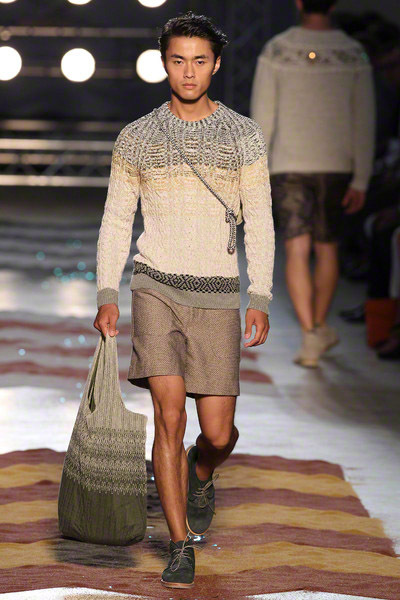 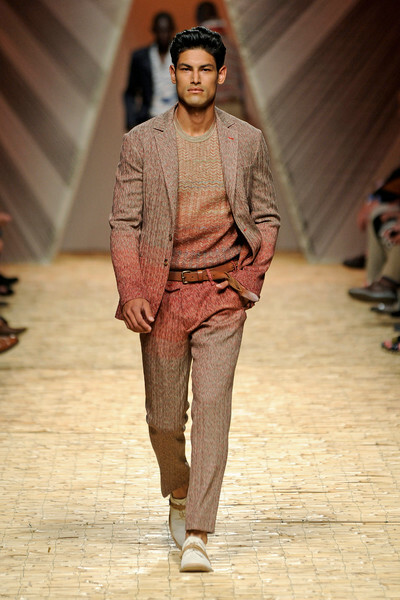 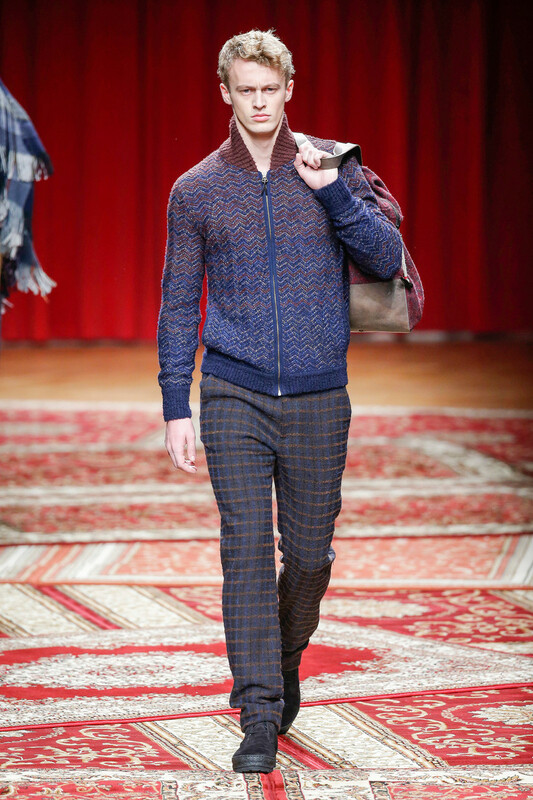 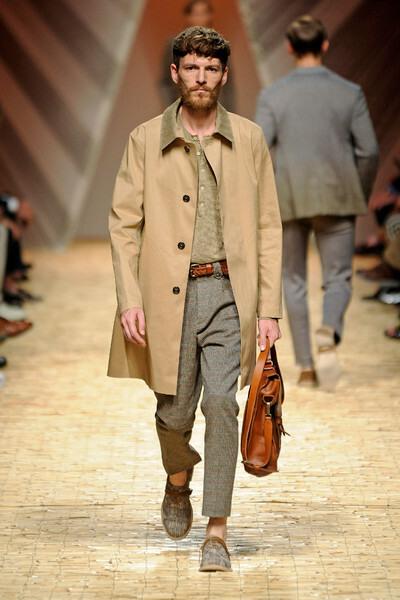 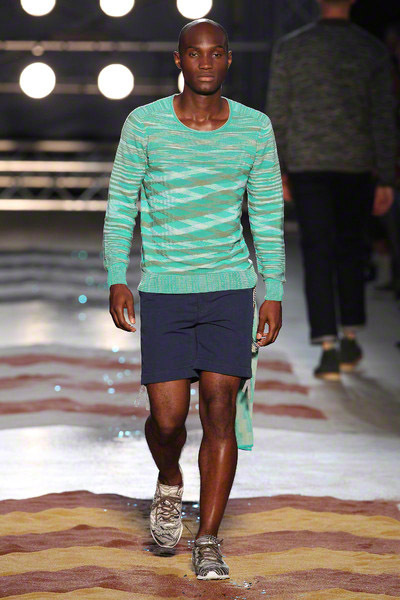 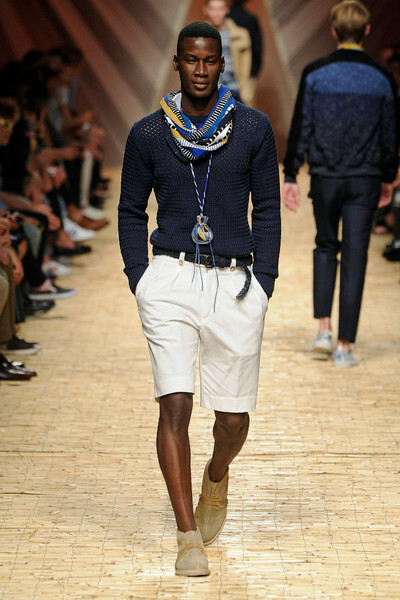 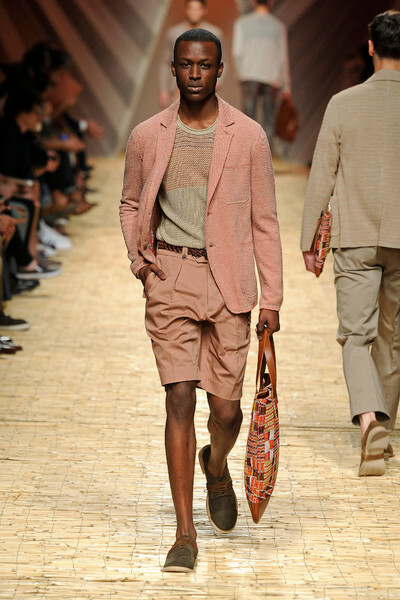 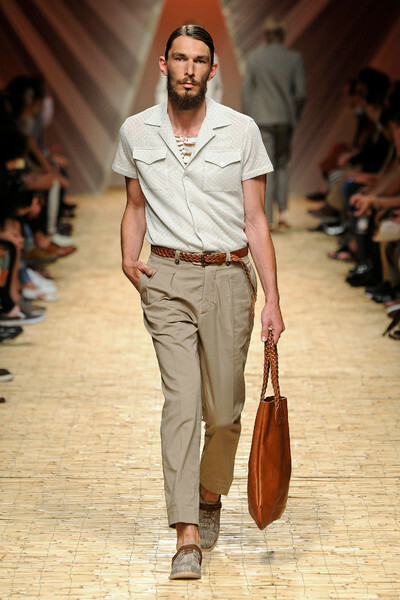 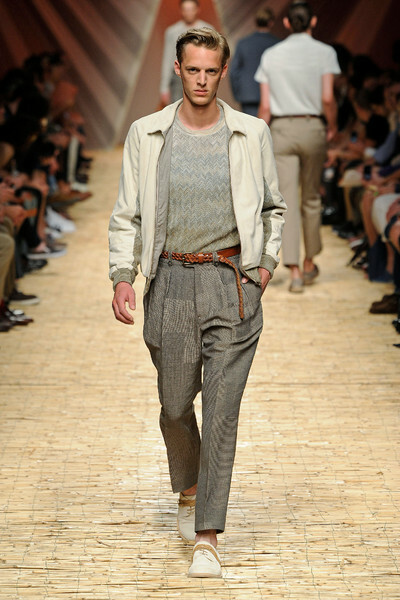 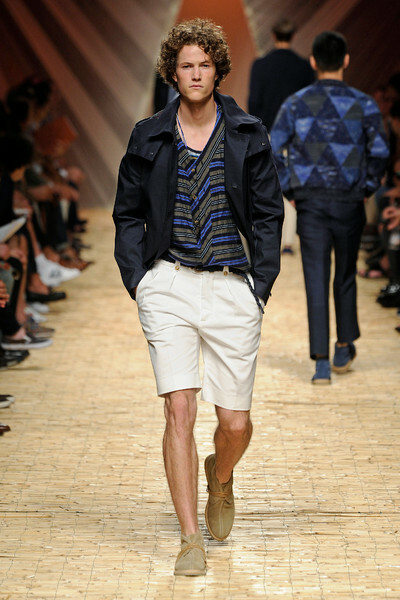 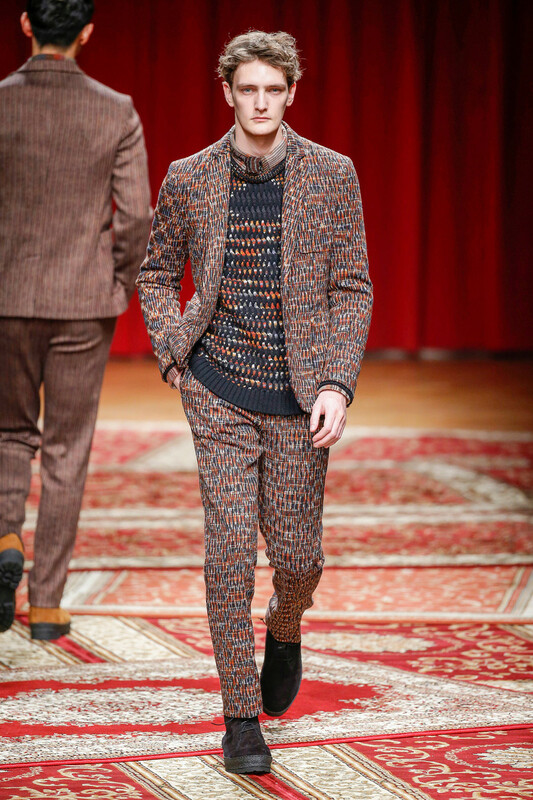 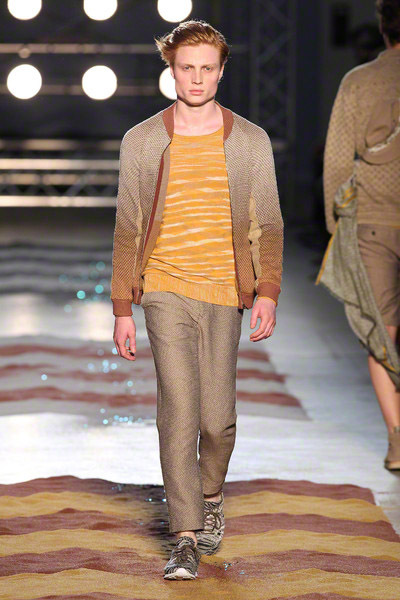 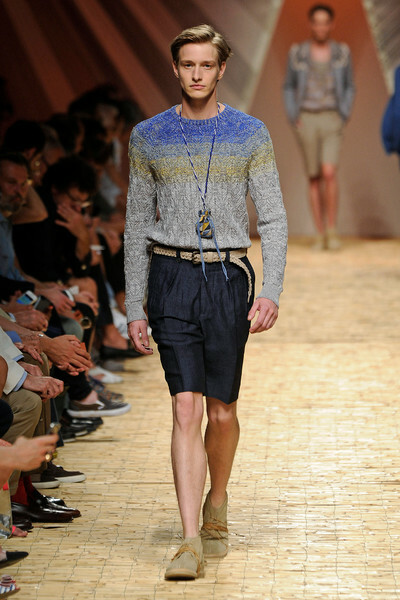 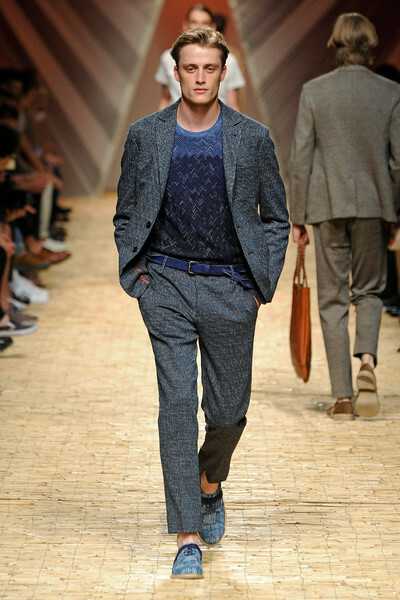 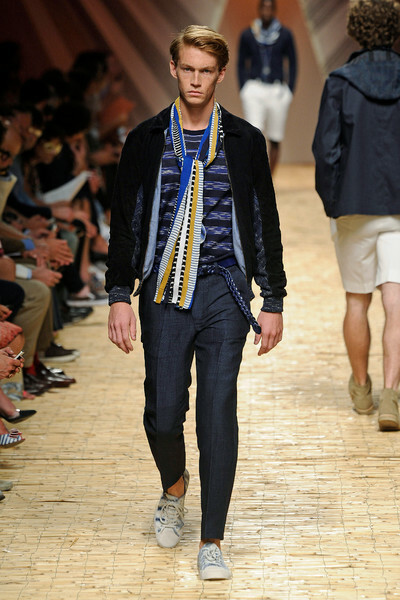 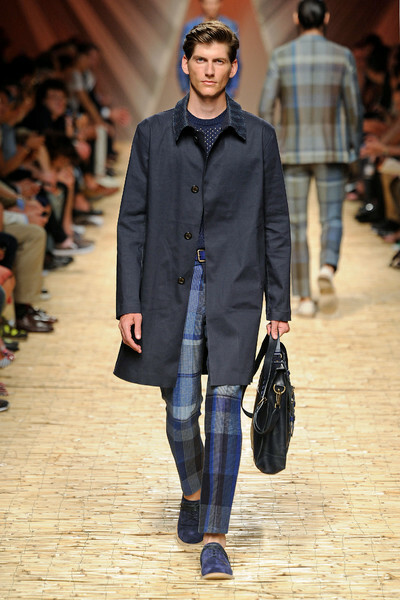 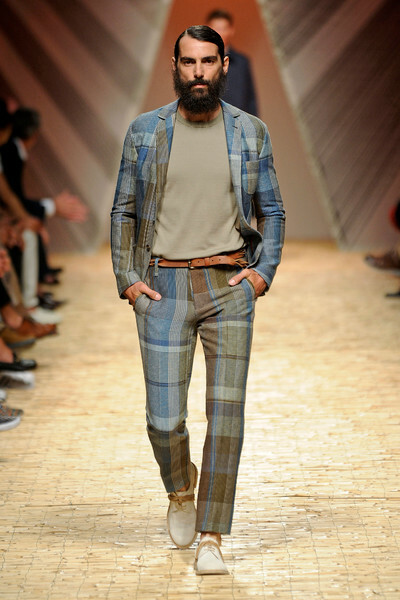 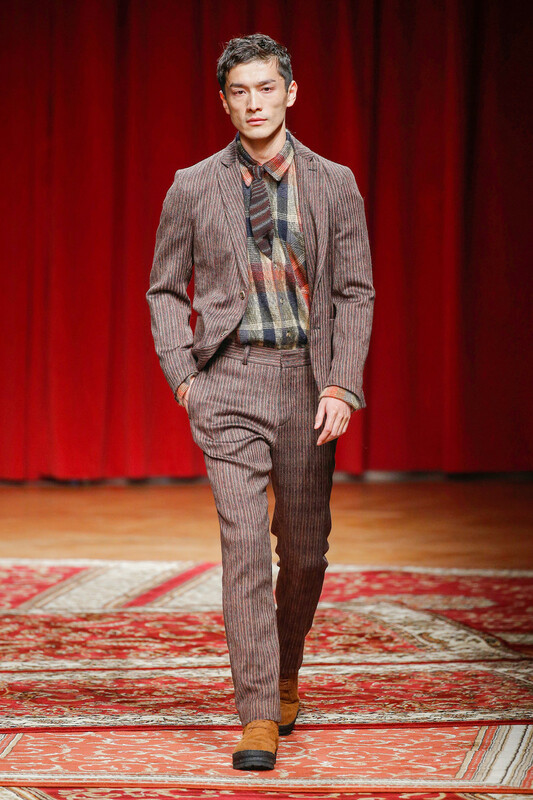 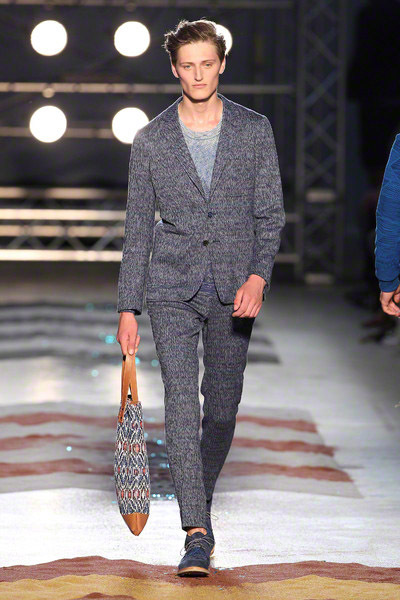 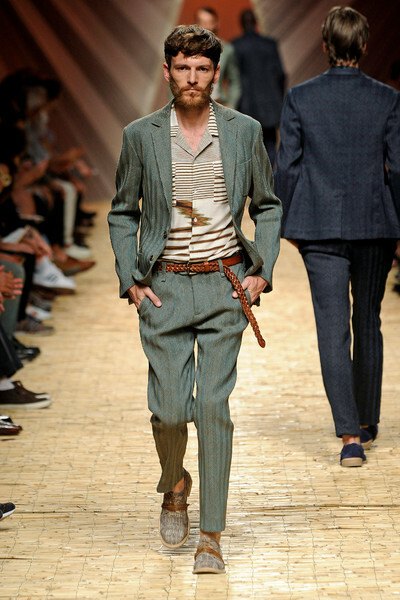 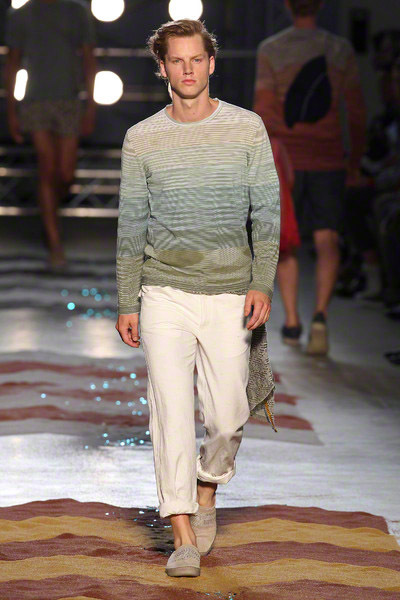 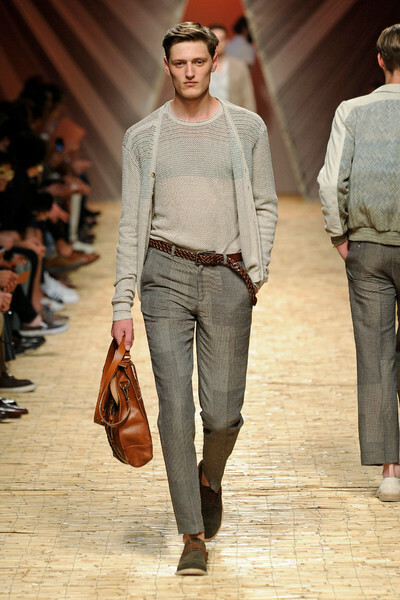 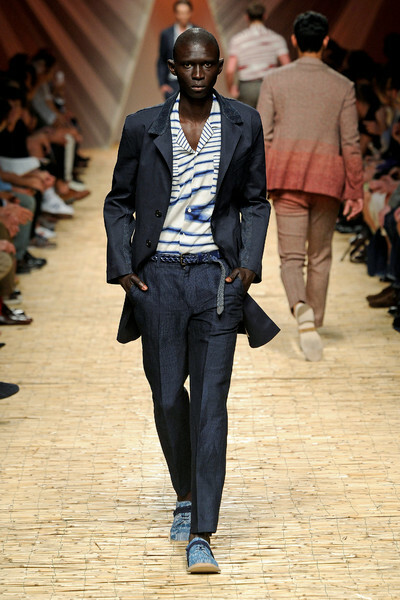 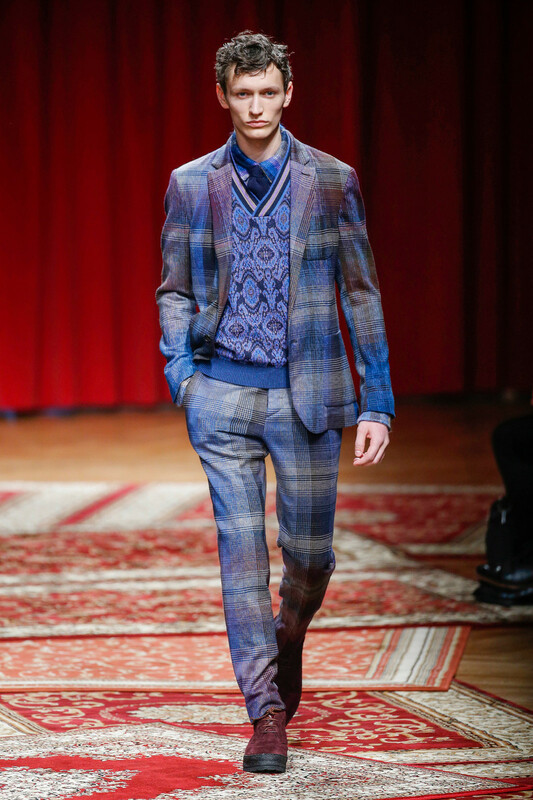 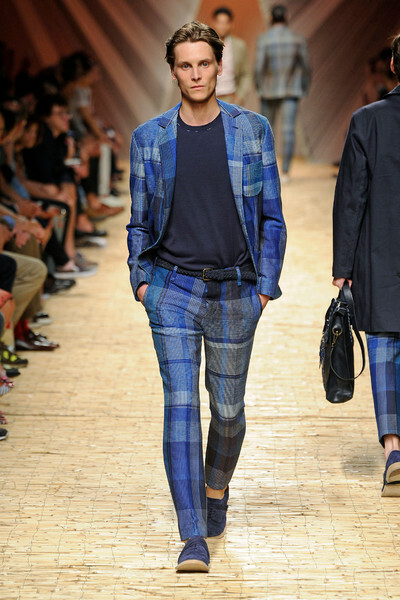 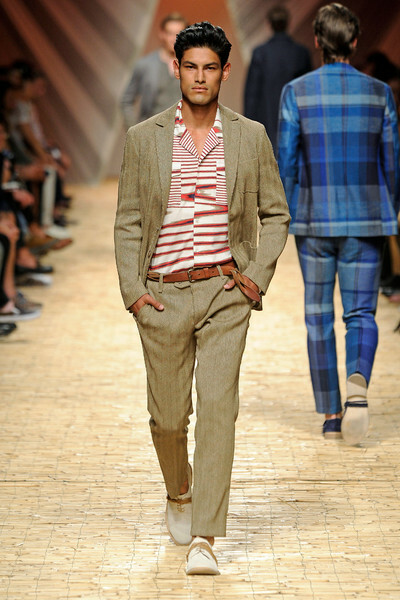 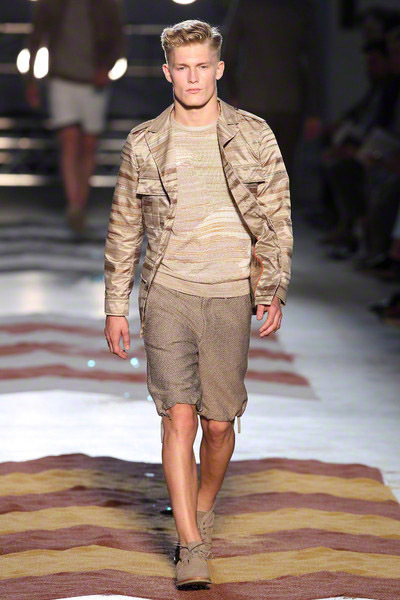 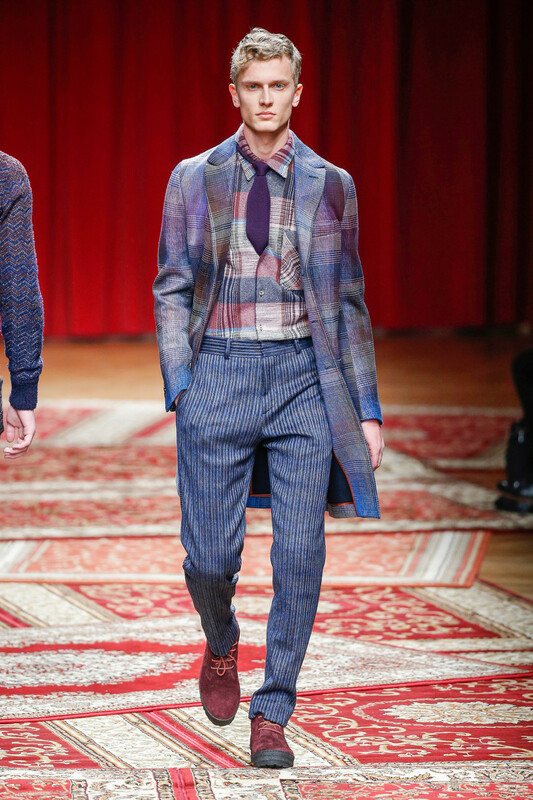 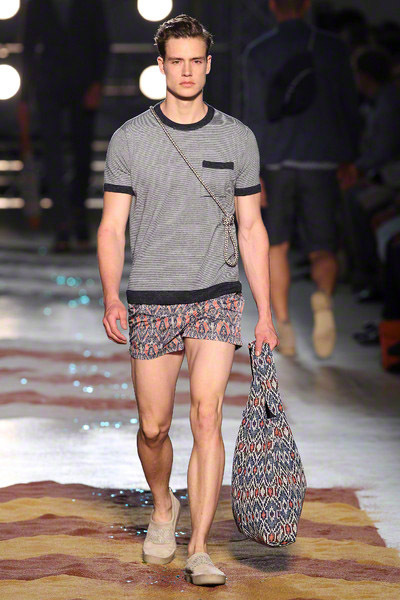 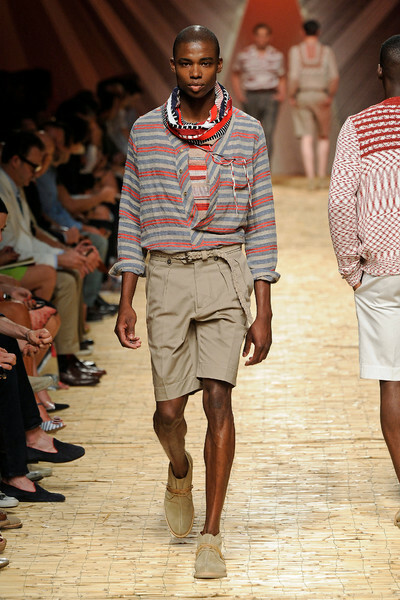 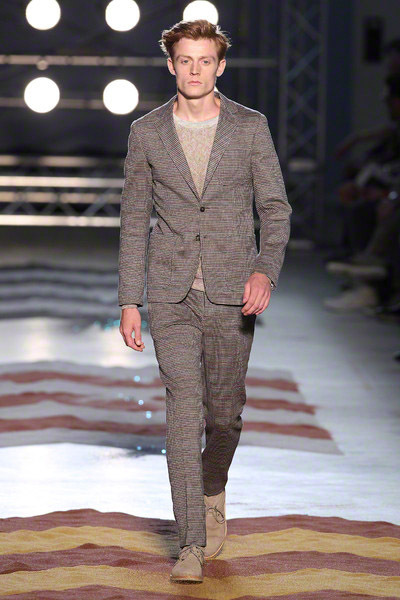 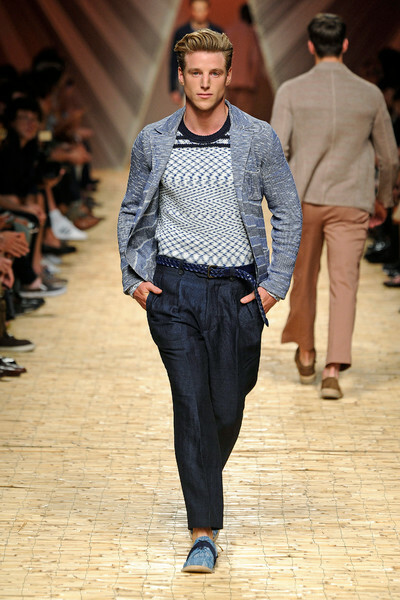 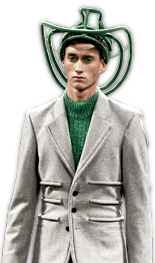 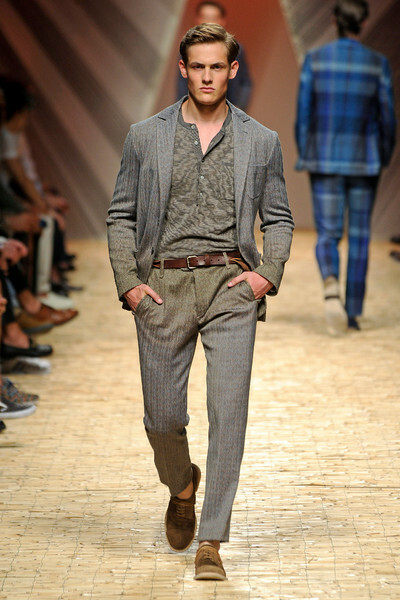 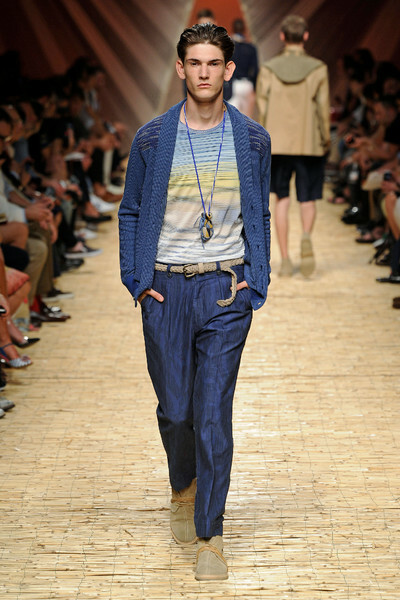 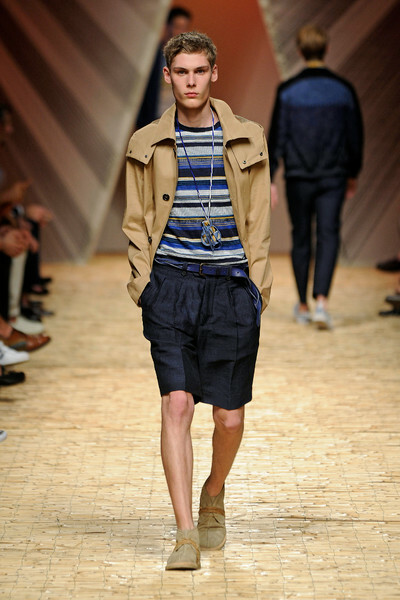 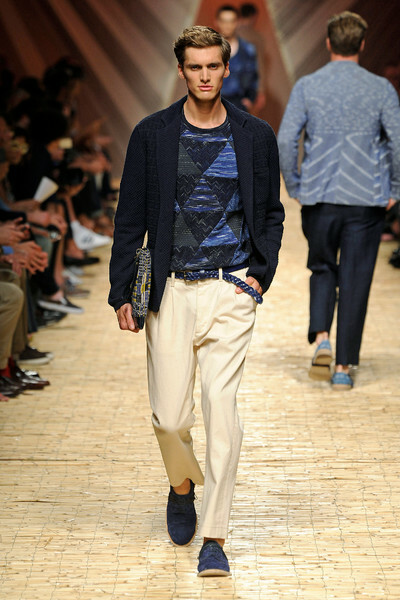 Therewith Missoni overs a city chic style for every man. 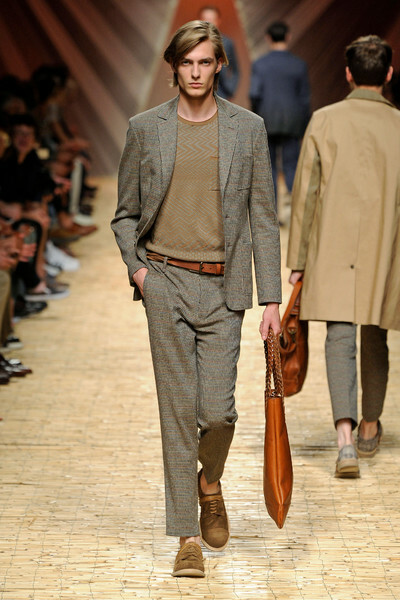 The family guy, the globe trotter and even the office clark (in knitted or woven, checked suits). 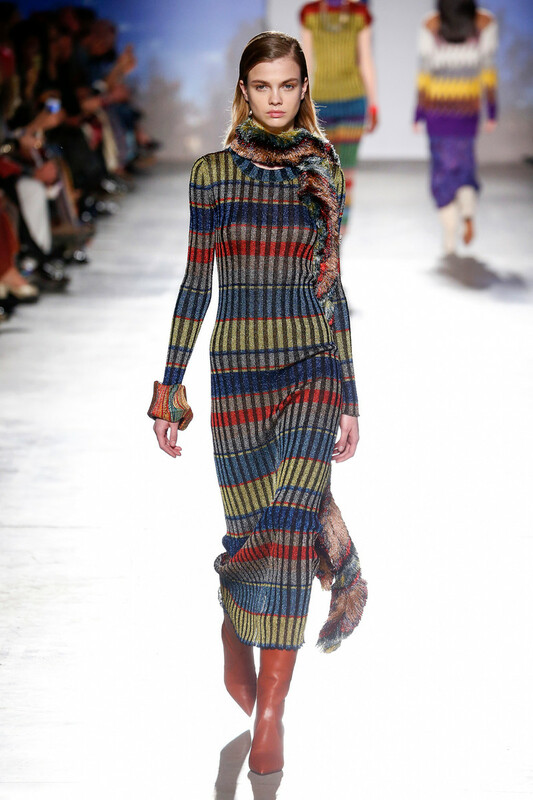 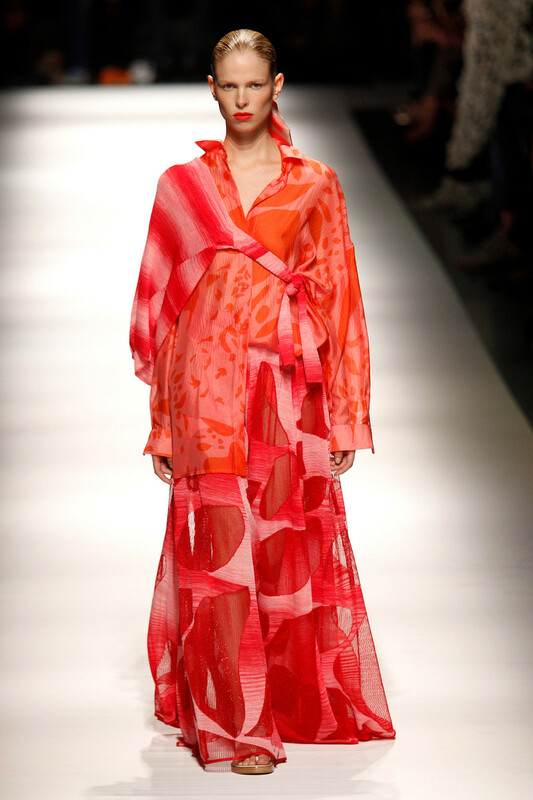 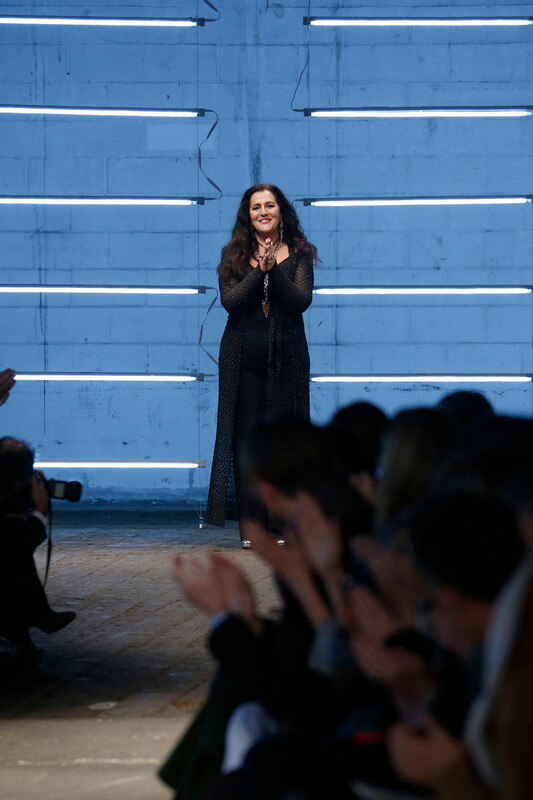 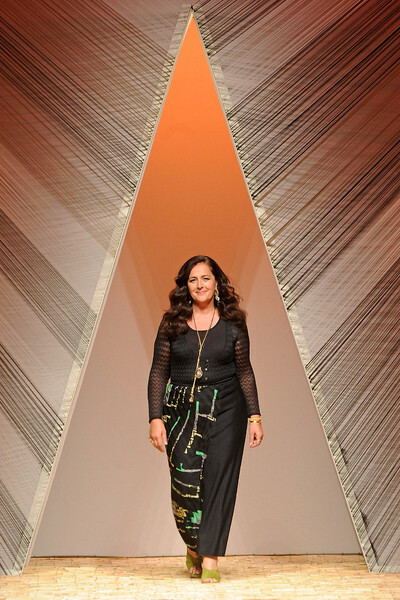 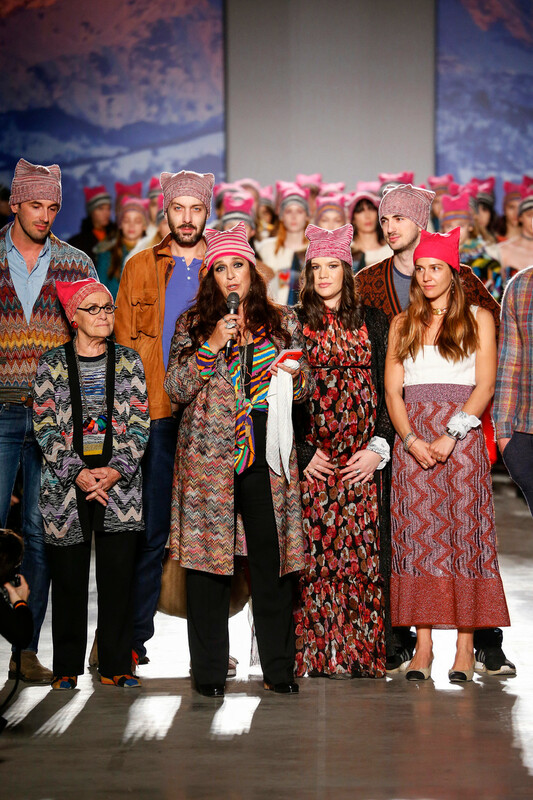 Earth, air, fire and water were the four basic ingredients of the Missoni show on Sunday, which came together in Angela Missoni’s vivid collection. 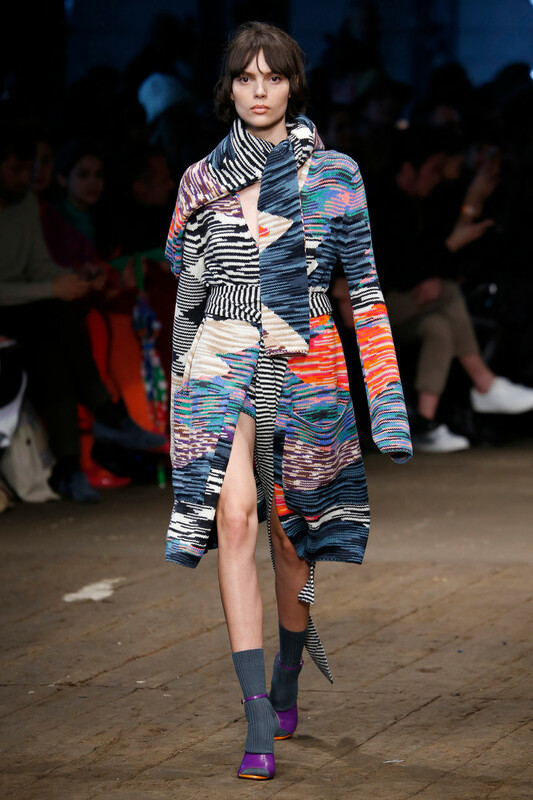 Prints of waves smashing on rocks, abstract birds, mountains and multiple variations of wavy patterns were used on what seemed to be travel inspired clothing. 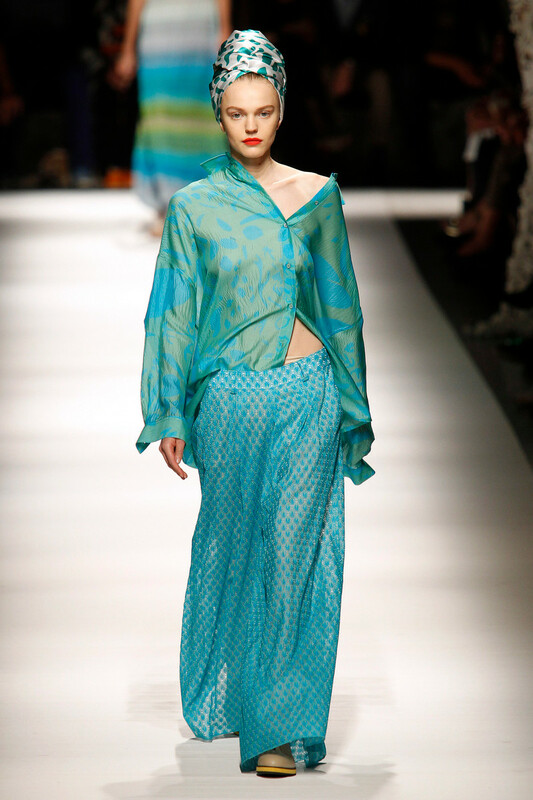 Like asymmetric sarong-styles, caftan-shapes and sari-silhouettes in vibrant shades of blue, turquoise, pink, orange and fuchsia, followed by a series of designs in black and white. 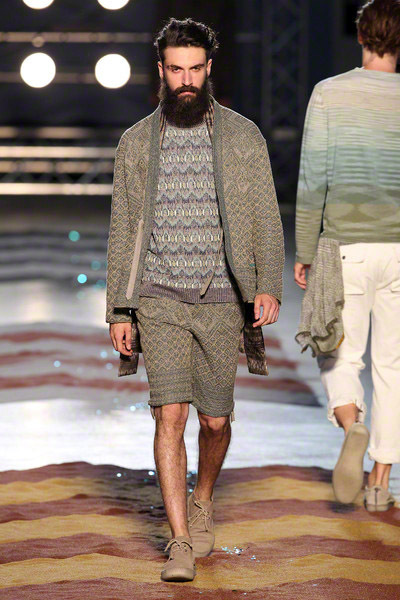 No doubt these looks will work perfectly in any holiday destination, but for the normal everyday city life it maybe all appeared buy viagra without prescription a little too bold and experimental. 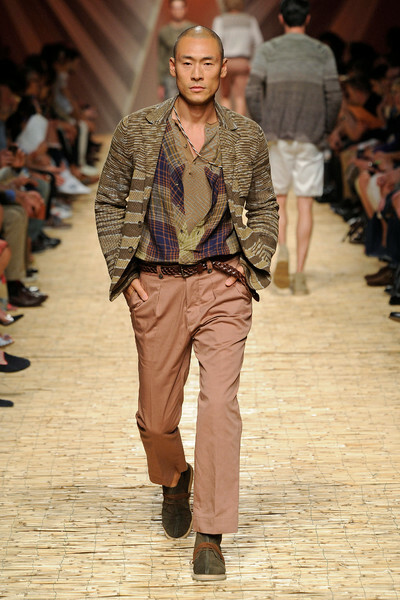 Especially since subtler prints and softer shades always work so well for the brand. 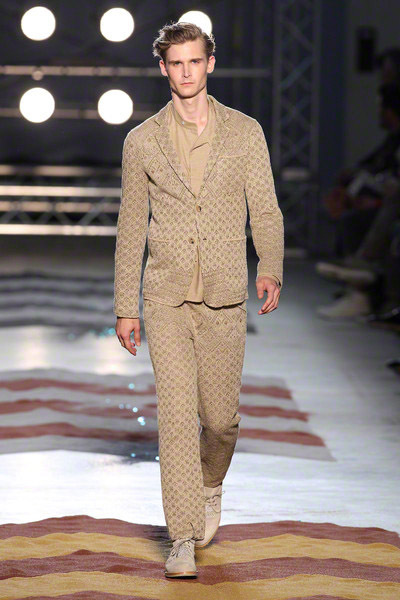 The final selection of monochrome looks, which had the Italian fashion house’s brand name printed all over them, might just be picked up, however. 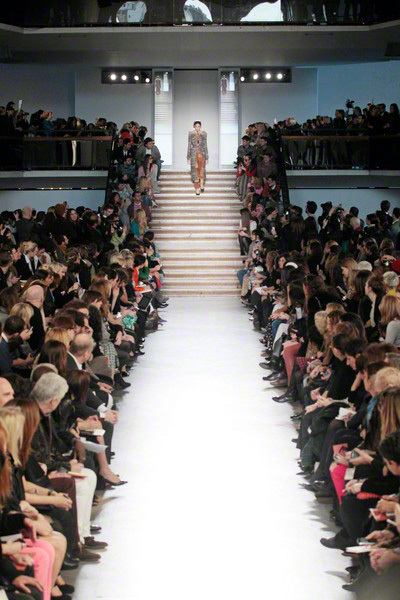 As brand names may be clearly visible again and ‘logomania’ might even become bigger next year. 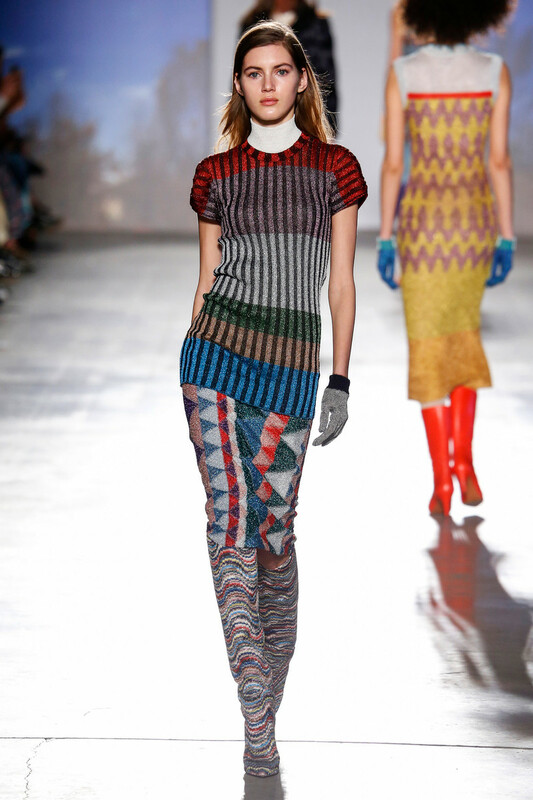 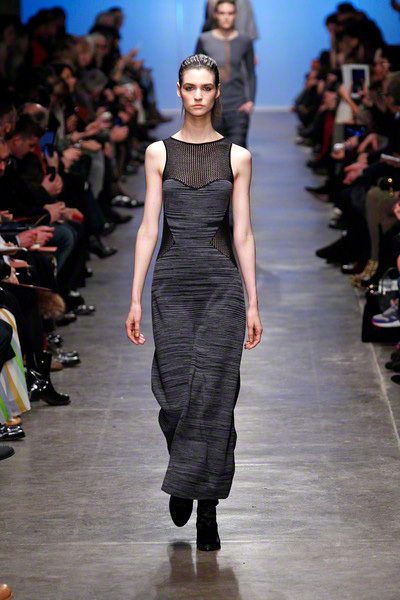 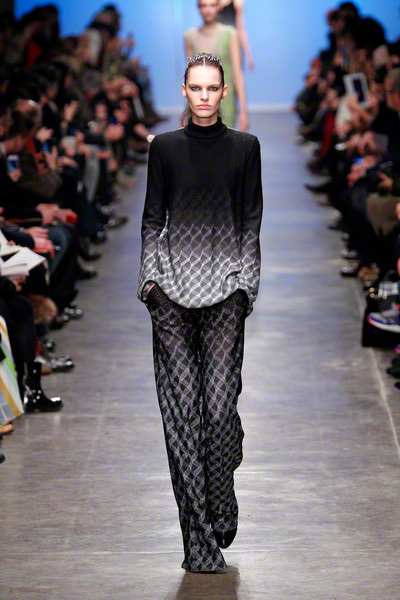 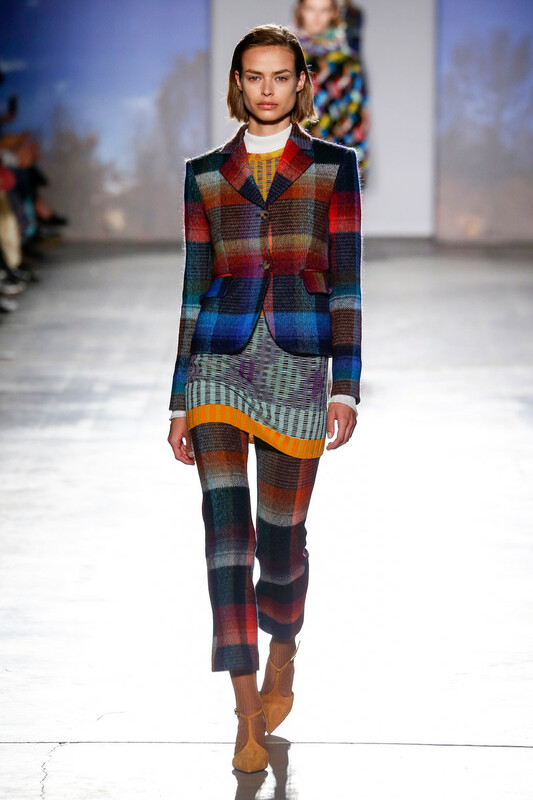 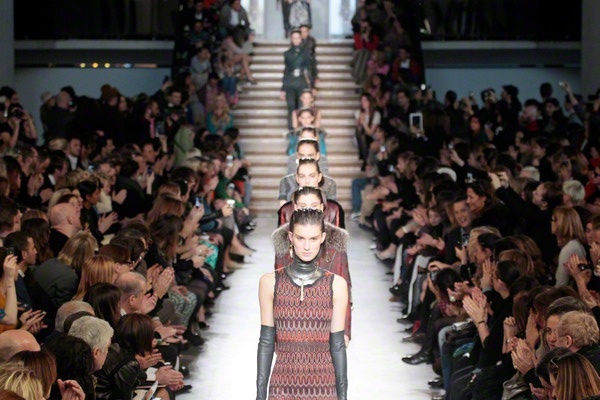 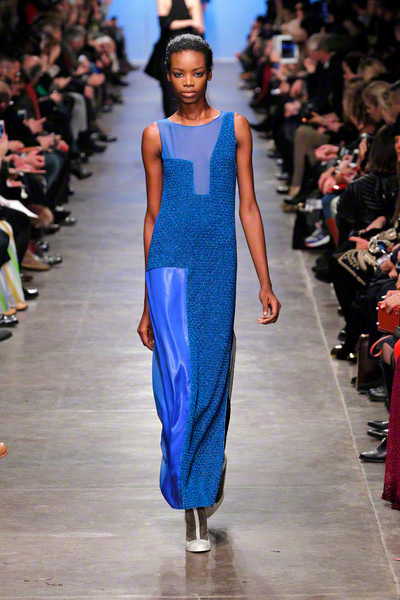 Long, lean silhouettes determined the Missoni fall/winter collection we saw today. 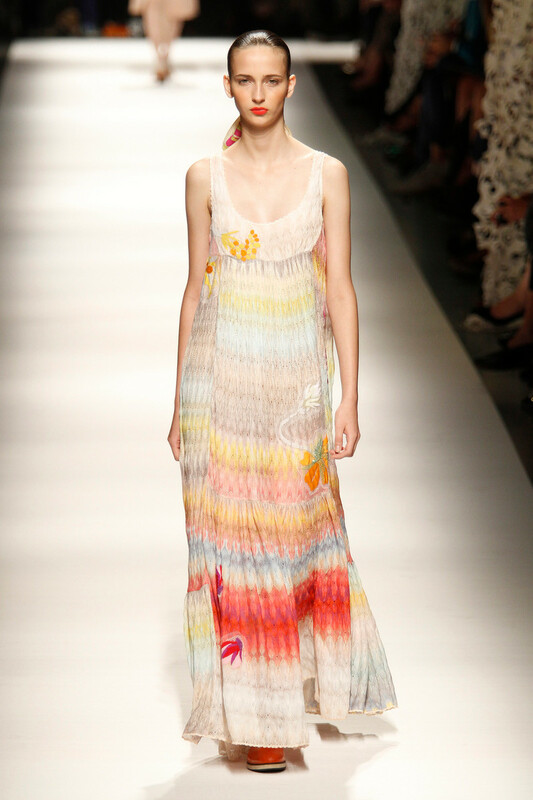 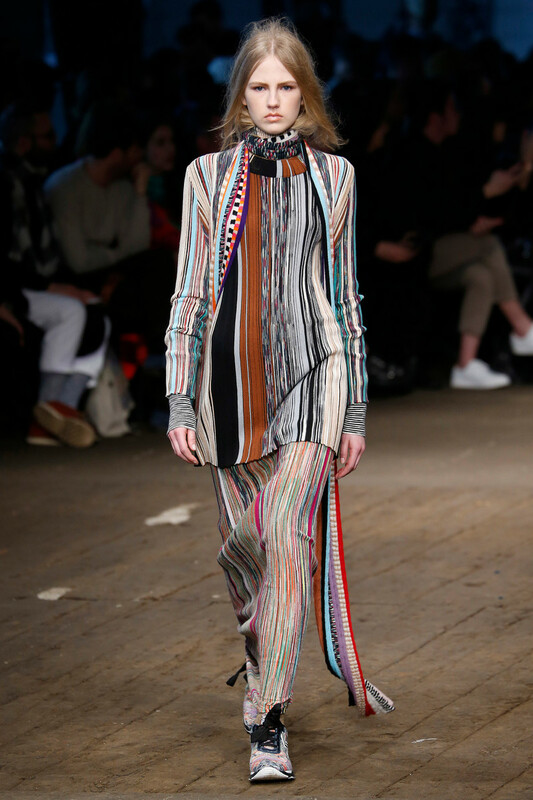 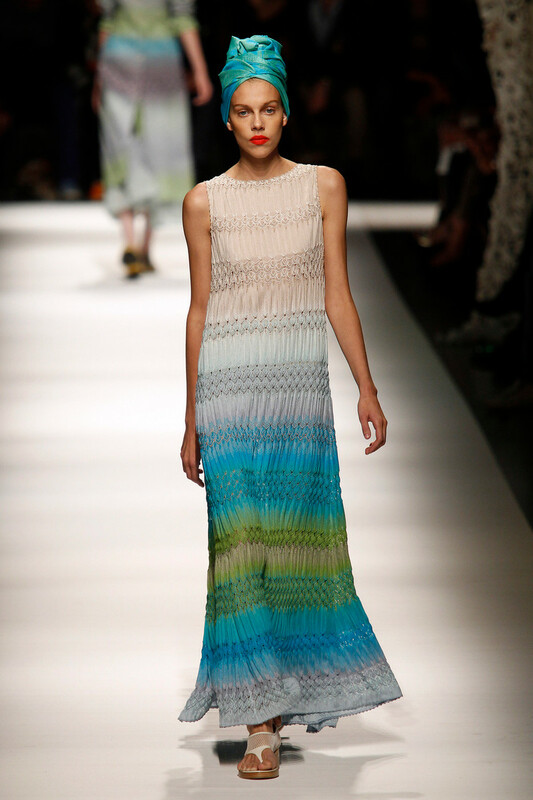 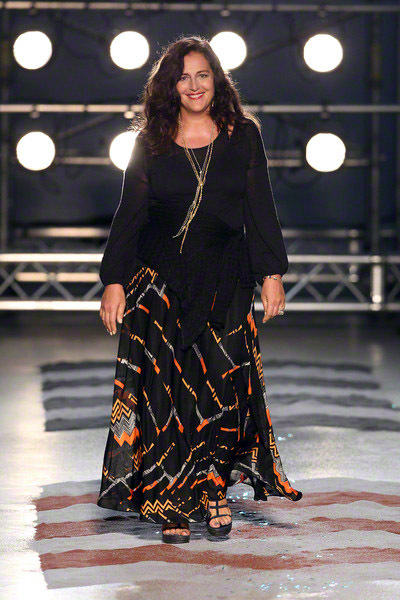 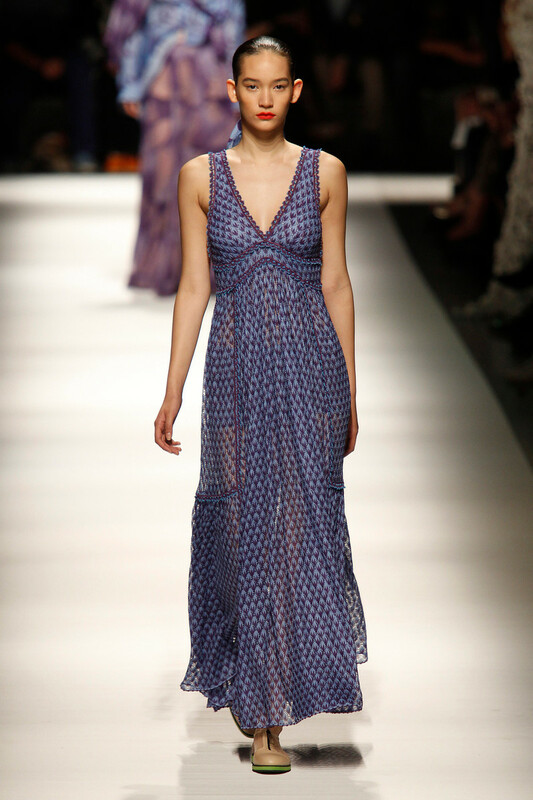 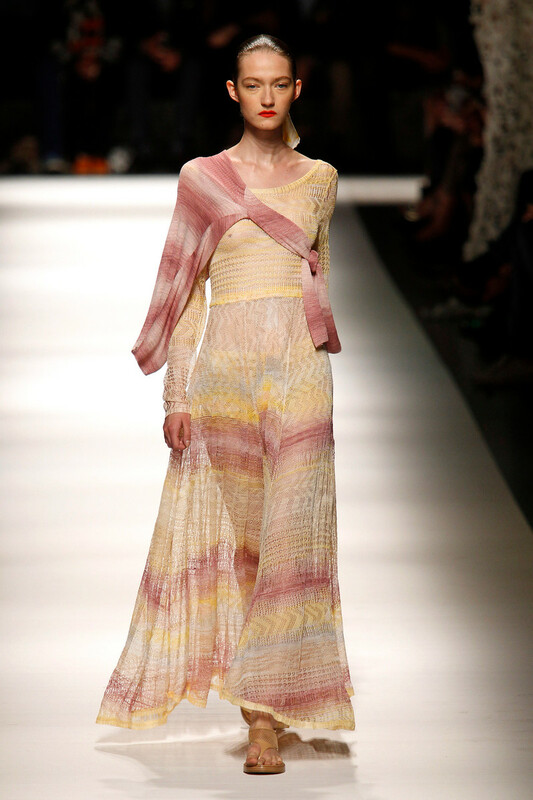 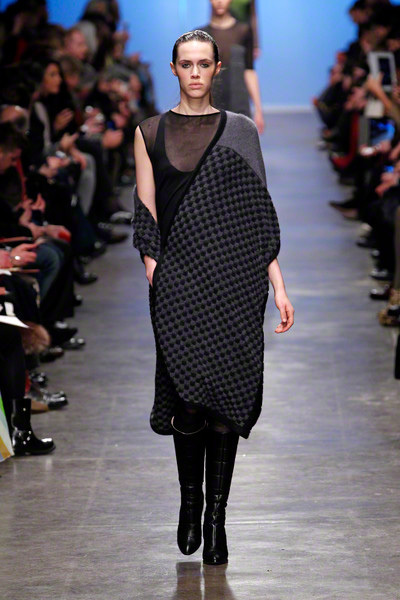 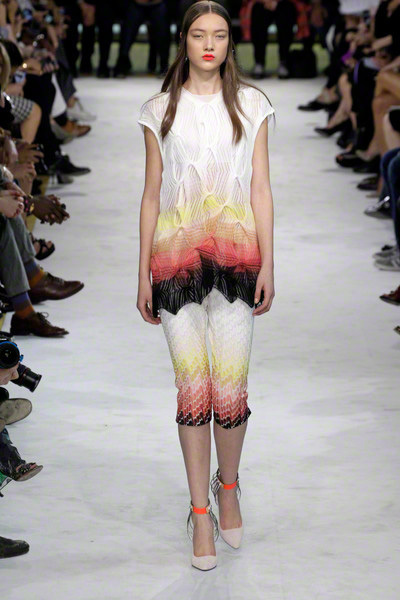 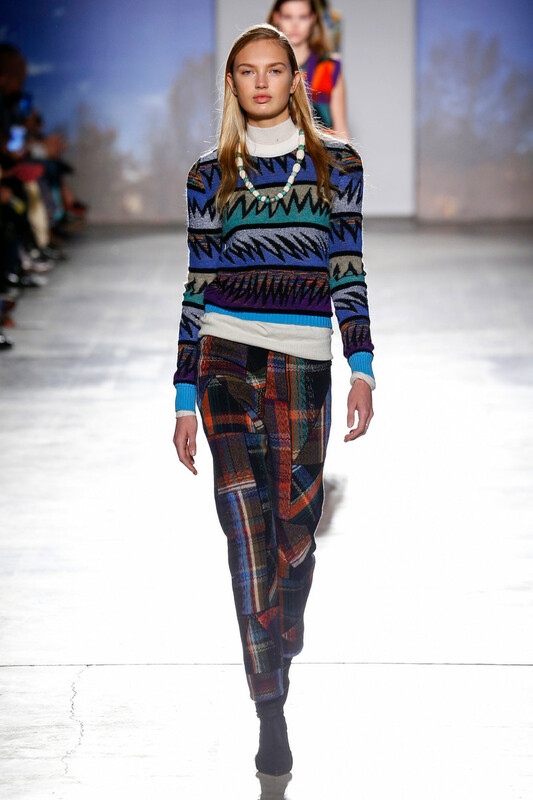 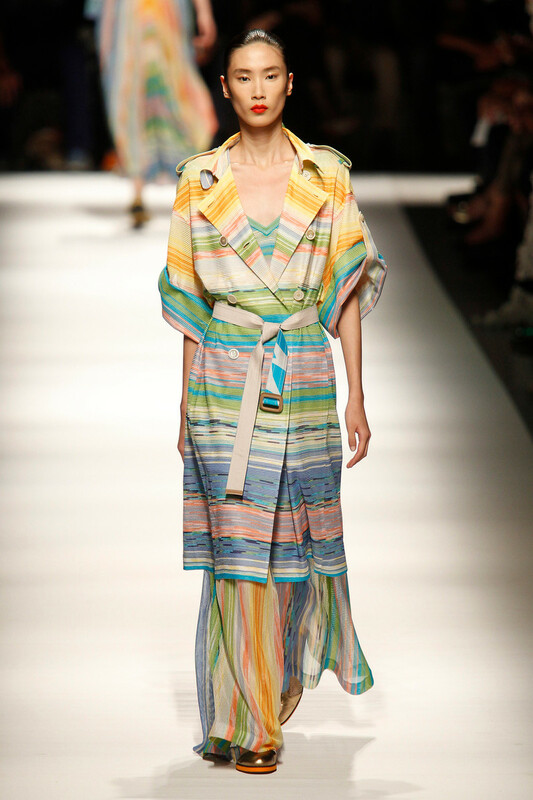 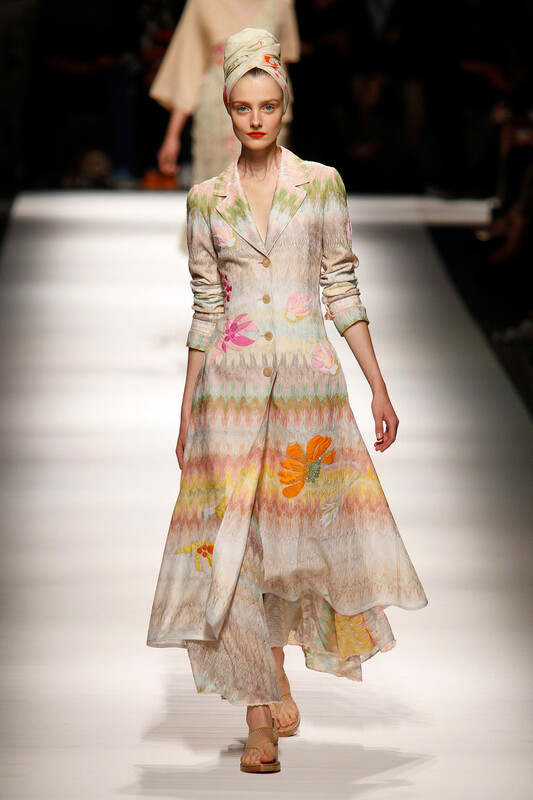 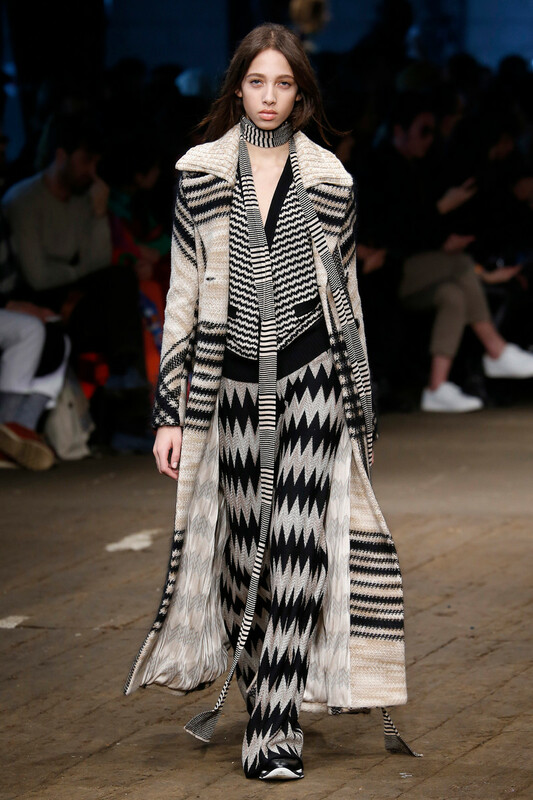 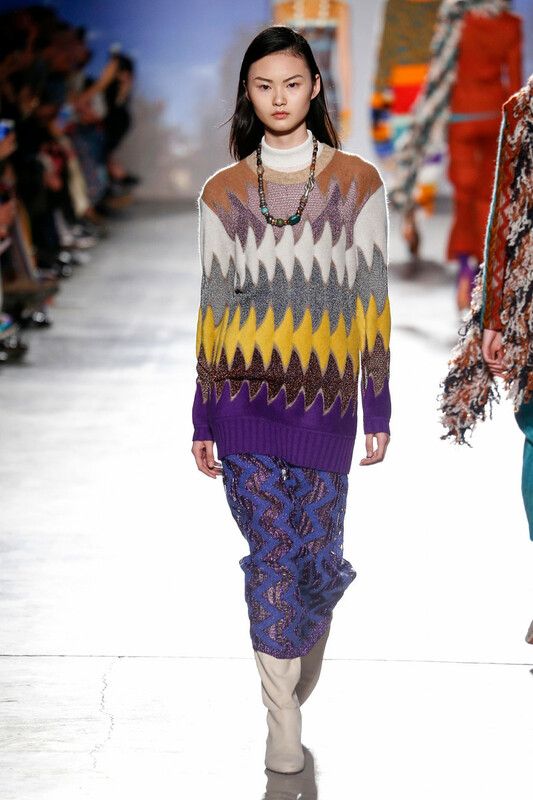 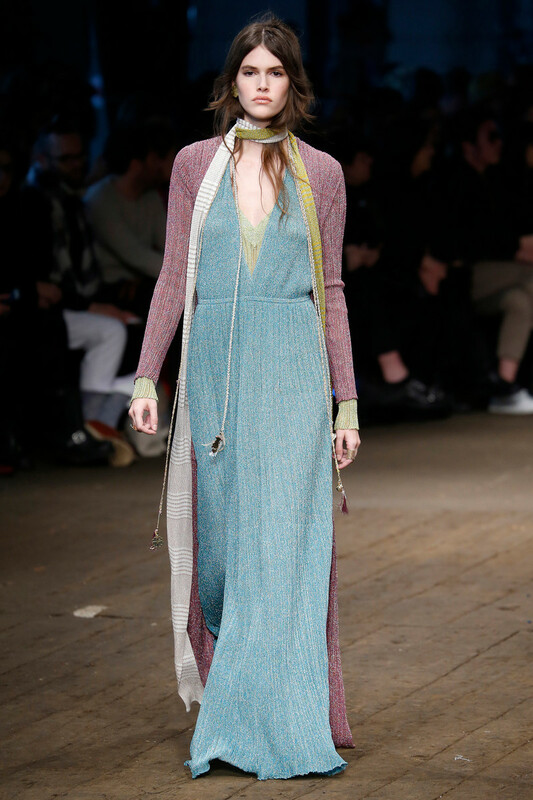 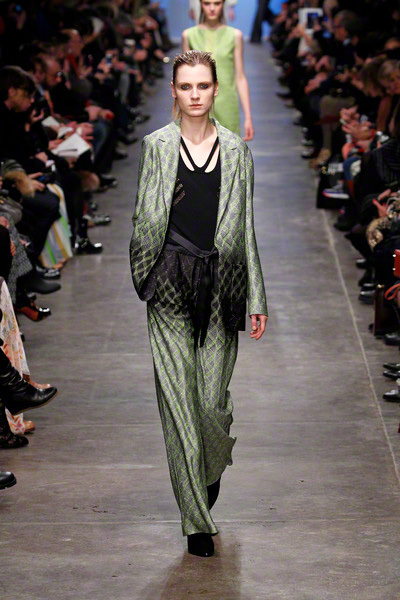 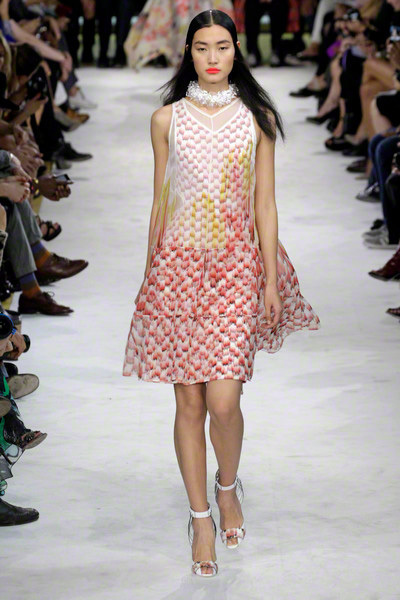 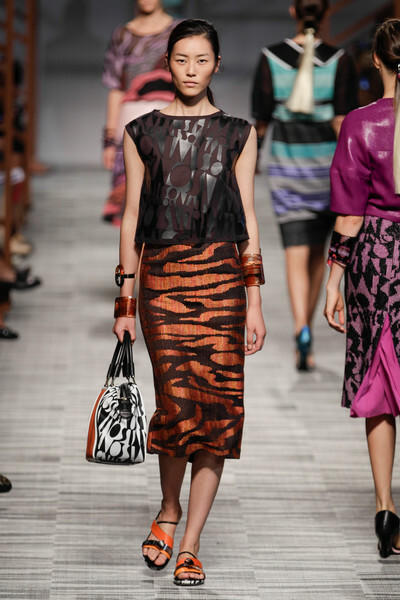 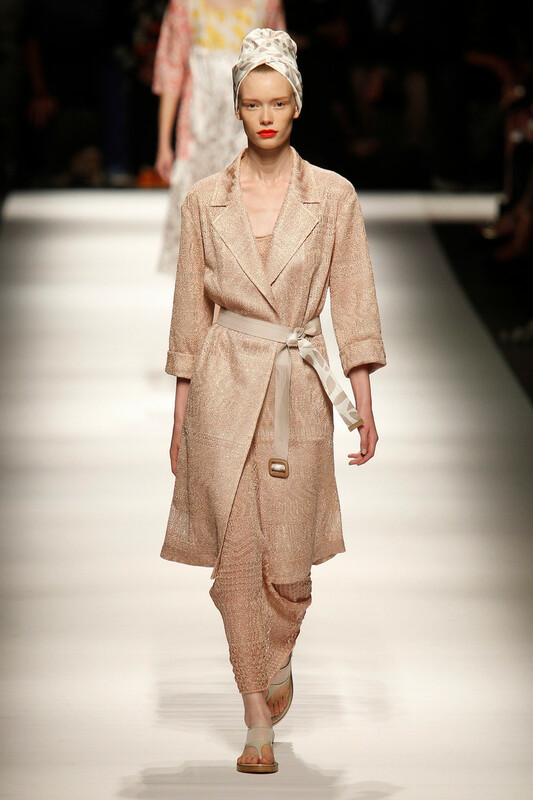 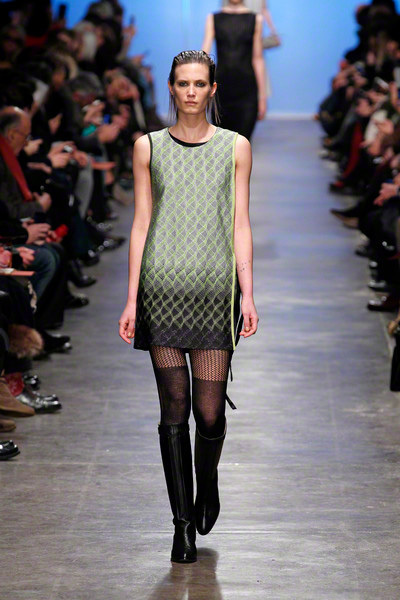 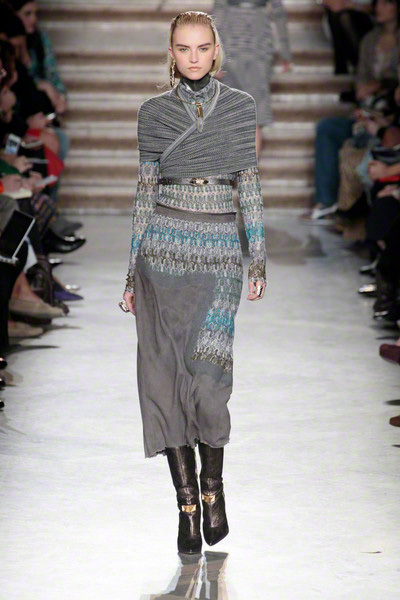 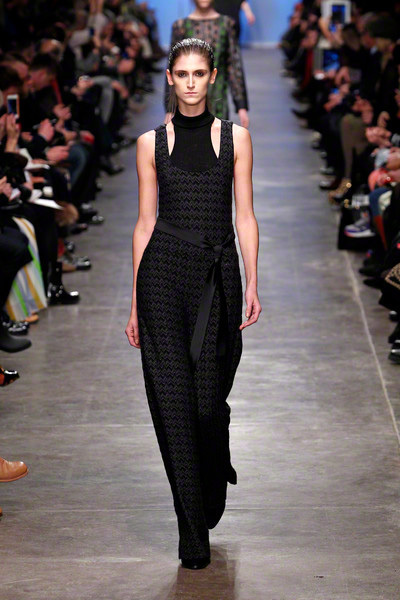 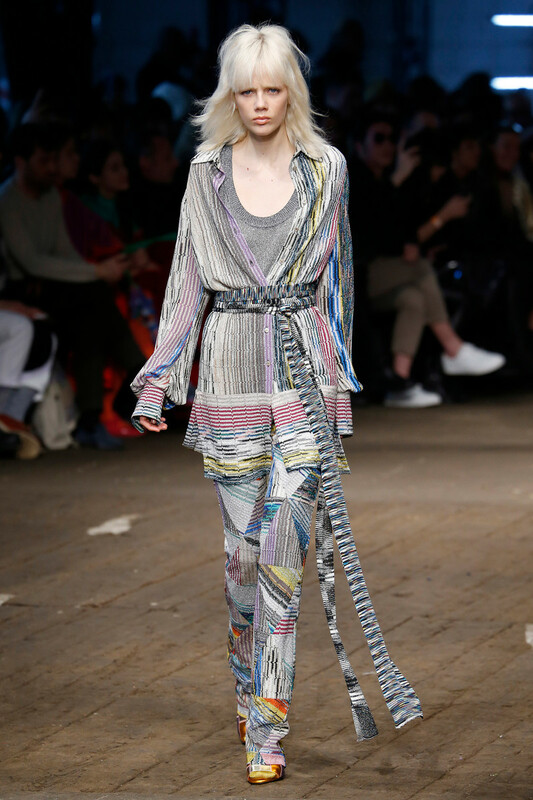 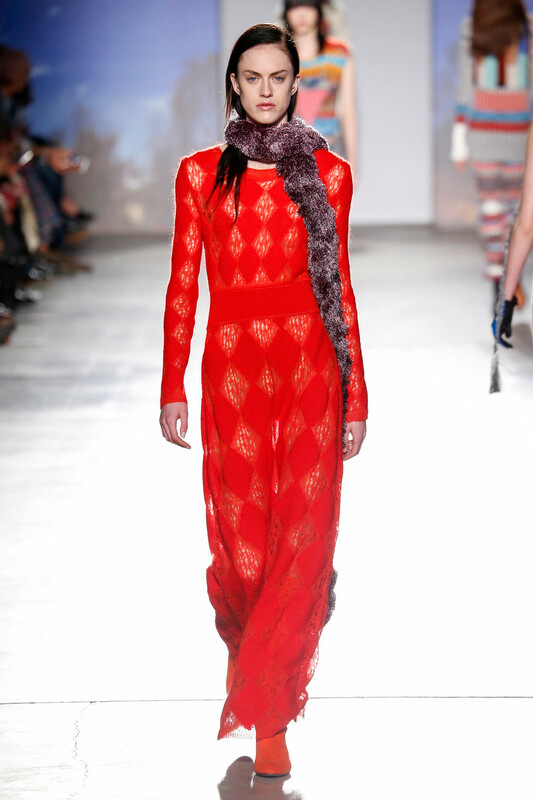 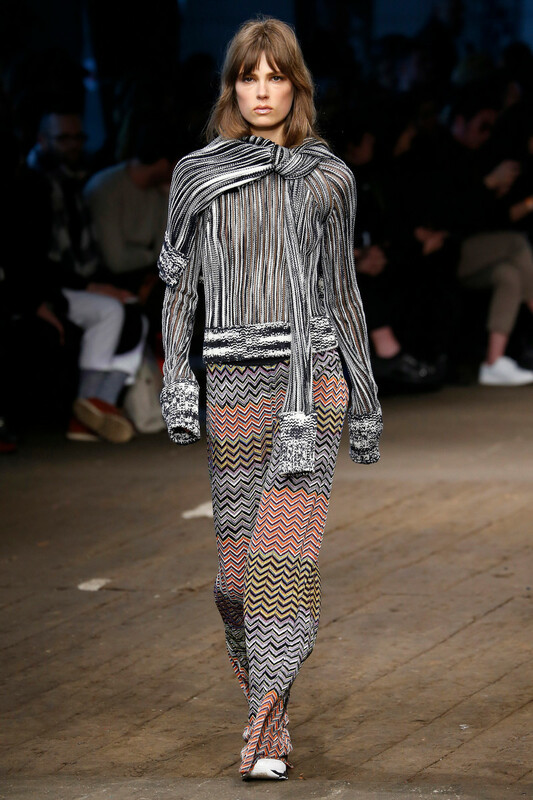 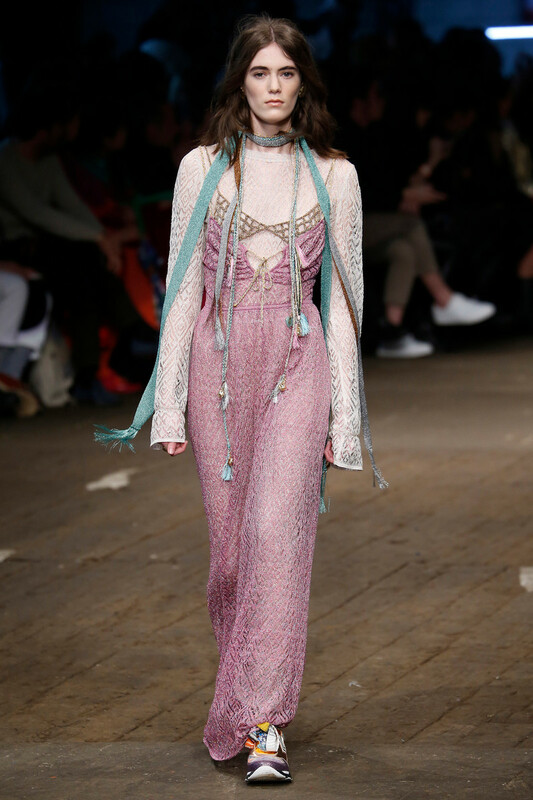 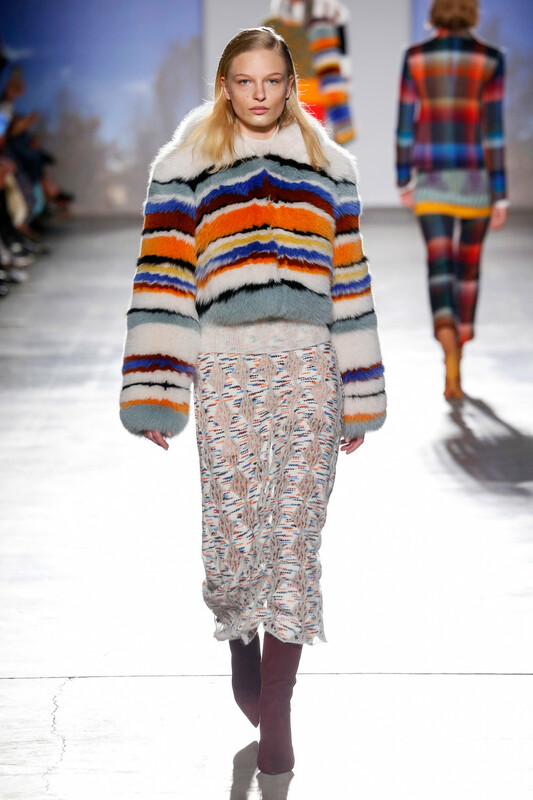 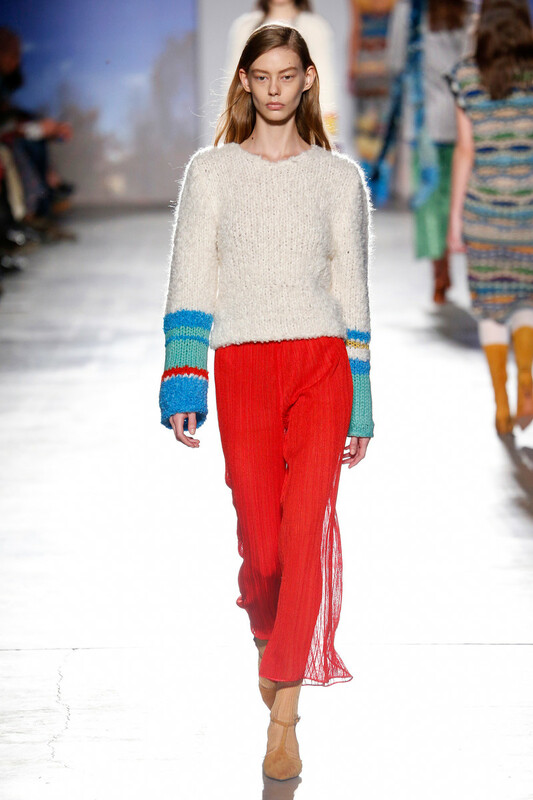 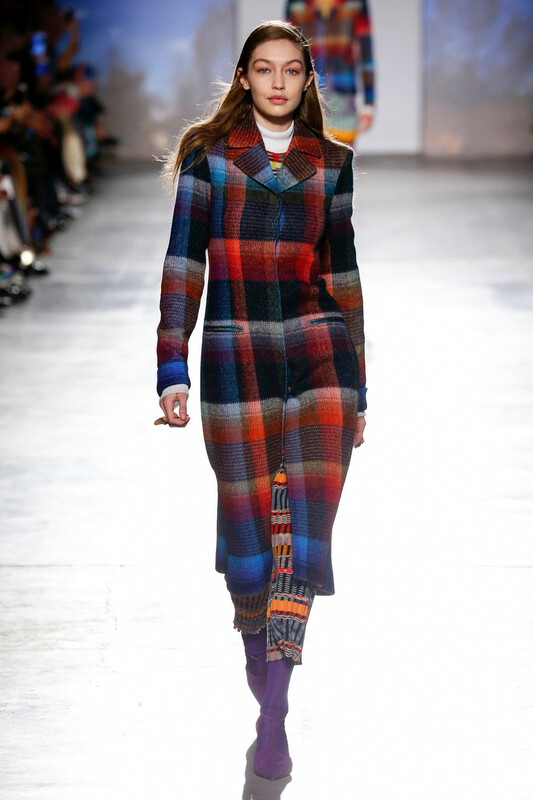 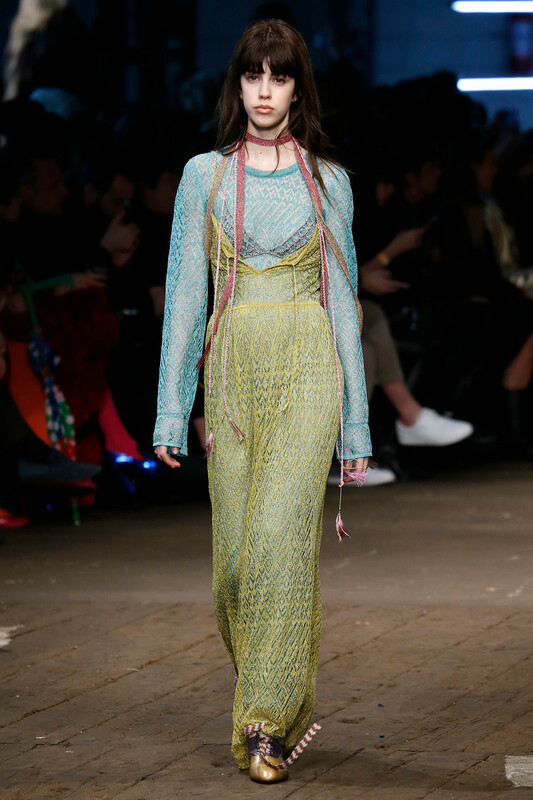 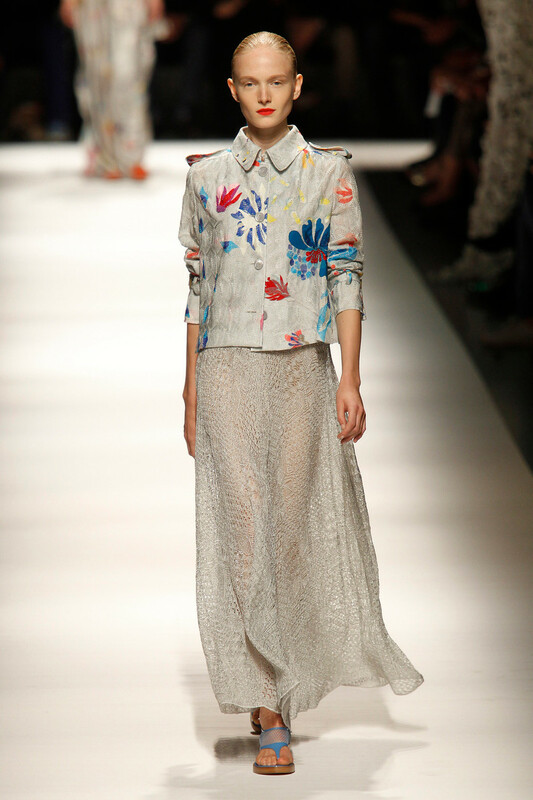 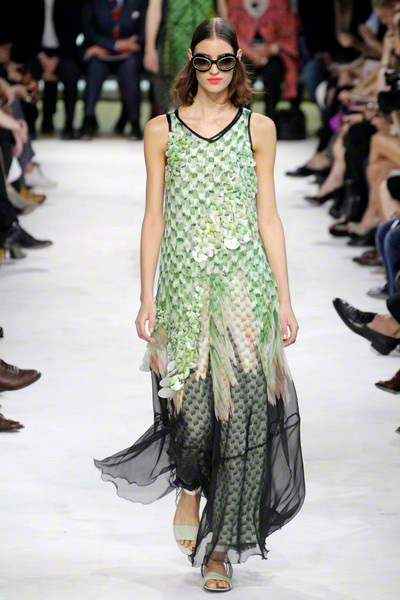 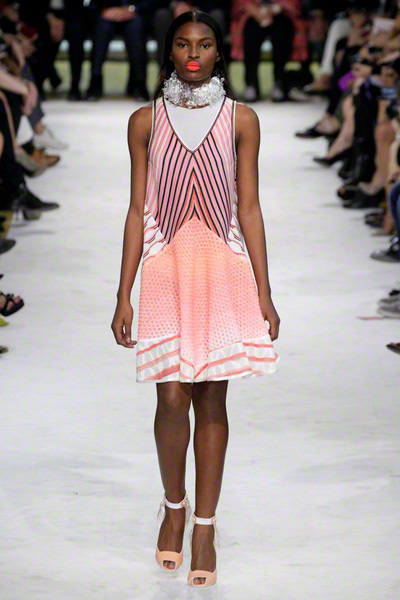 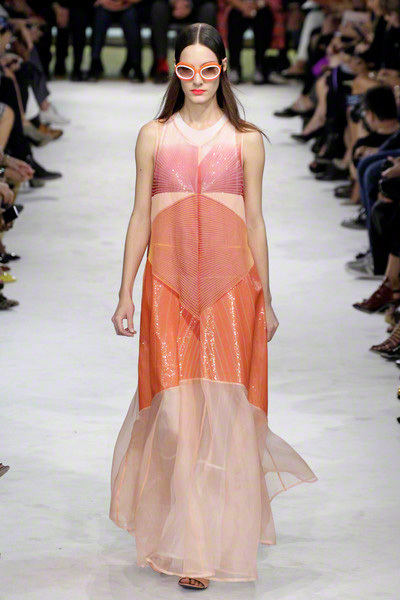 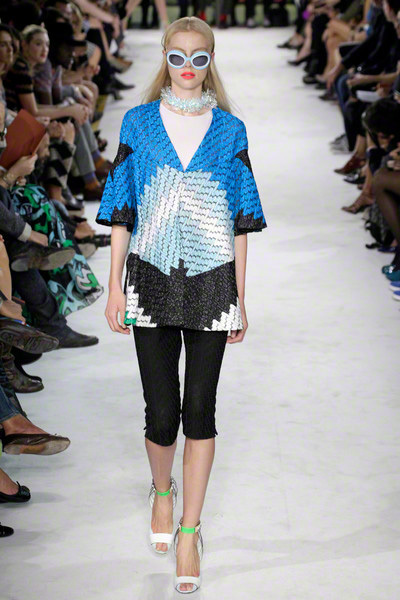 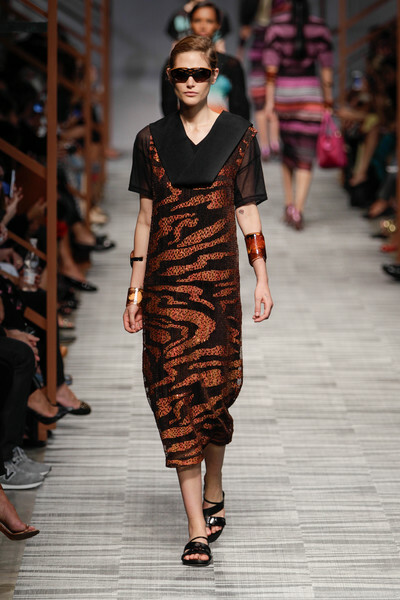 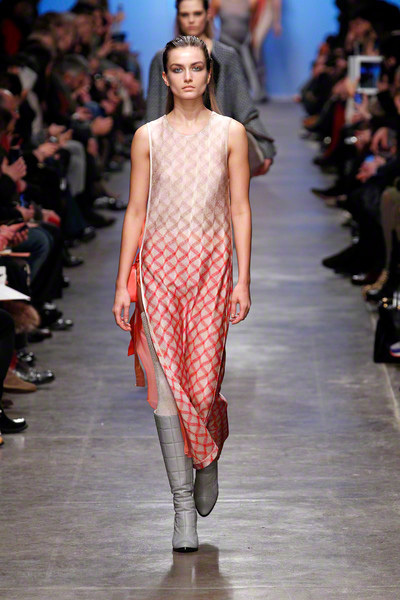 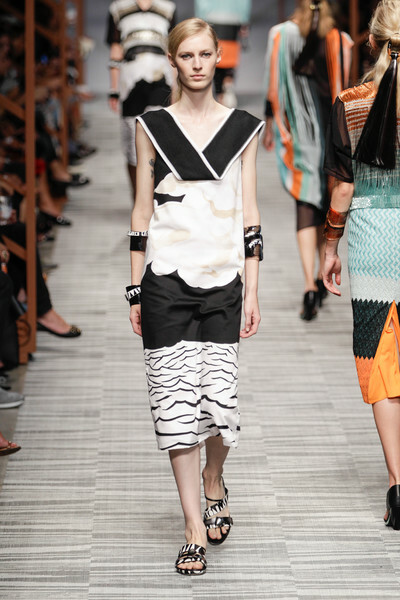 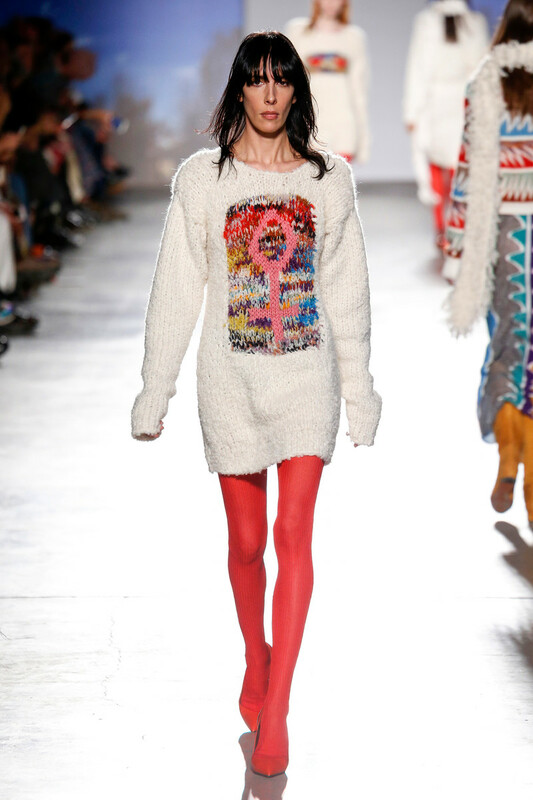 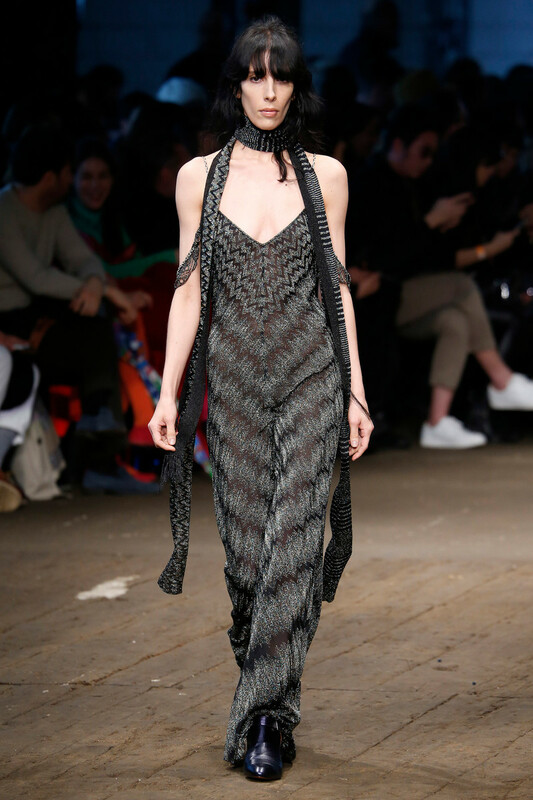 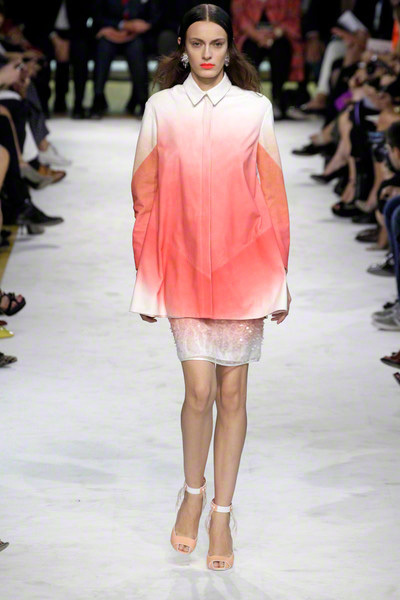 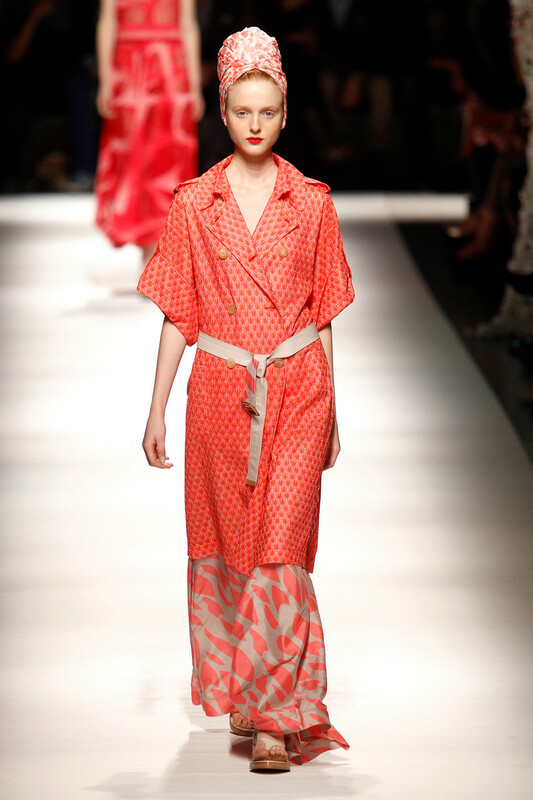 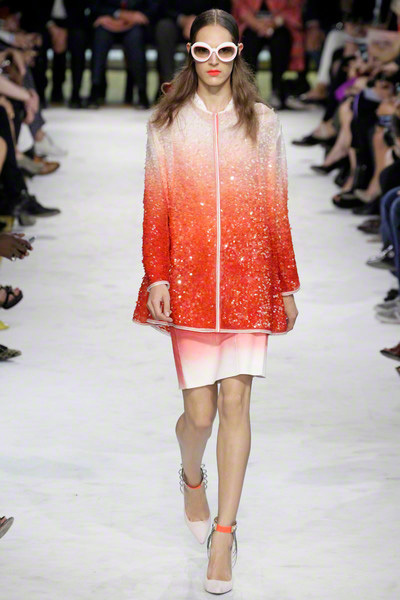 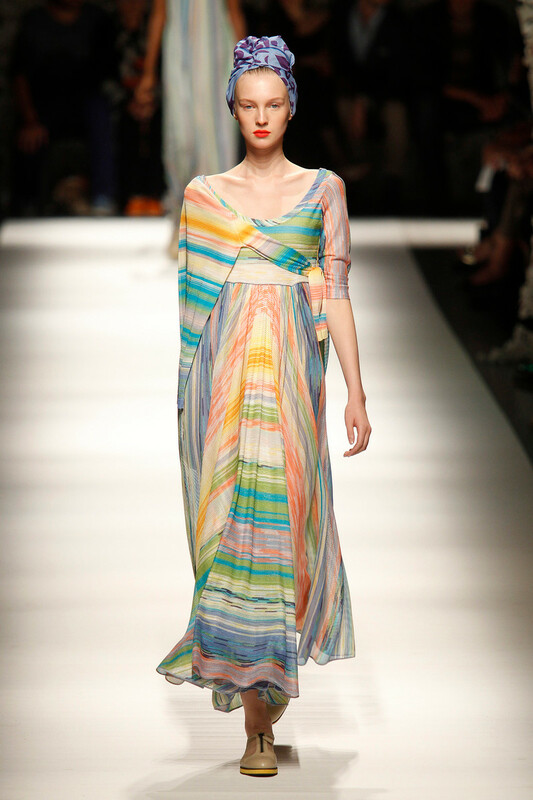 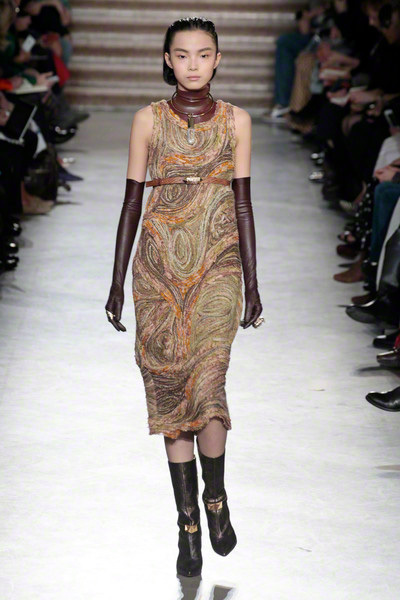 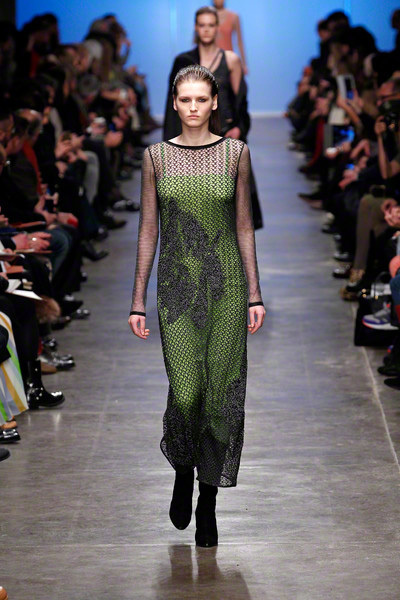 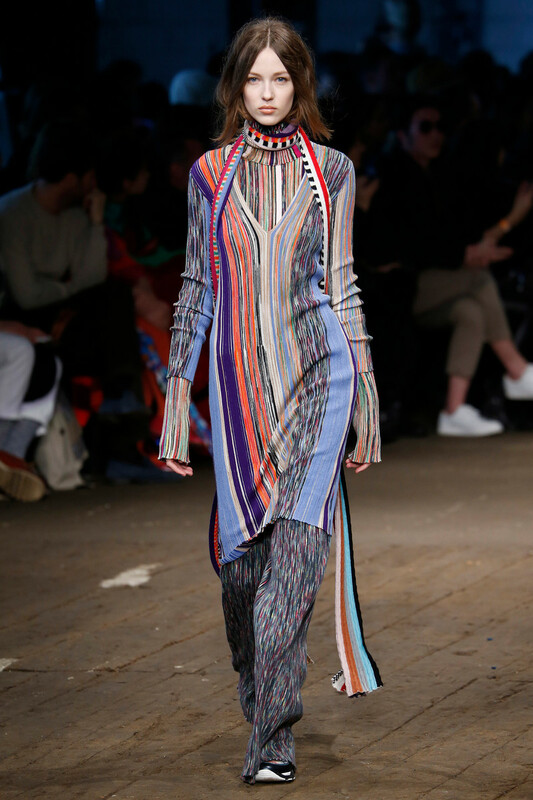 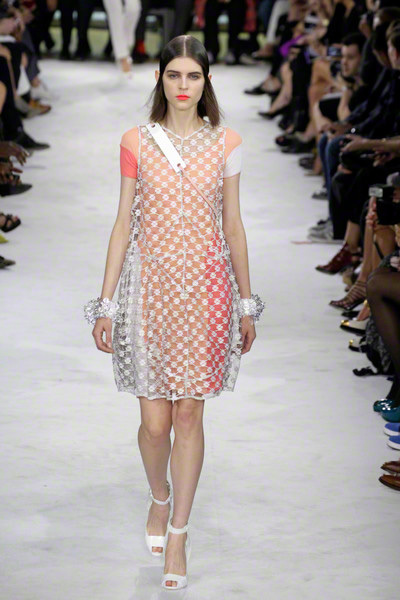 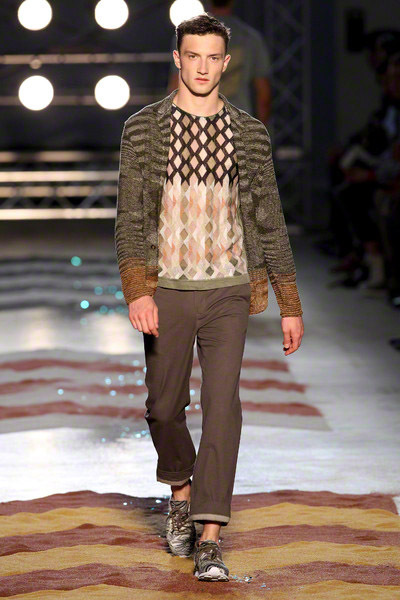 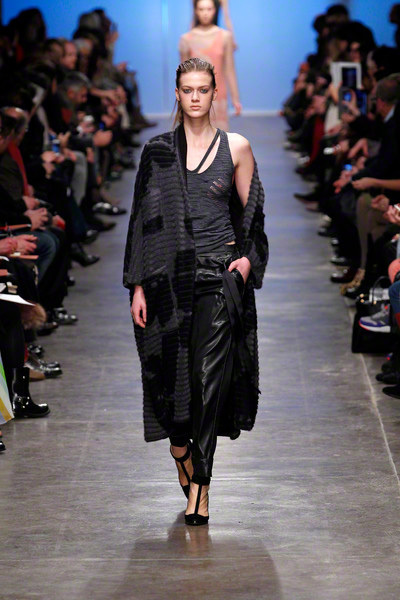 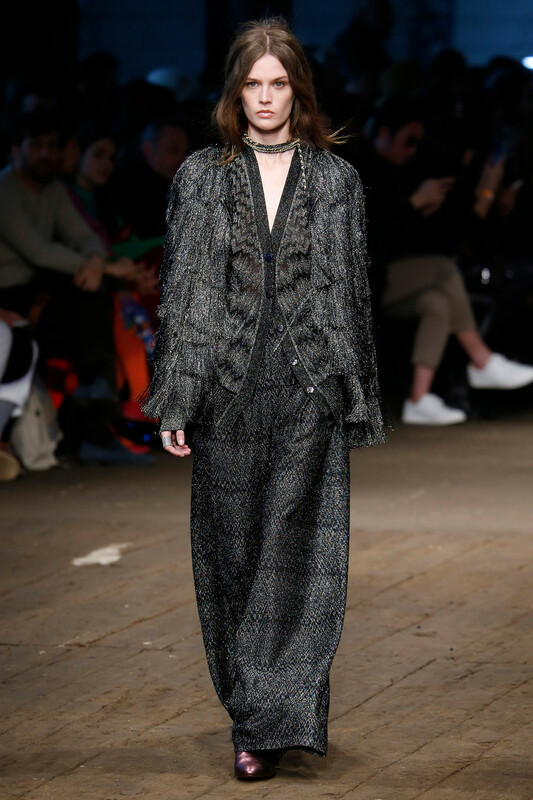 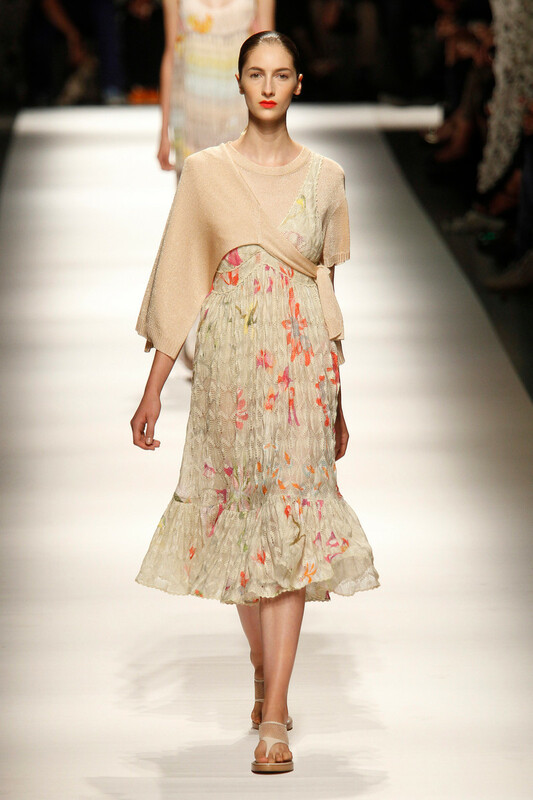 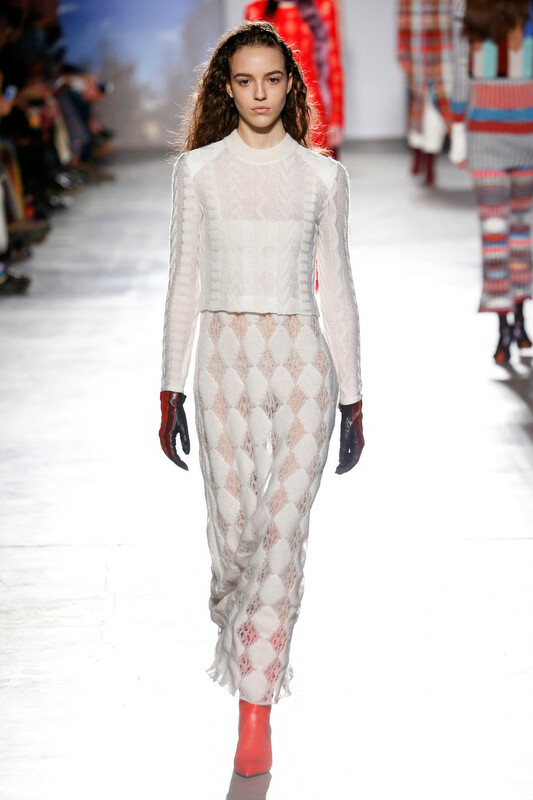 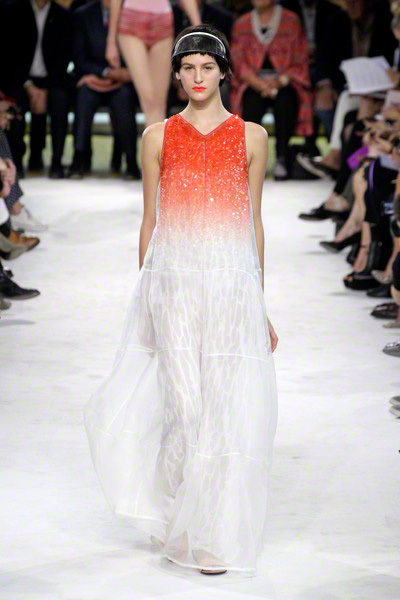 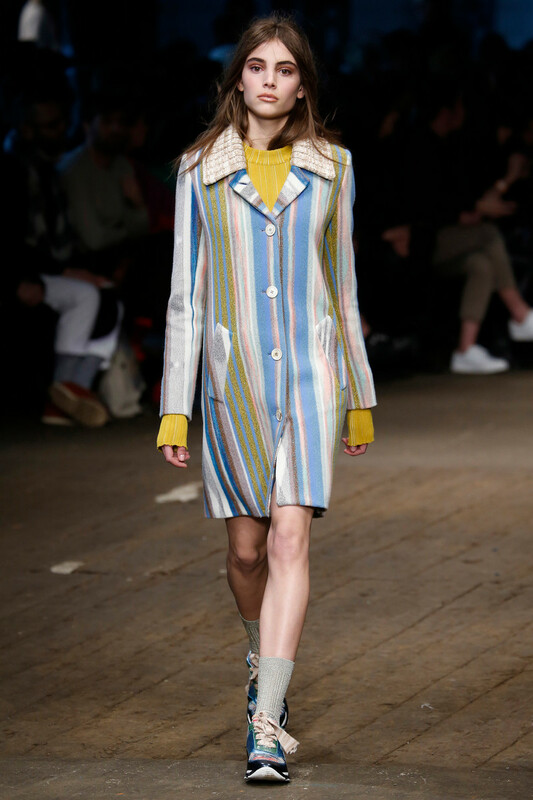 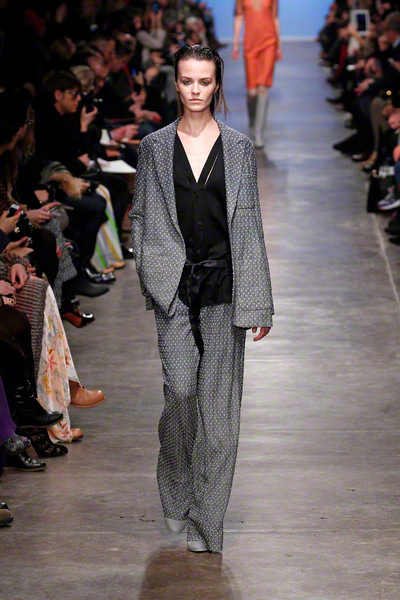 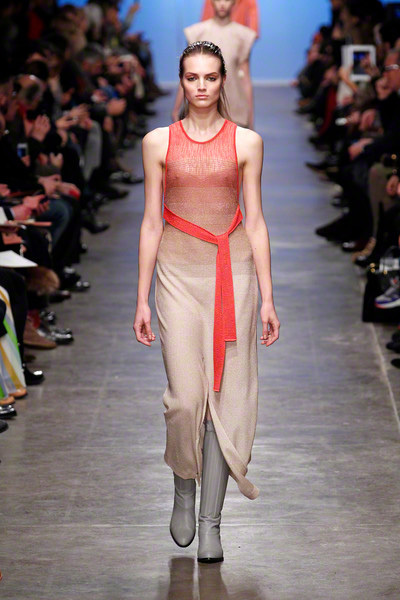 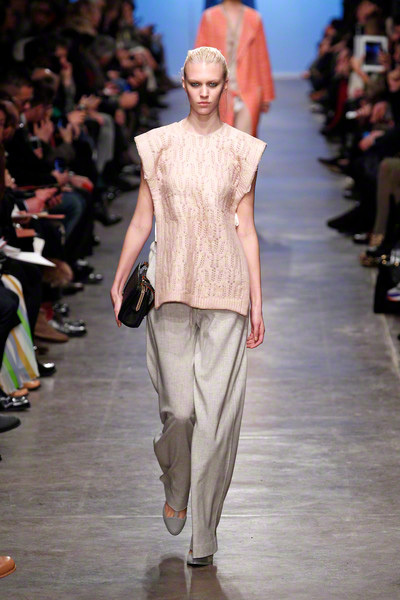 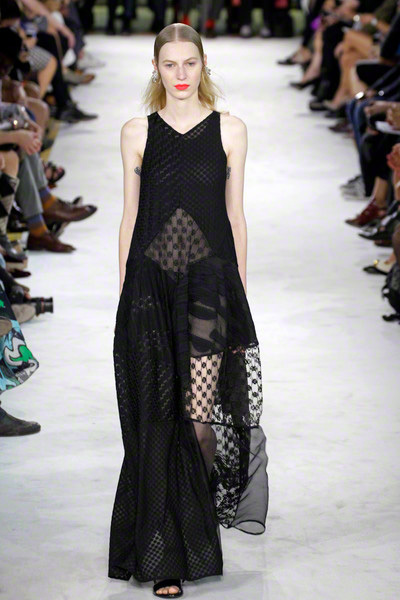 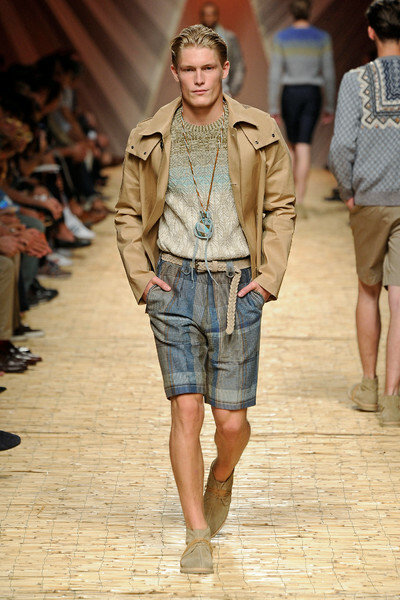 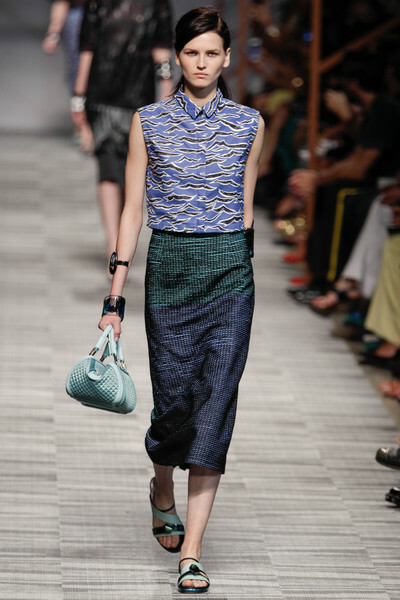 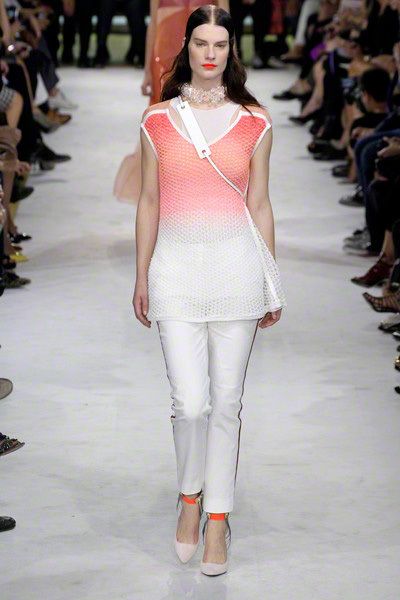 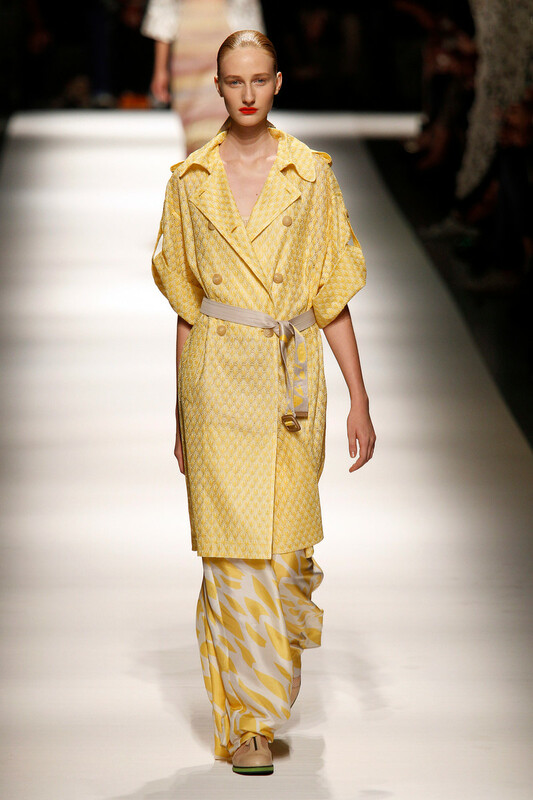 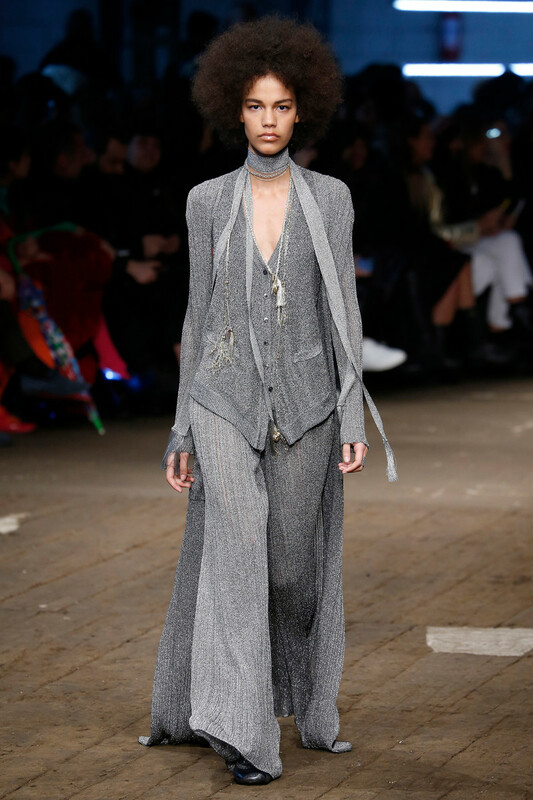 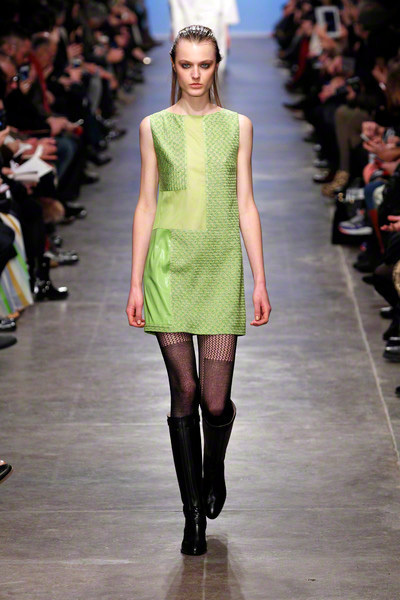 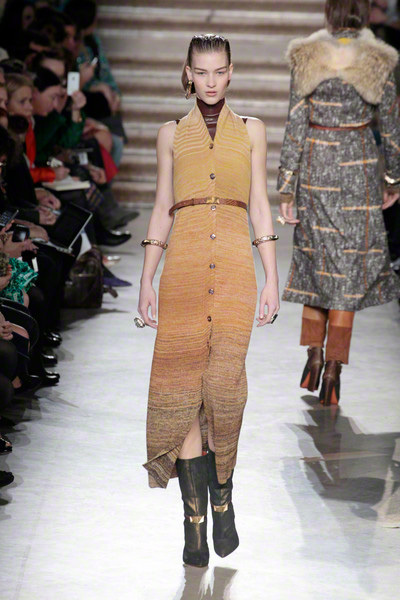 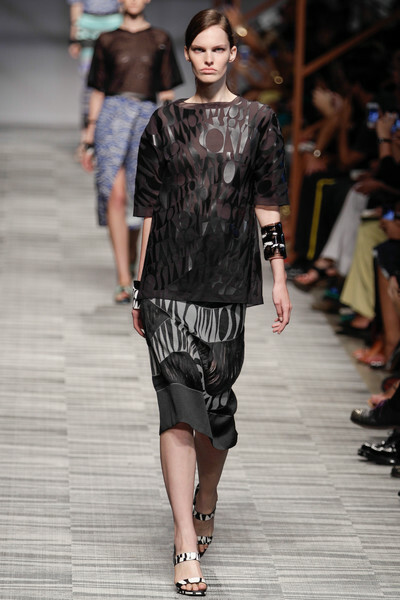 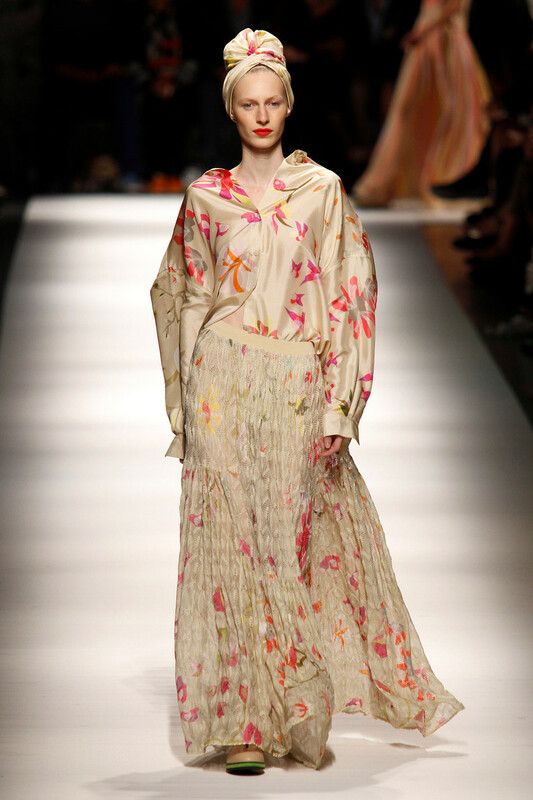 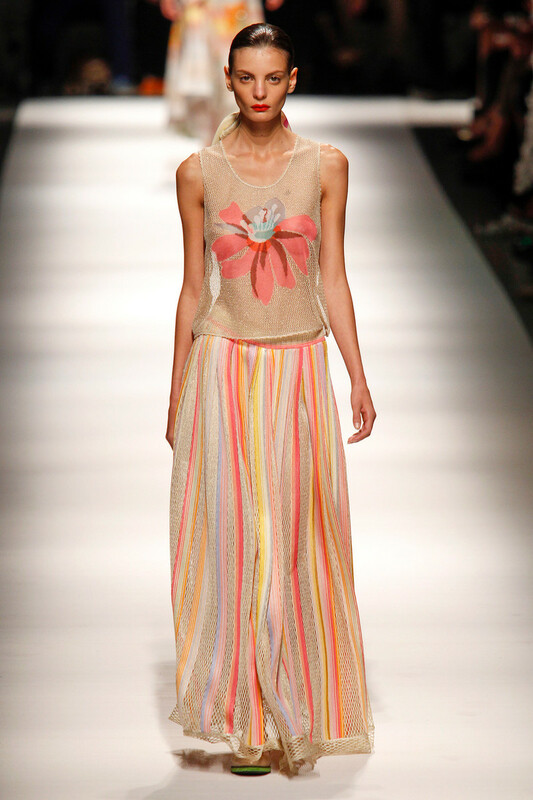 And while the looks were very feminine, Angela Missoni added a fresh touch of grunge to her outfits. 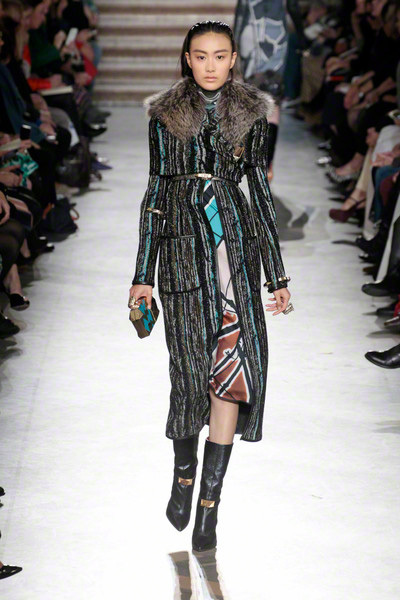 It was visible through the hair (divided into three parts), the eye catching jewellery (large earrings – in one ear – brooches and matching waist belts) and the odd styling (wrongly buttoned vests). 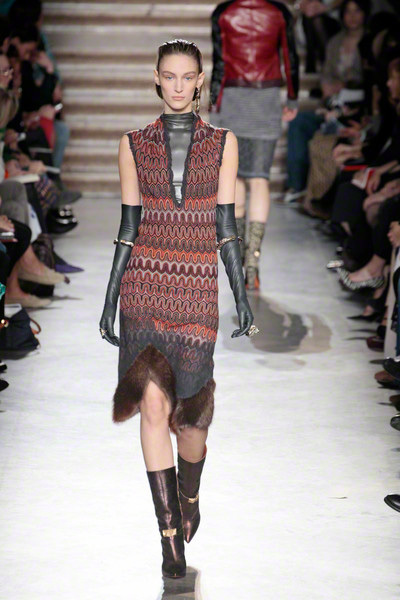 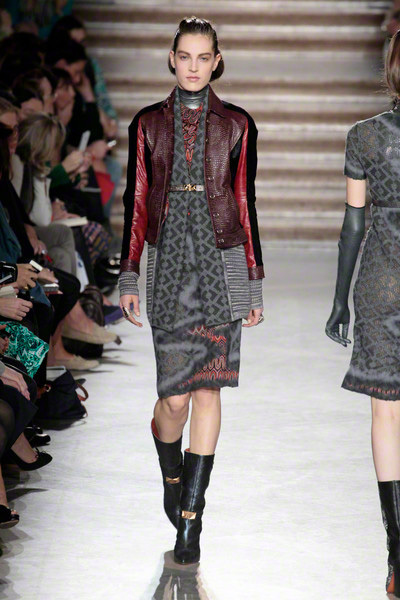 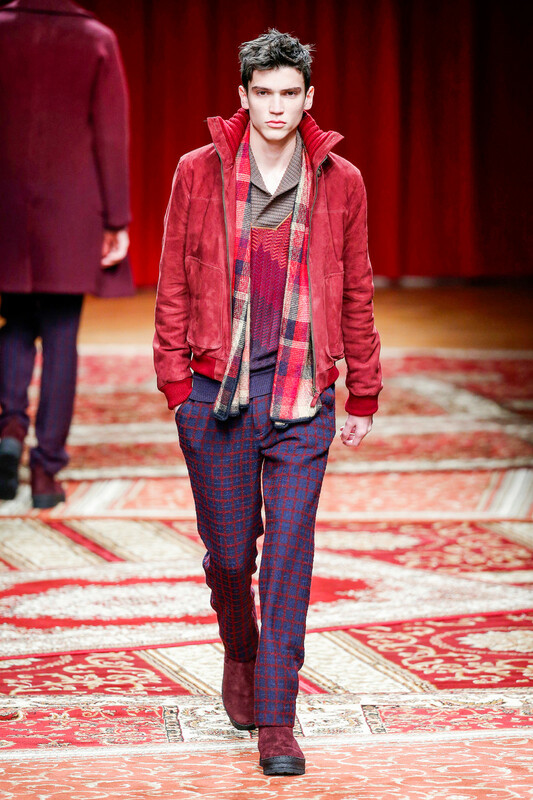 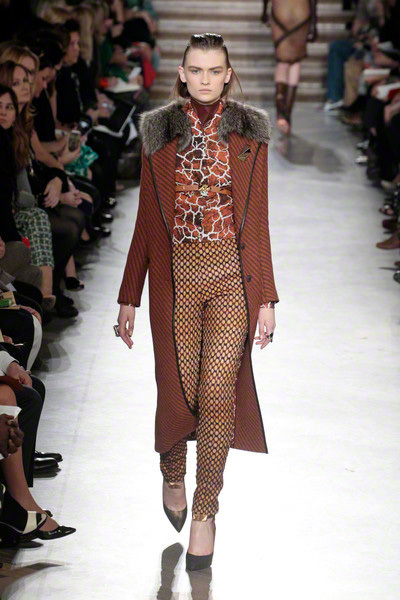 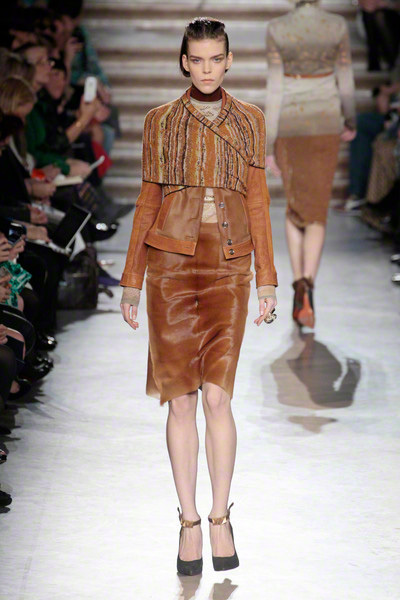 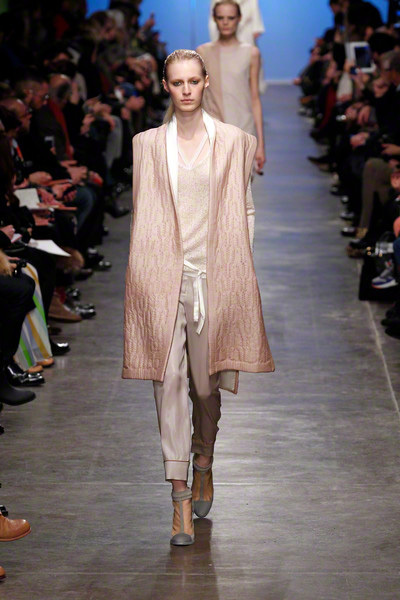 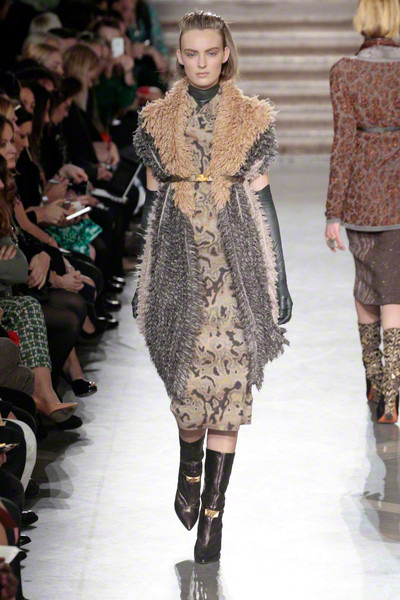 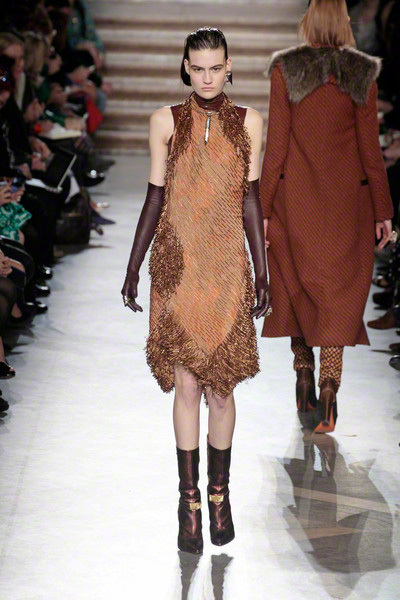 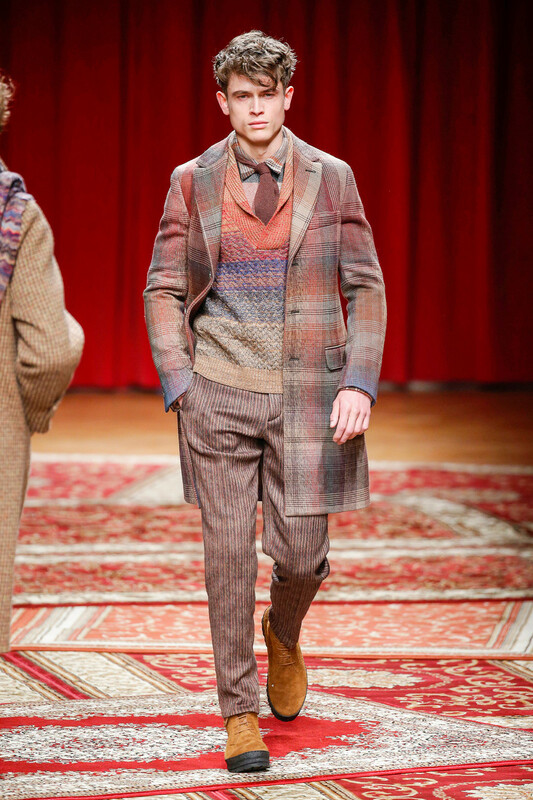 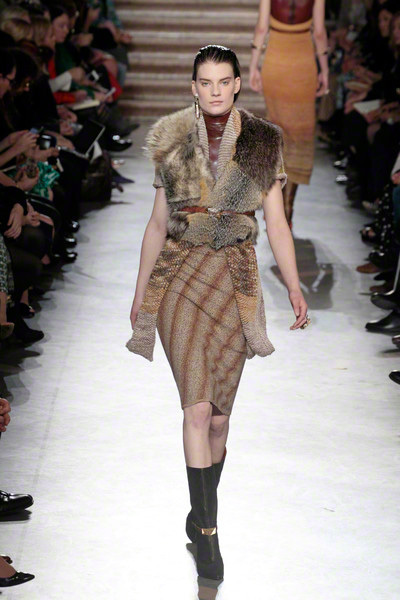 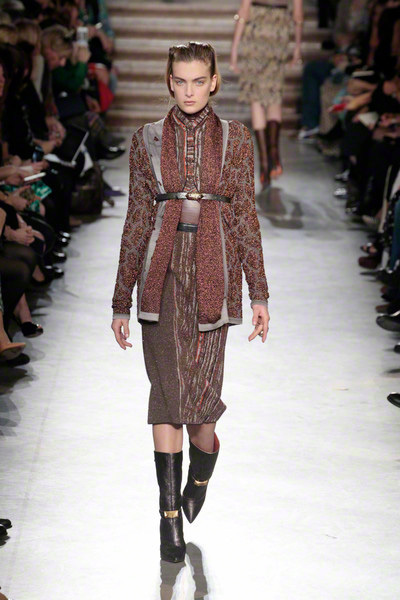 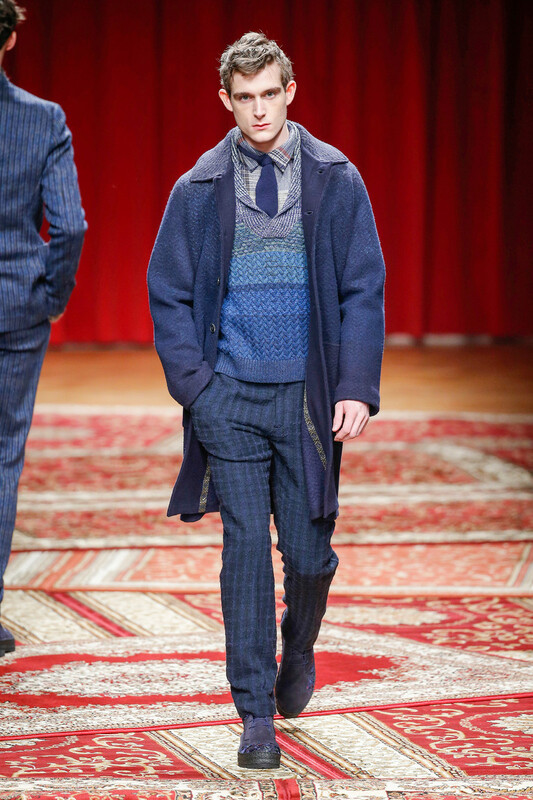 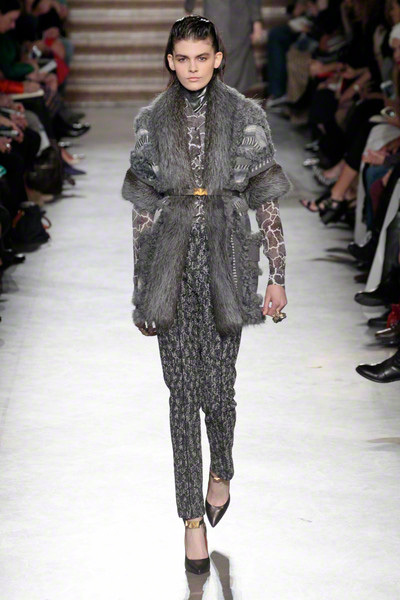 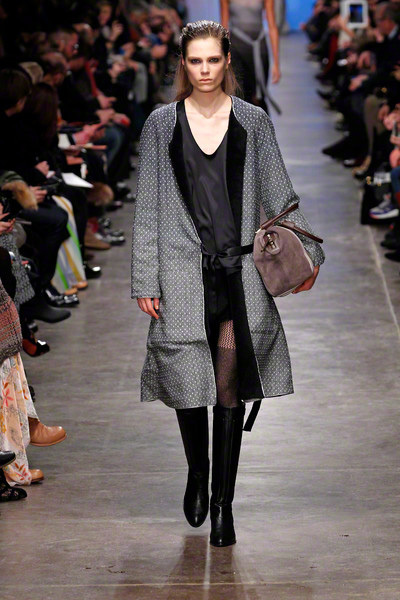 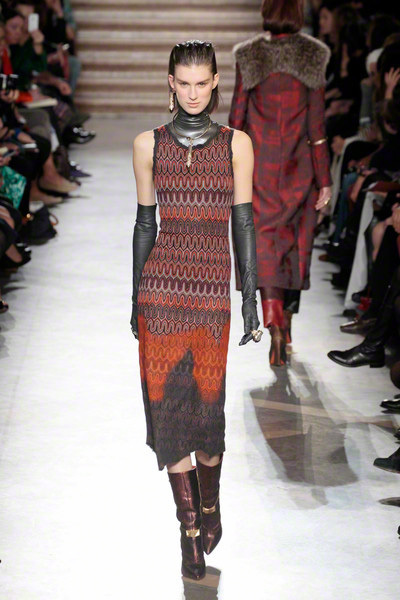 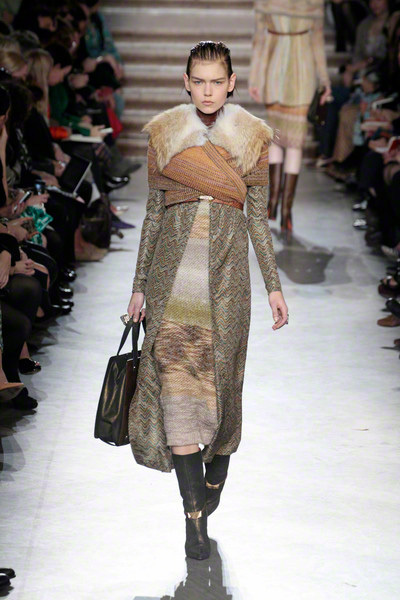 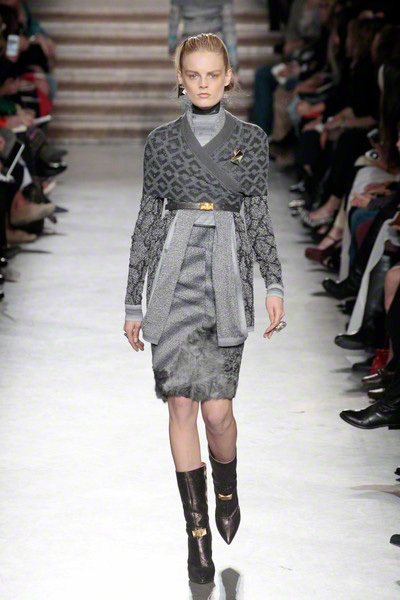 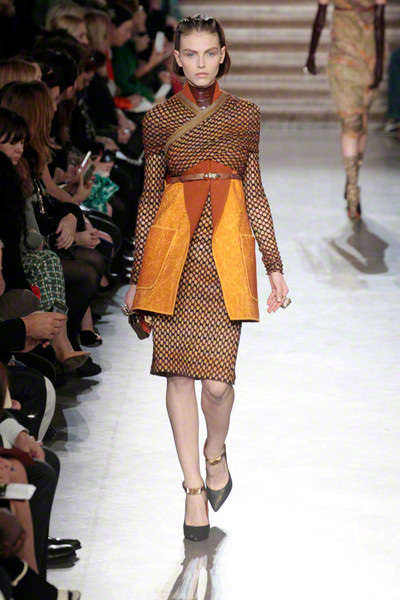 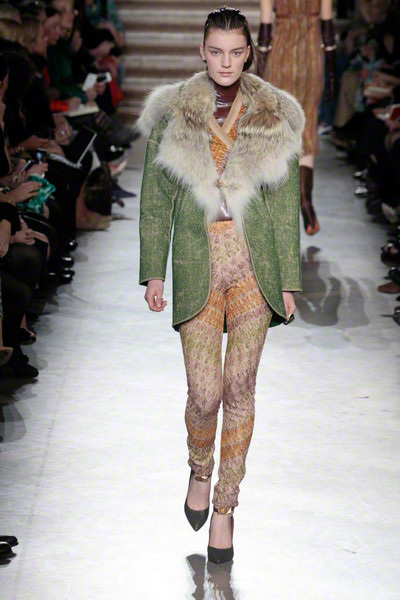 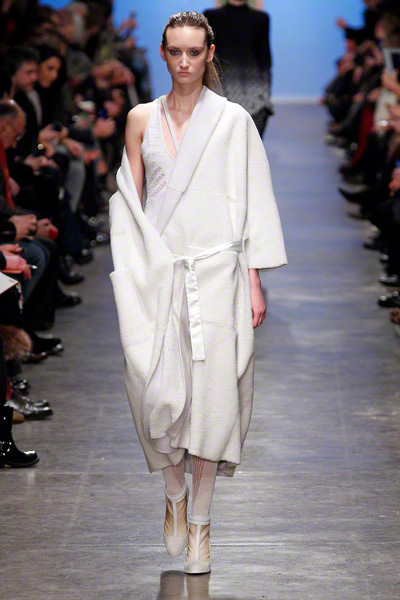 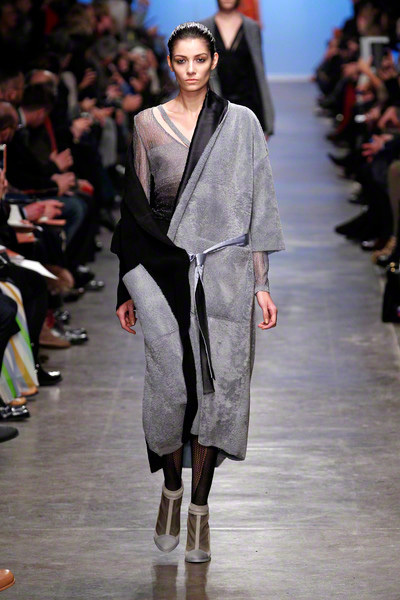 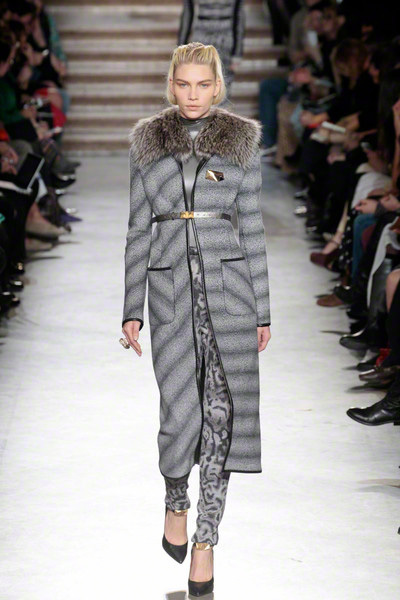 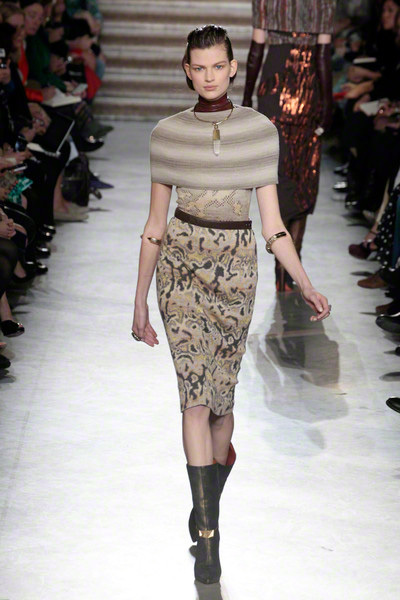 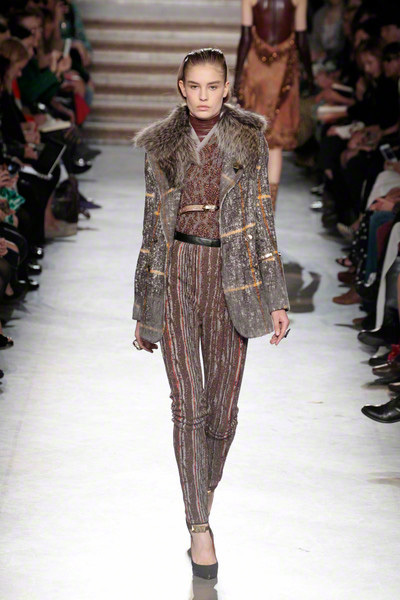 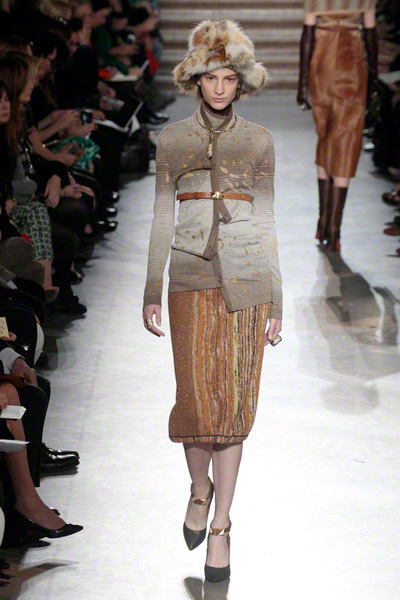 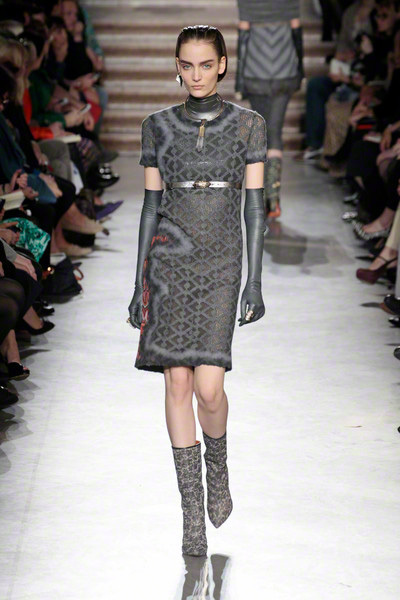 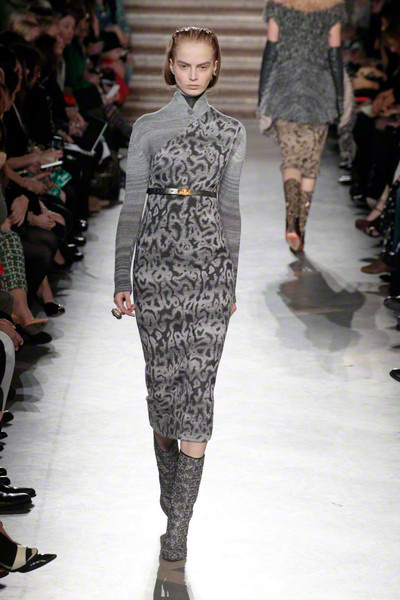 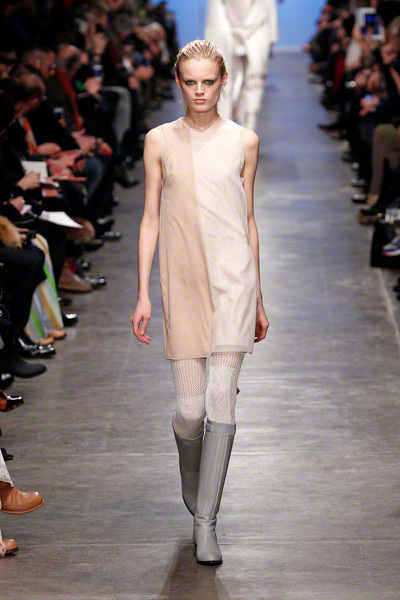 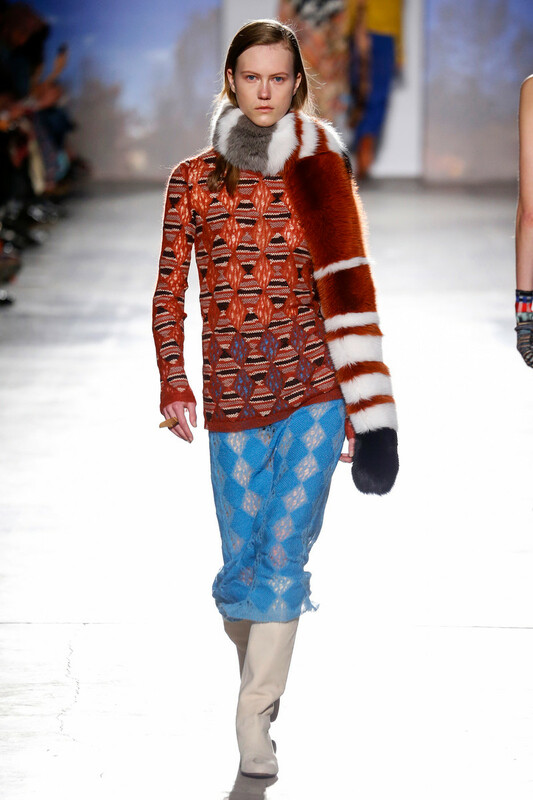 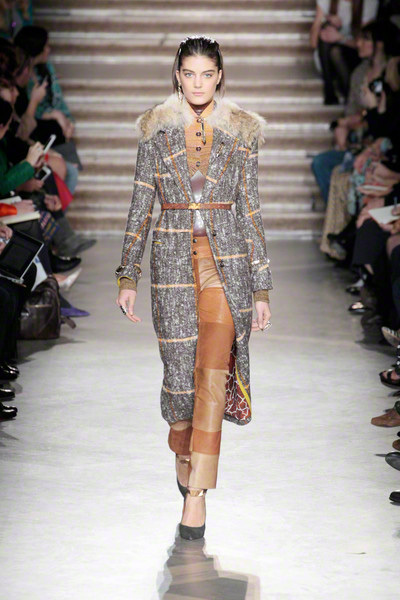 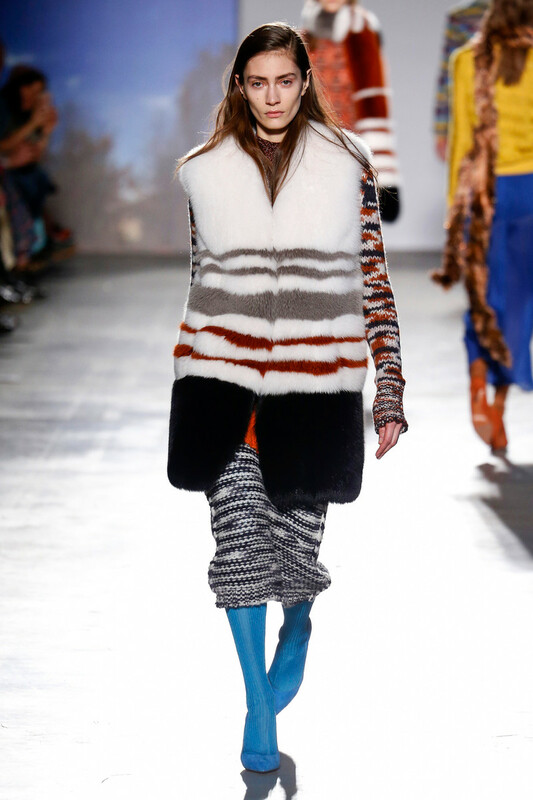 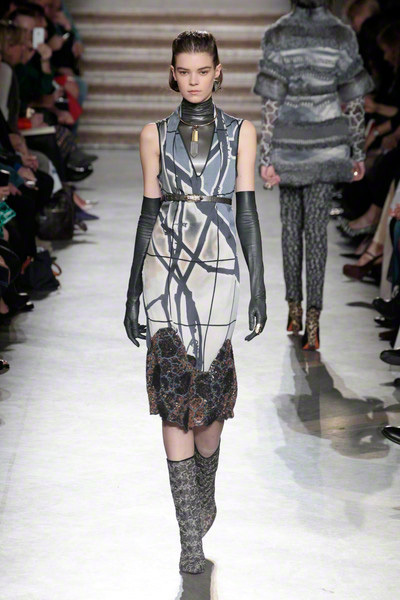 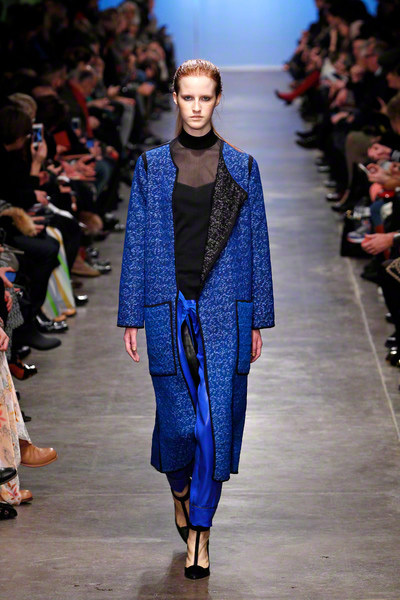 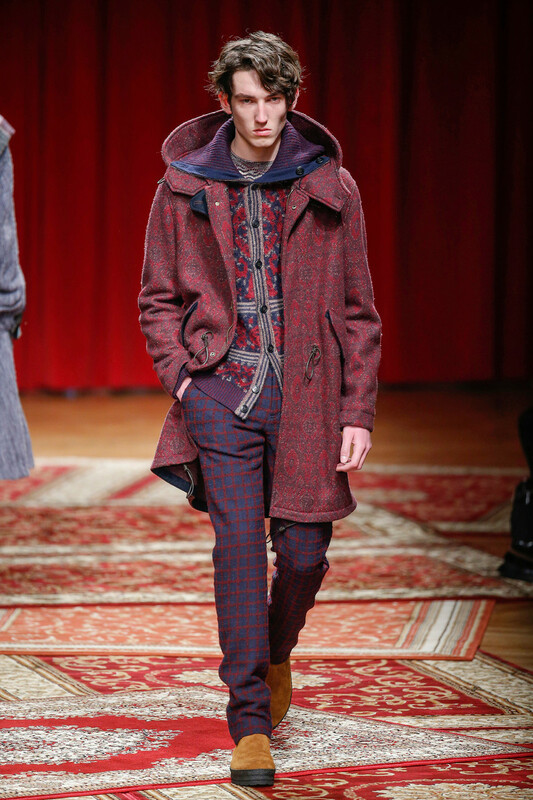 The new look for fall was also dictated by patchwork details (we saw earlier this week) which combined knits with fur. 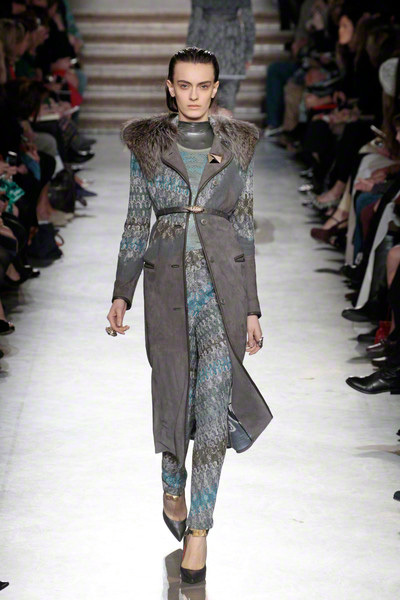 Presented in shades ranging from faded pastels tot seventies shades to different grey and turquoise tones it made up for a graceful collection. 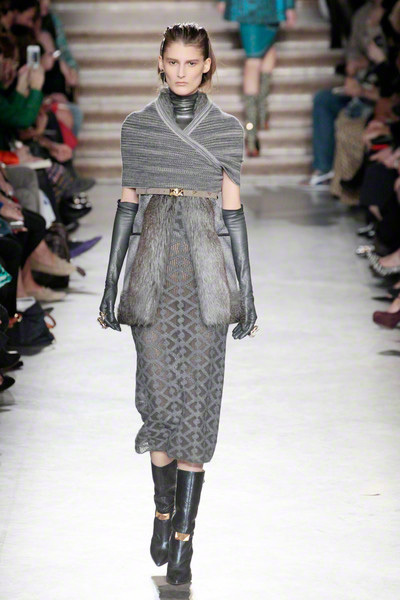 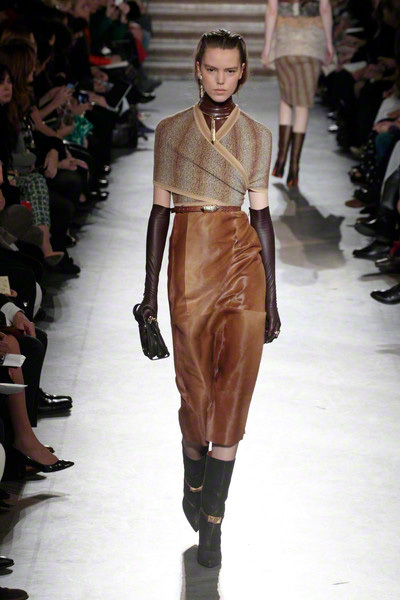 Skirts and dresses below the knee were combined with body wrap tops and long leather gloves. 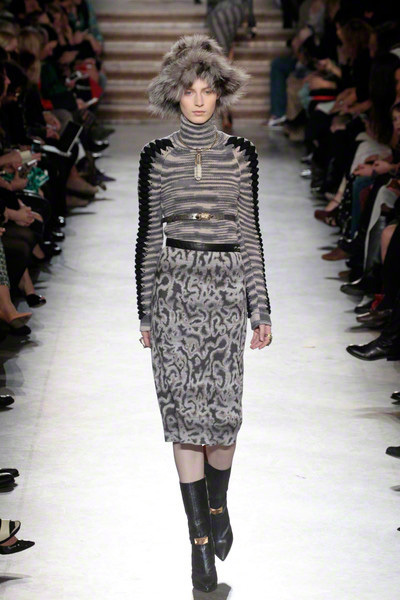 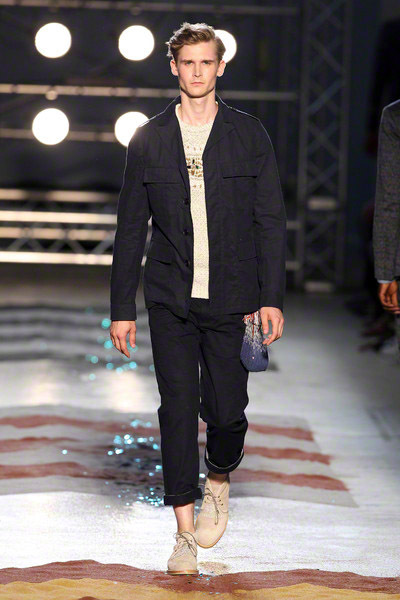 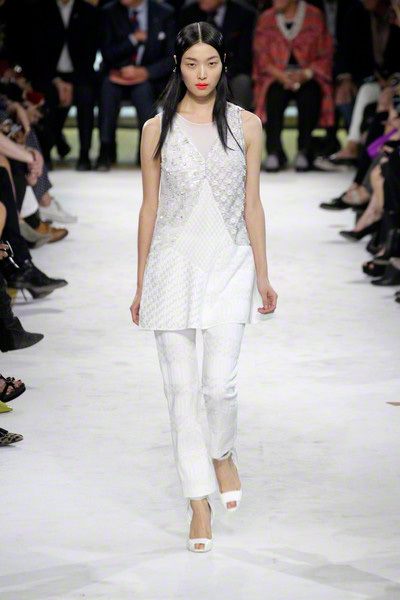 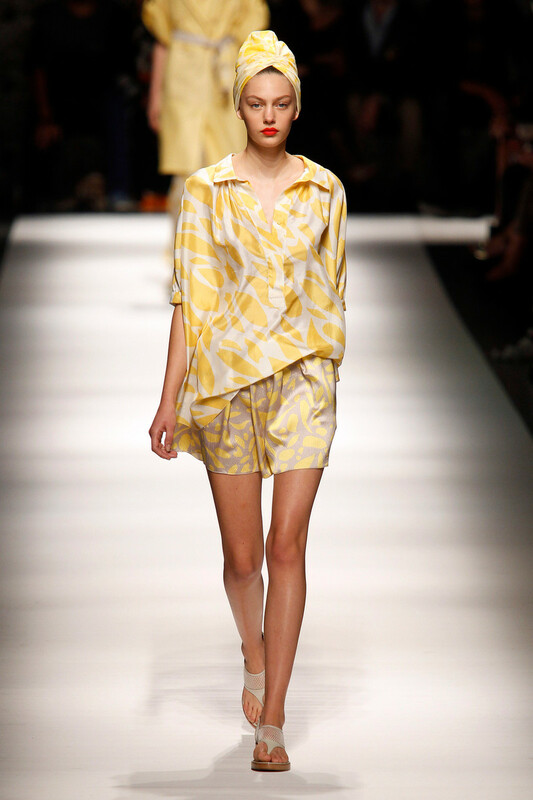 The label’s signature zigzag print had made way for lines, stain-like prints and graphical patterns. 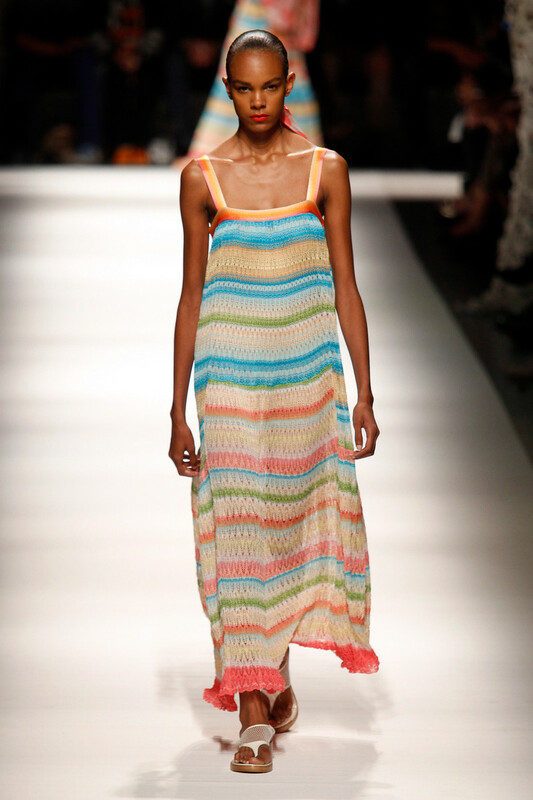 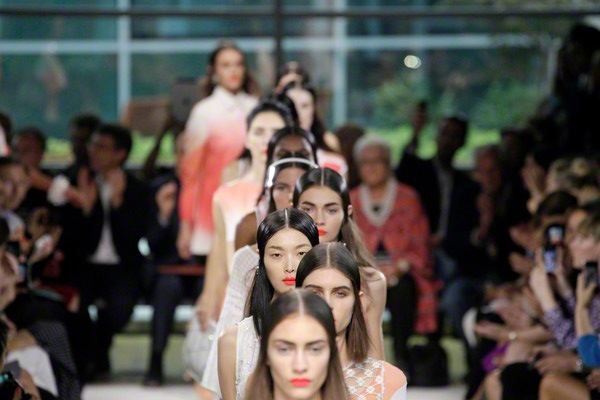 Angela showed a fresh, young collection and clearly tried to do something different this time. 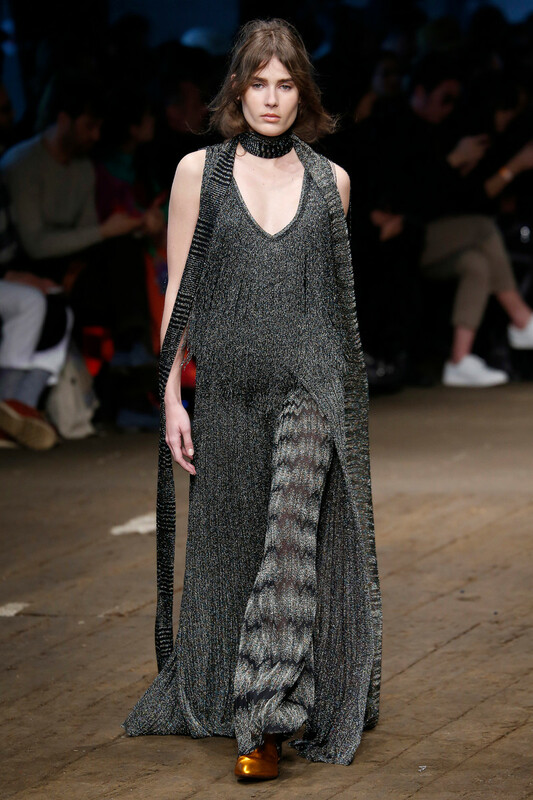 And well.., we think she succeeded.